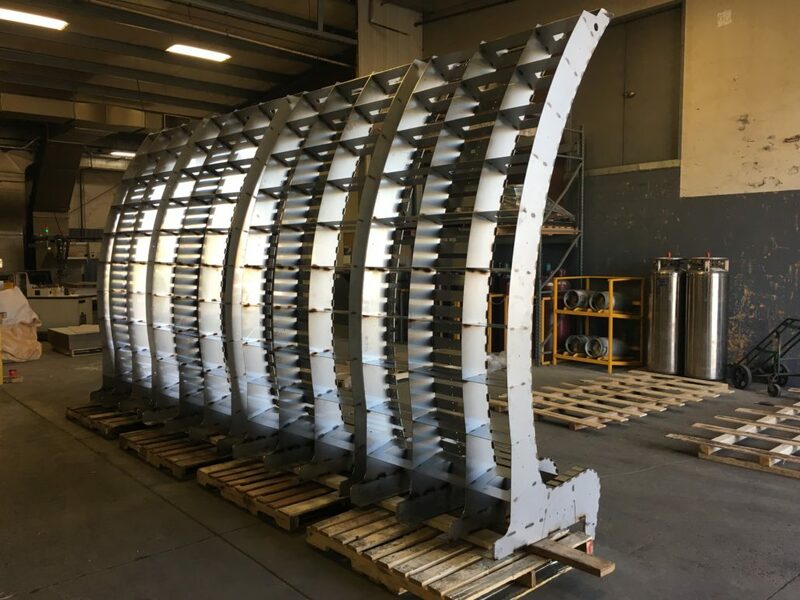 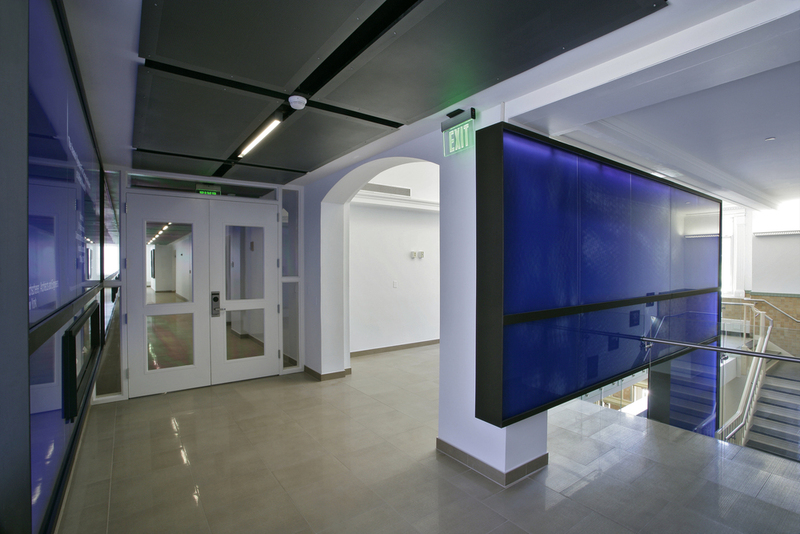 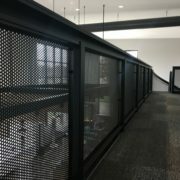 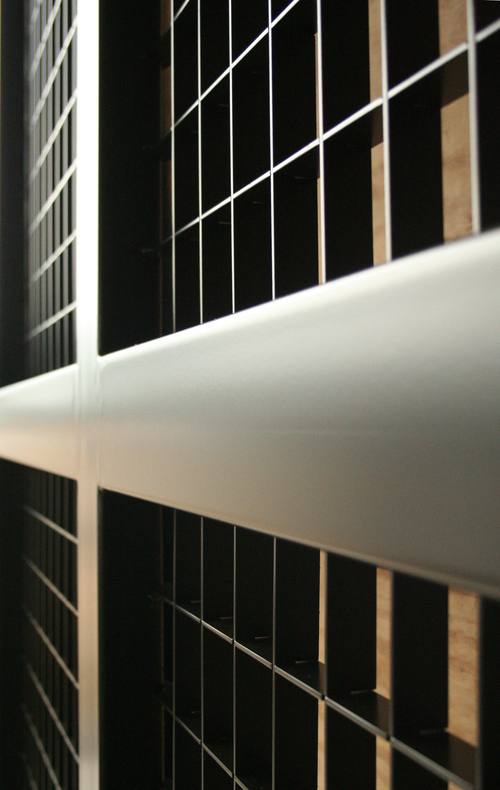 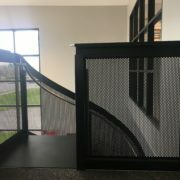 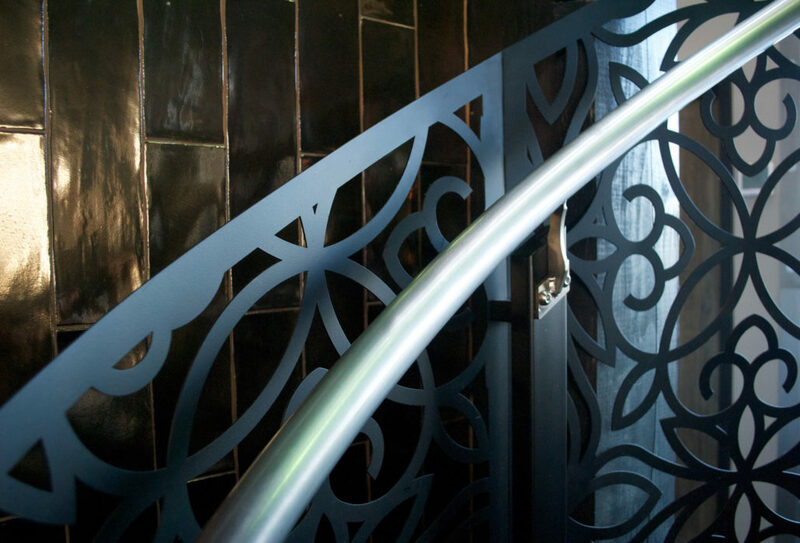 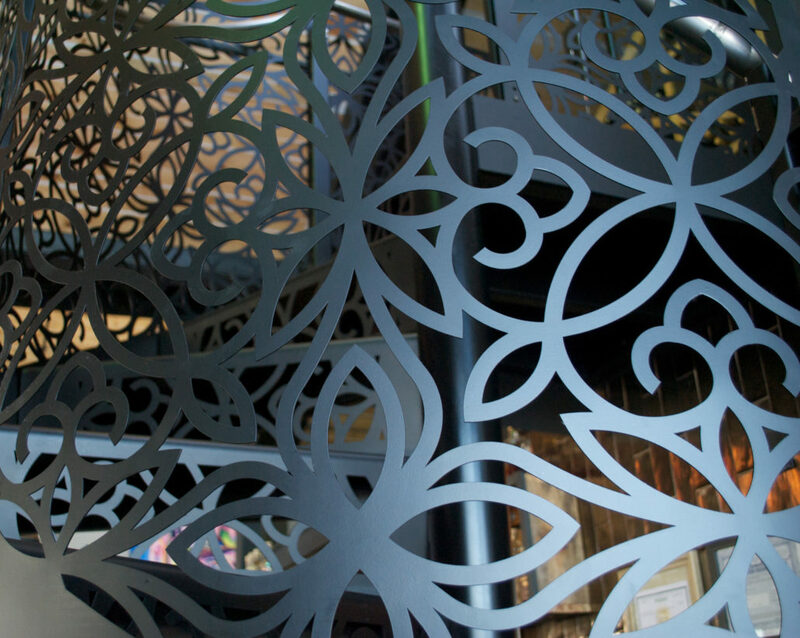 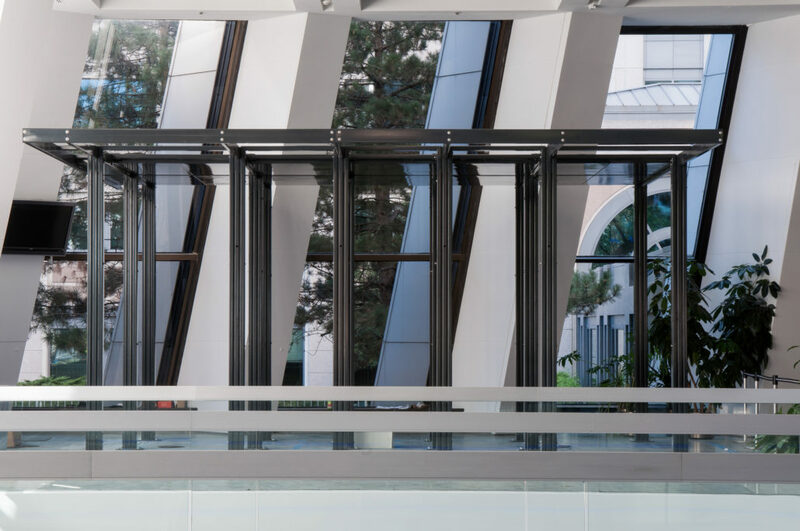 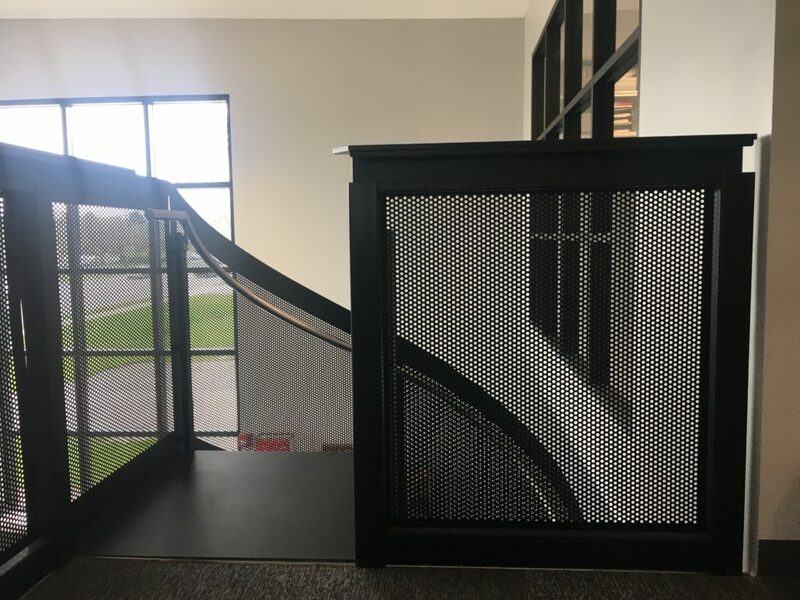 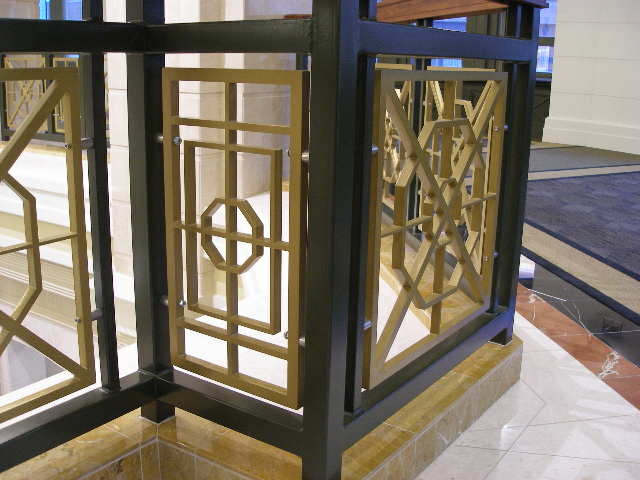 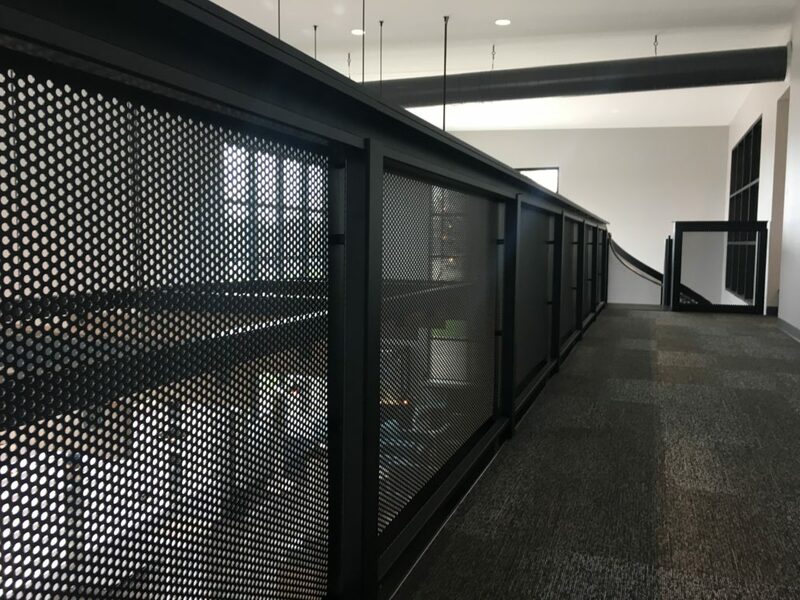 Trumpf Laser Cutting & Laser Marking Portfolio | Custom Laser Inc.
Laser-cut tube and flat steel are combined in the design of these operable gates and screens. 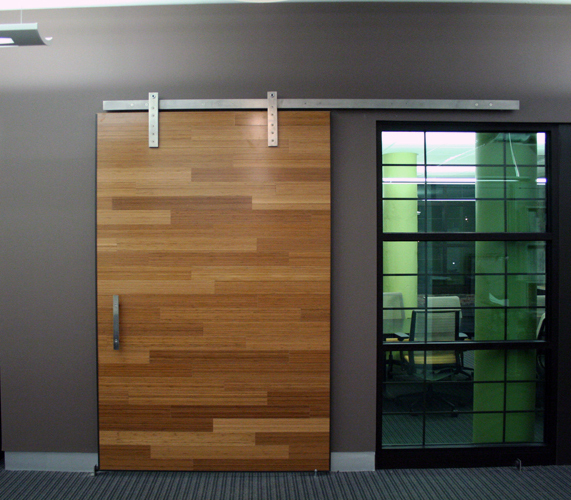 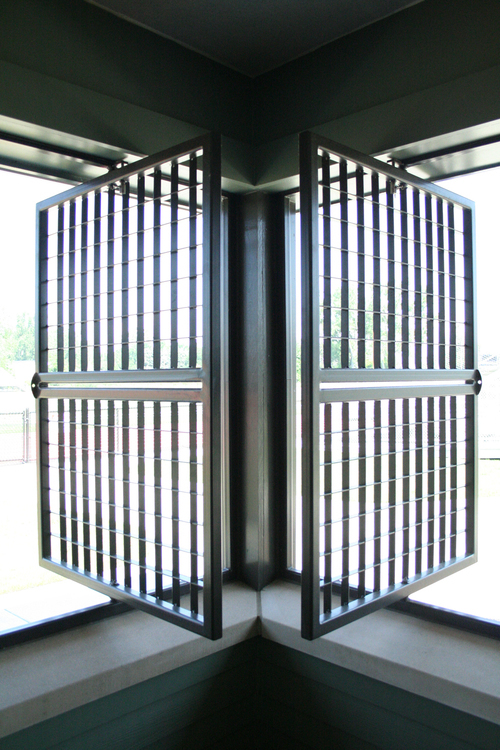 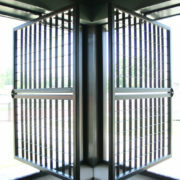 This allows an installation that provides a balance between maximum security during the off hours and a feeling of openness during events. 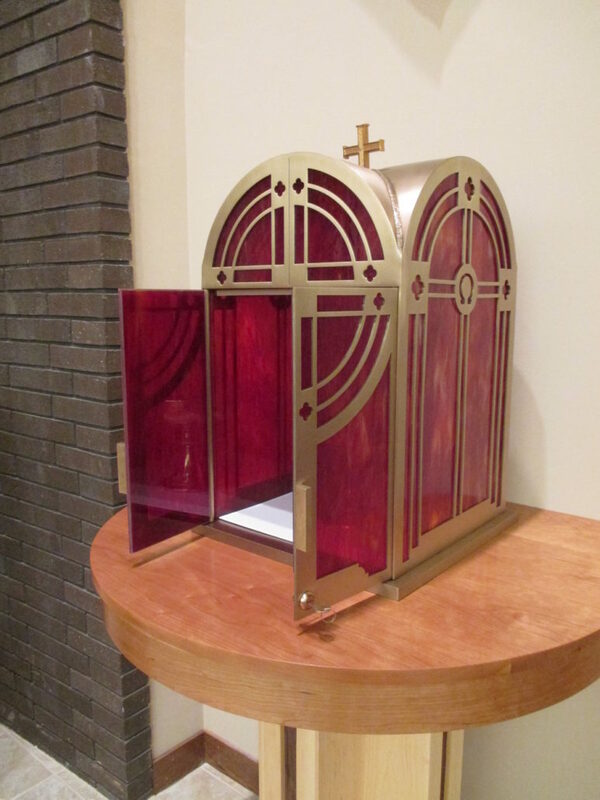 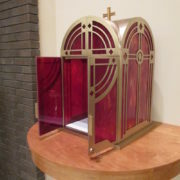 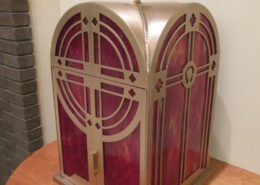 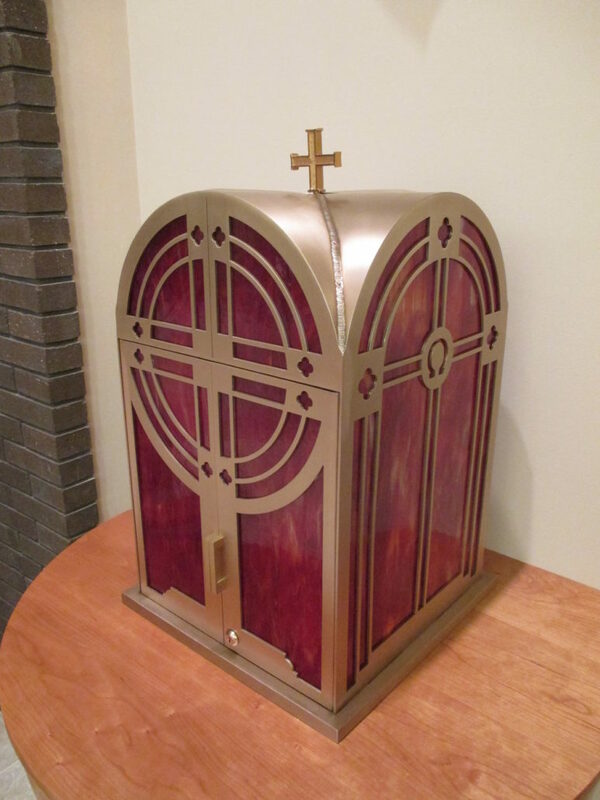 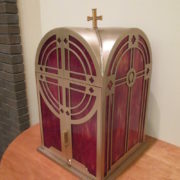 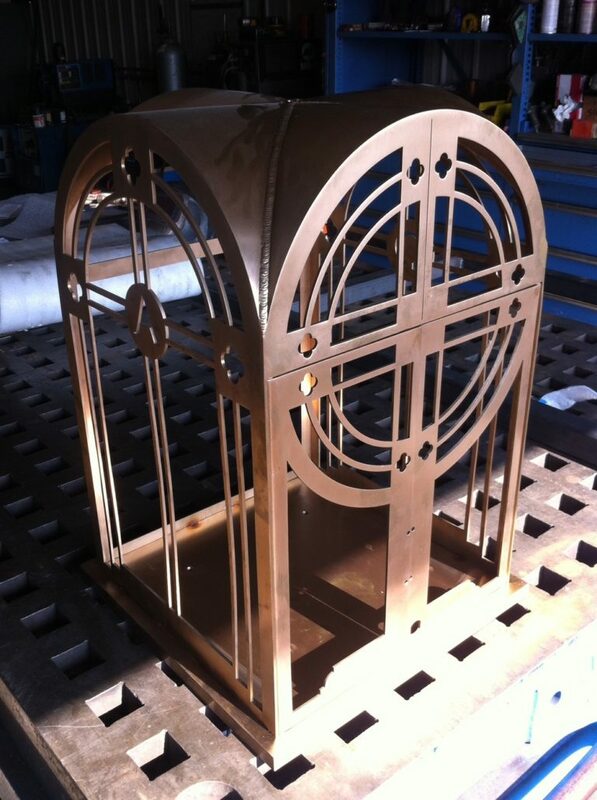 Constructed from 1/8″ waterjet cut silicone bronze, this double-vaulted tabernacle was fabricated to the tolerances and specifications – in terms of design and security – laid out by the Papal Council. 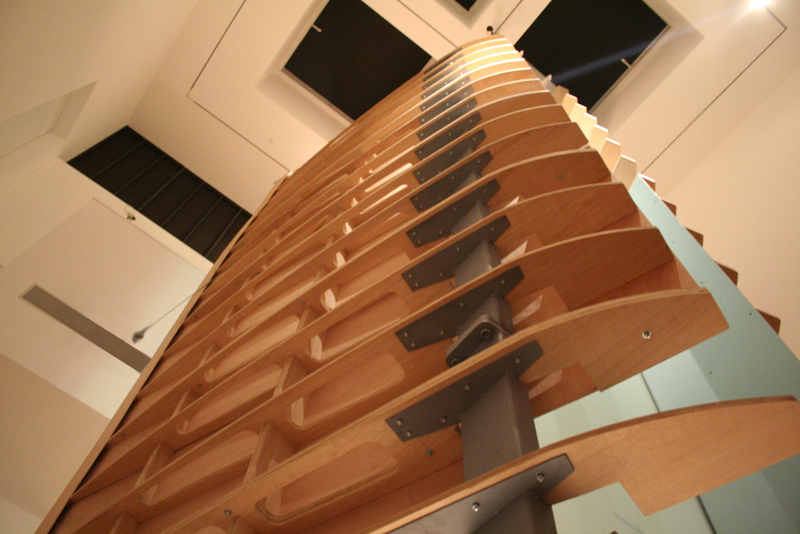 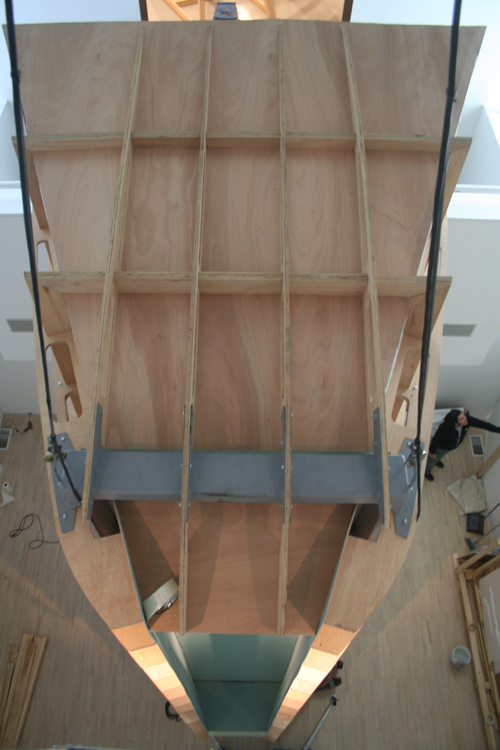 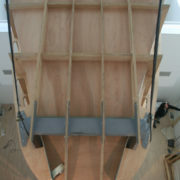 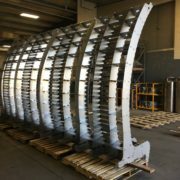 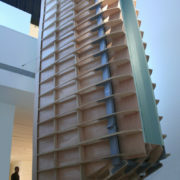 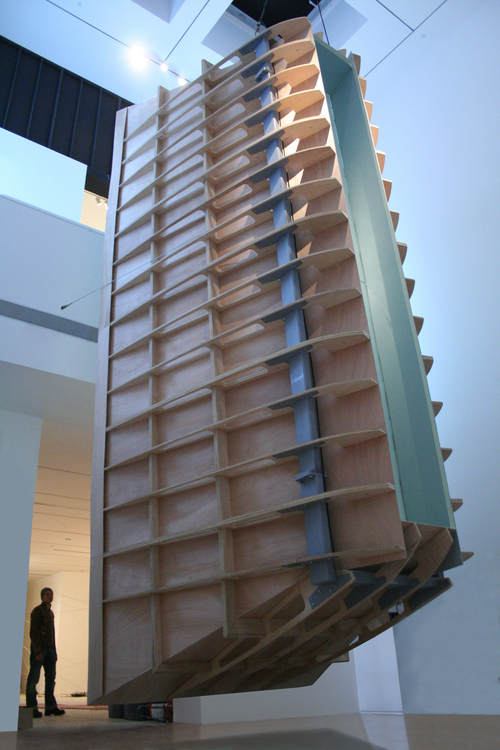 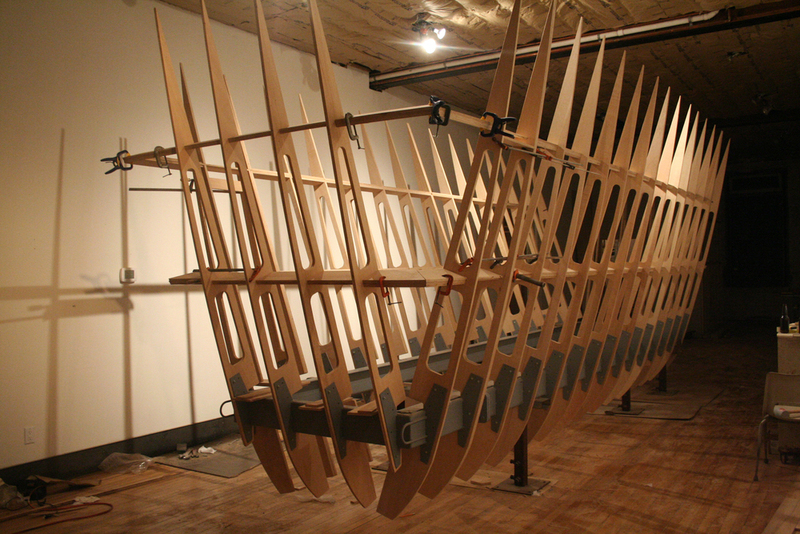 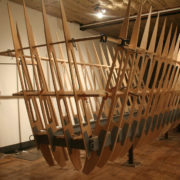 The structure of the installation is composed of a plywood fin and rib system, skinned with luon and supported by a tube steel frame. 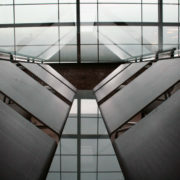 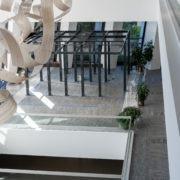 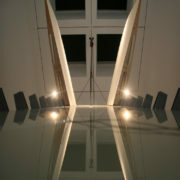 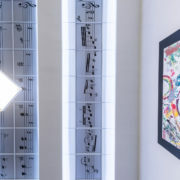 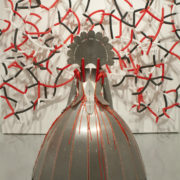 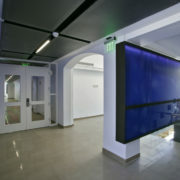 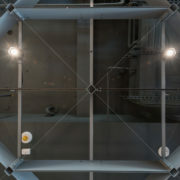 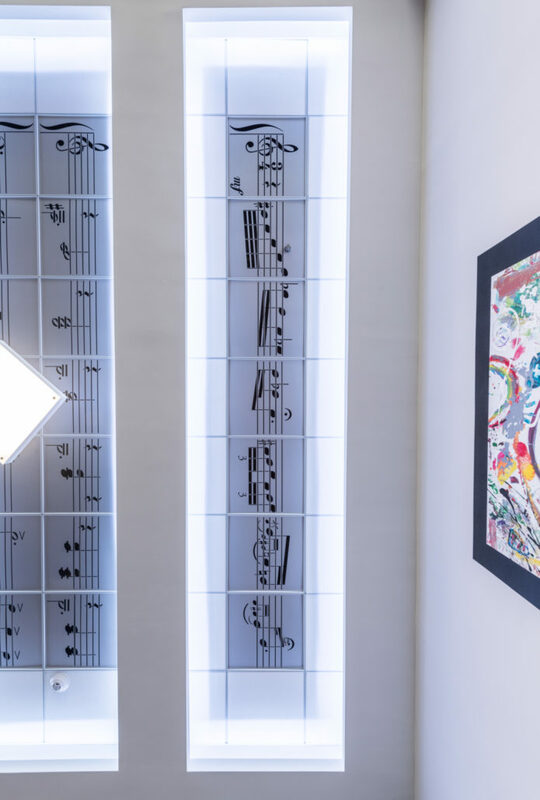 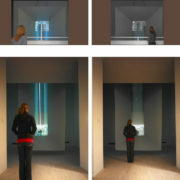 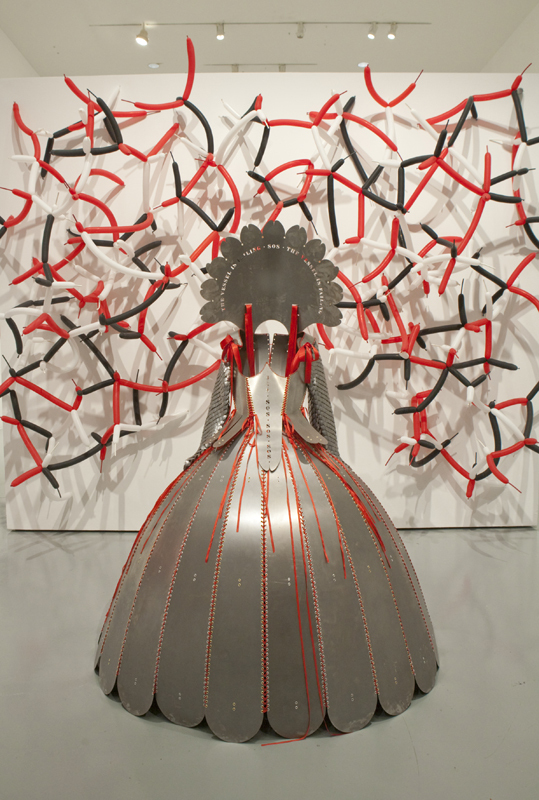 It is hung from the center of the lightwell space in the gallery. 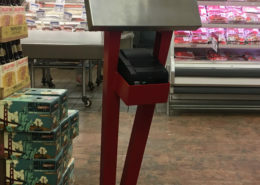 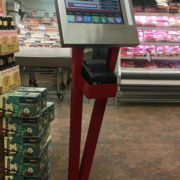 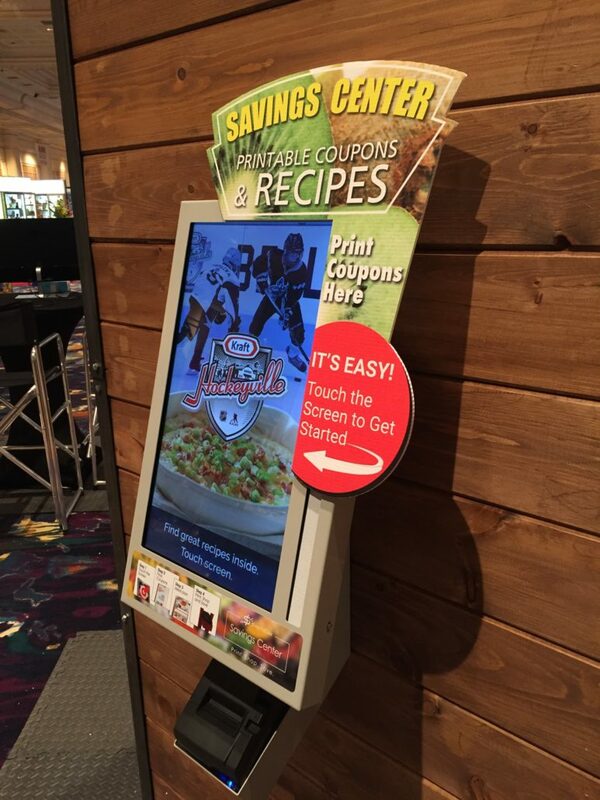 As one of Custom Laser’s first products, the grocery store kiosk was designed and developed to house a touchscreen monitor while creating a minimal store footprint. 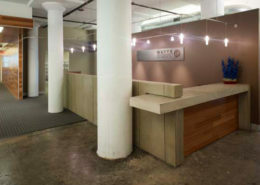 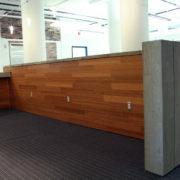 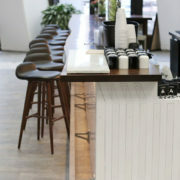 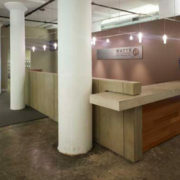 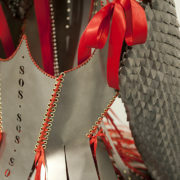 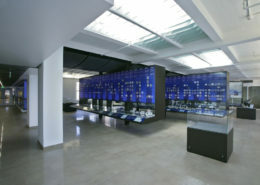 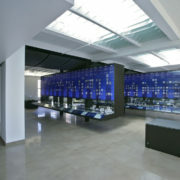 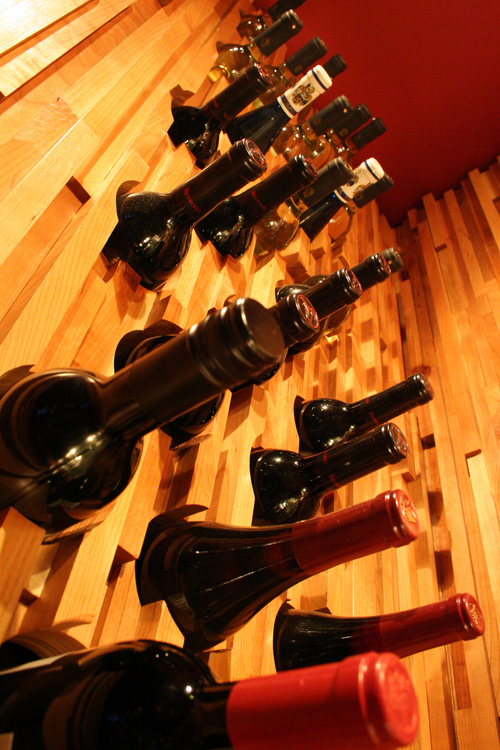 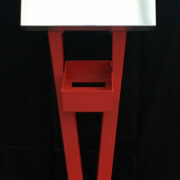 The floor model design followed with an adjustable wall mount unit to give the store owner additional display options. 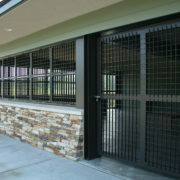 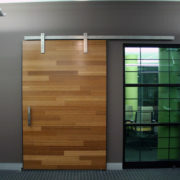 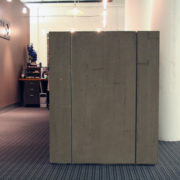 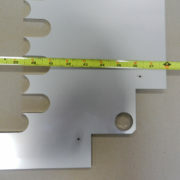 Both of the units are produced turn-key and delivered to the client. 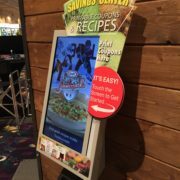 The proprietary software at each kiosk allows the user to choose a recipe and print out the ingredients needed within the store. 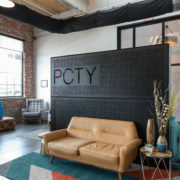 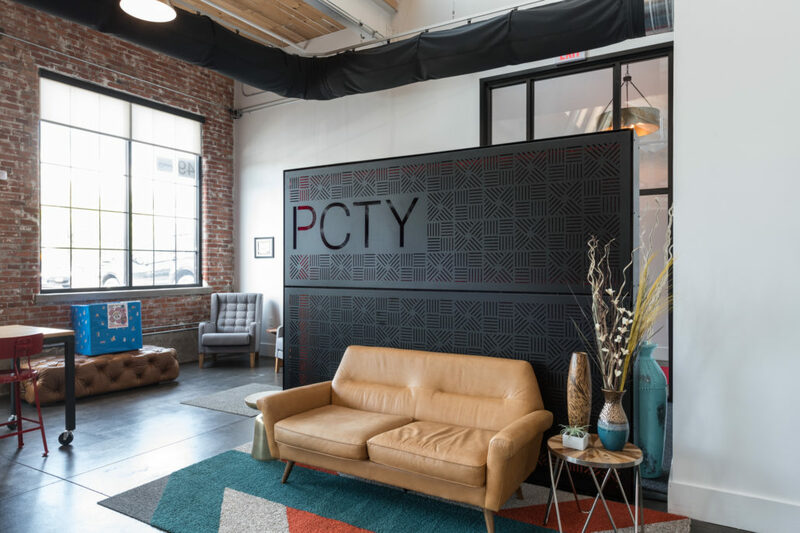 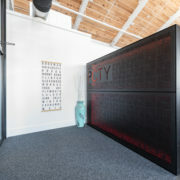 The construction of this sign has the dual function of serving as the signage for the company as well as as providing a visual barrier between exposed corridor at the entrance and the open plan office environment beyond. 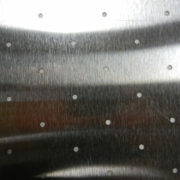 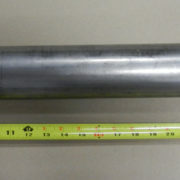 Four equally spaced, laser perforated and formed 16 gauge steel pans appear to be held in suspension by an 11 ga border around the perimeter. 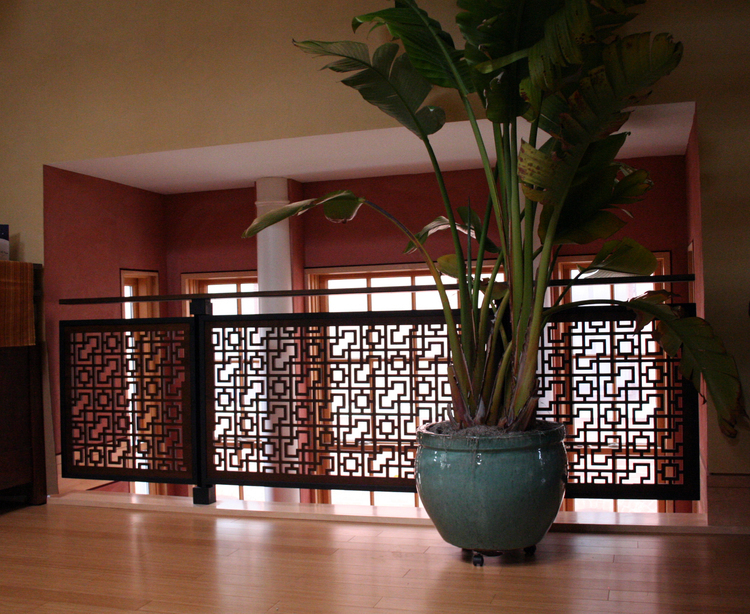 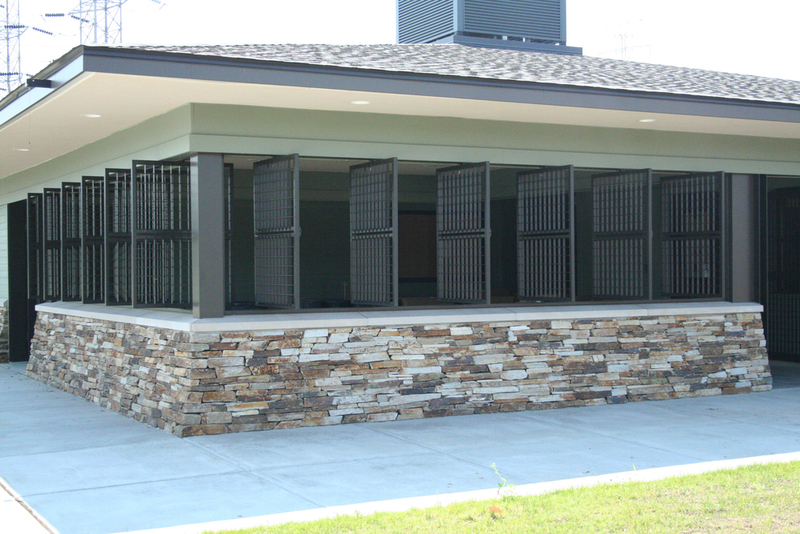 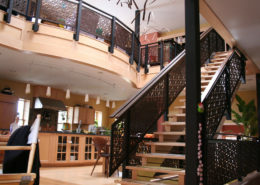 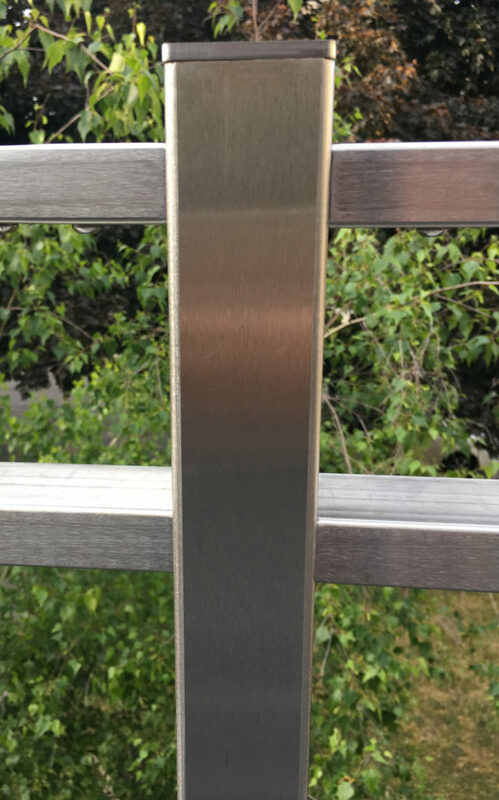 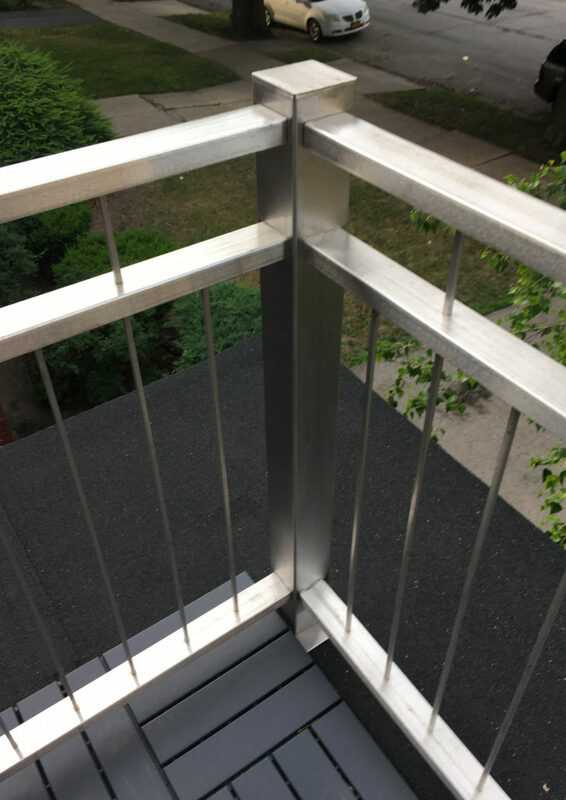 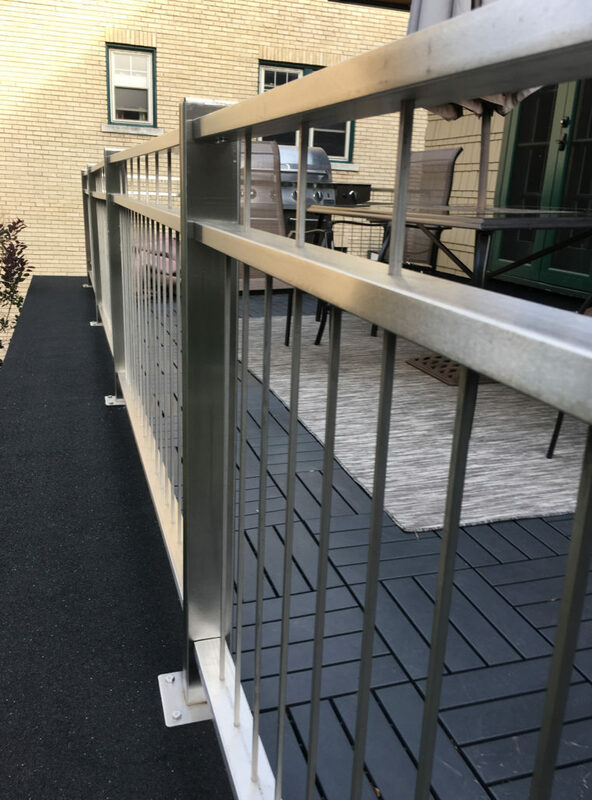 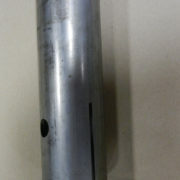 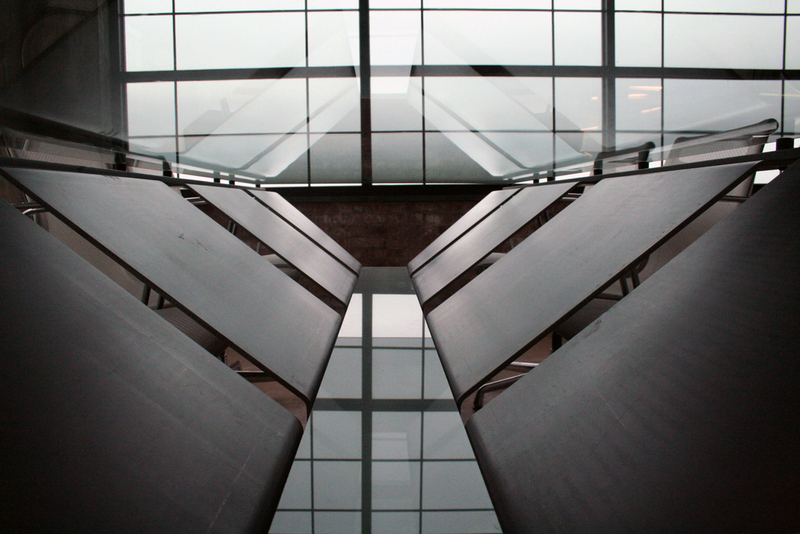 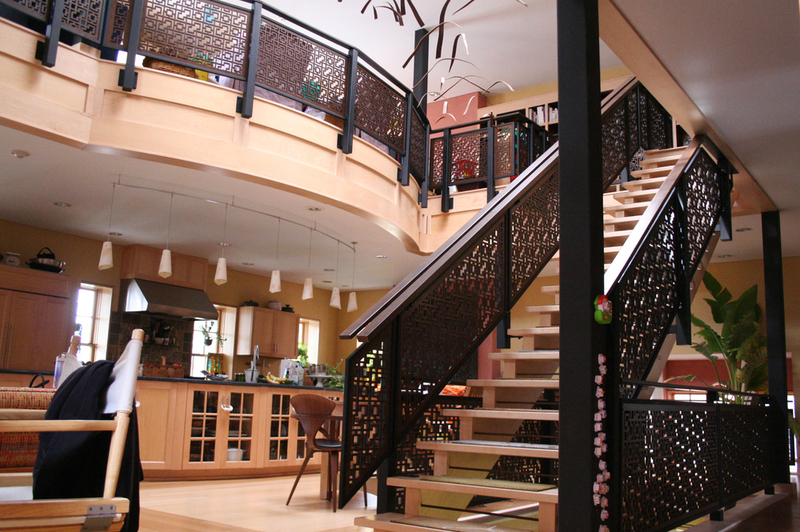 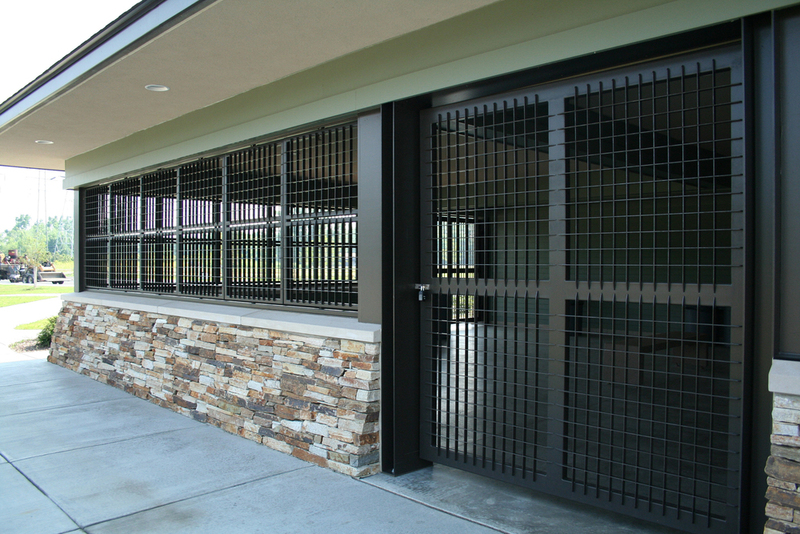 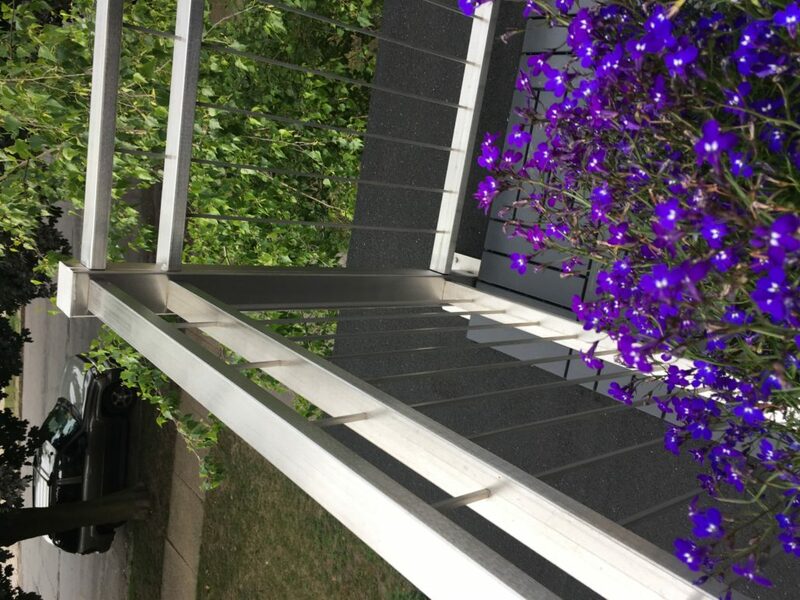 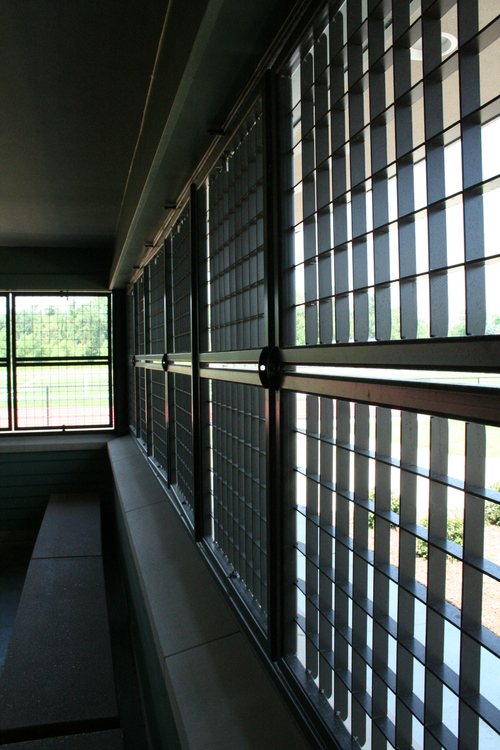 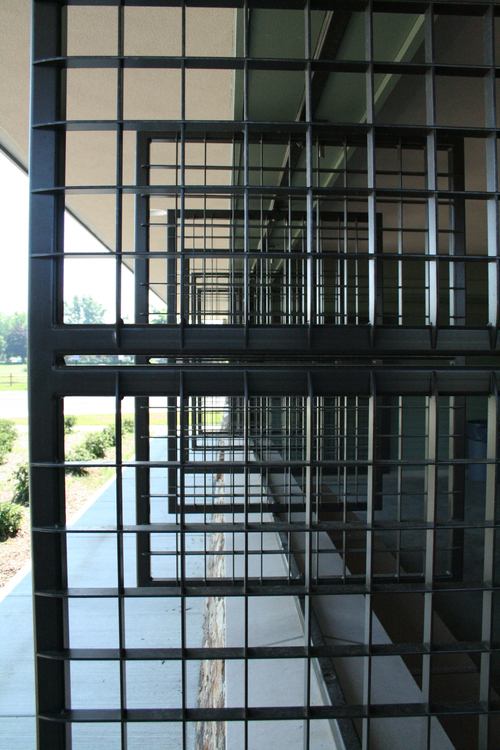 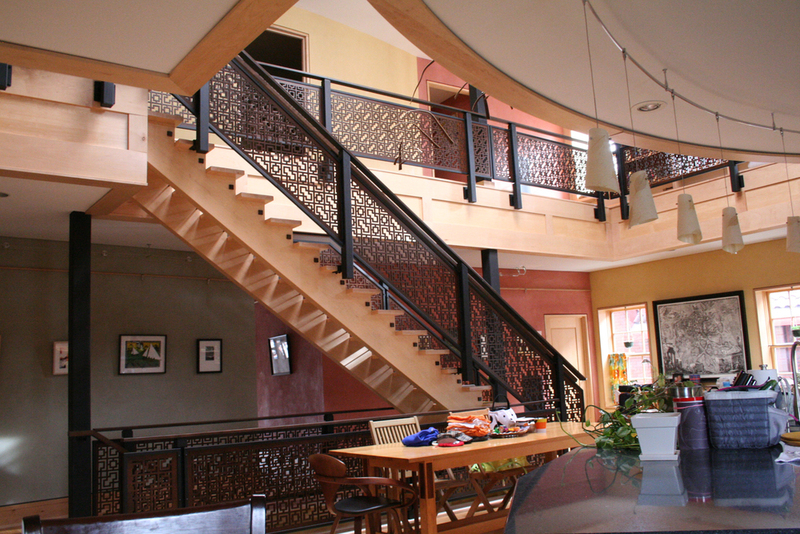 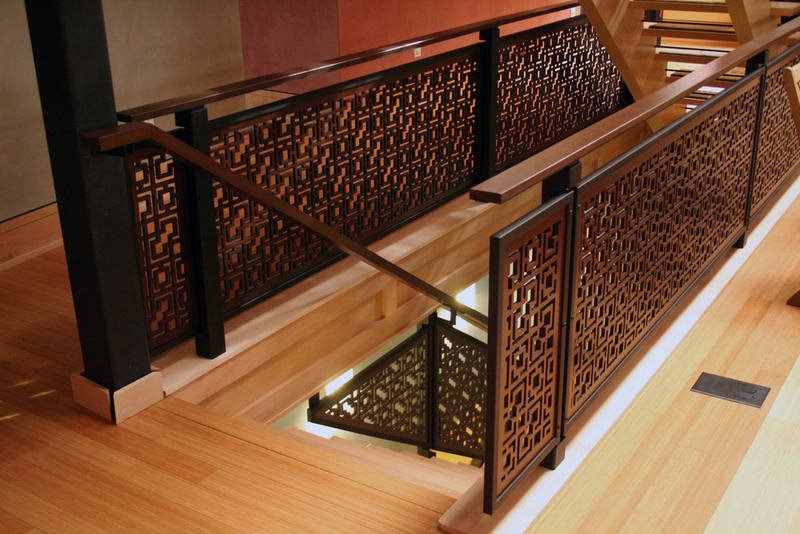 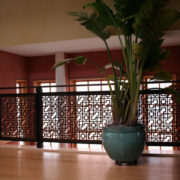 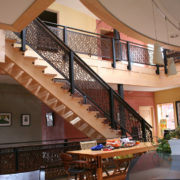 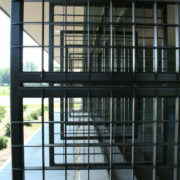 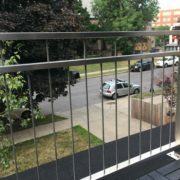 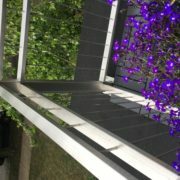 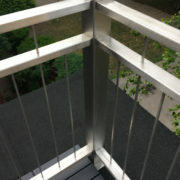 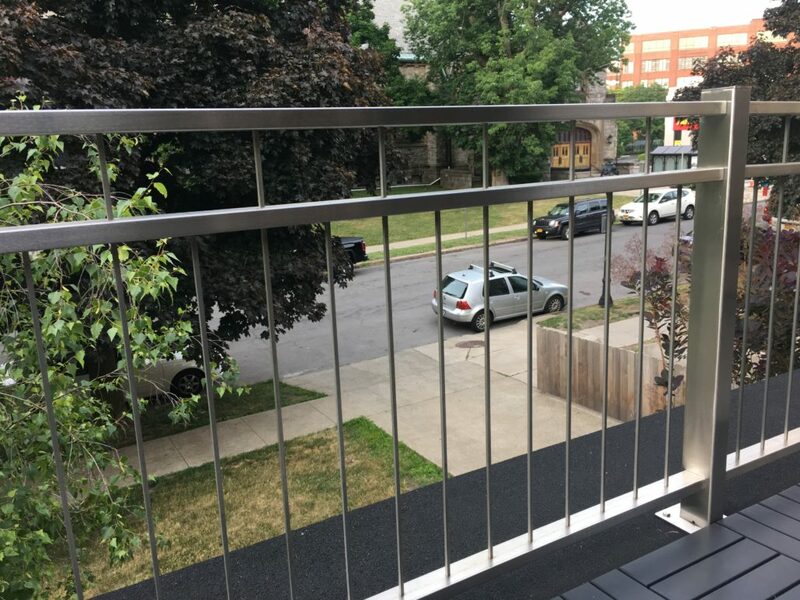 The 1/4″ square holes in 2×1 stainless tube accept 1/4″ square stainless bar to form the sections of railing. 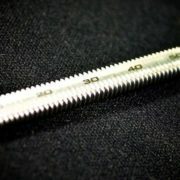 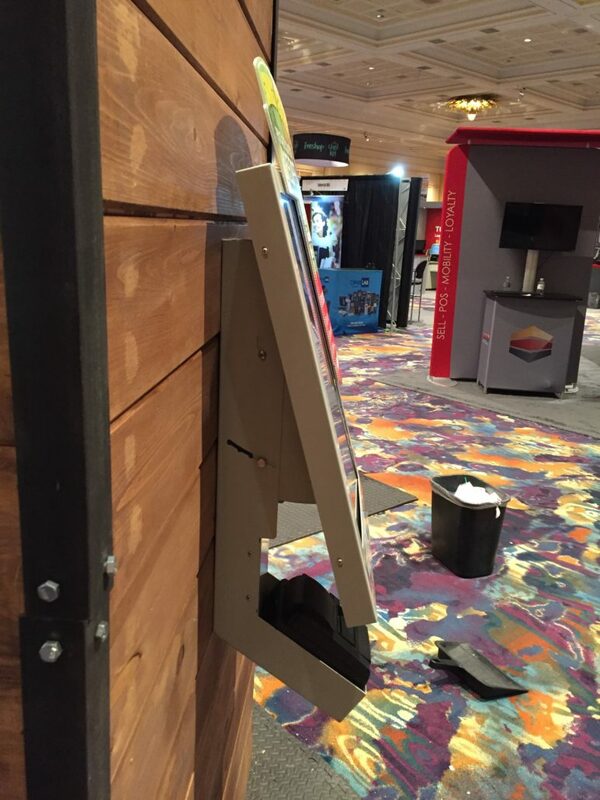 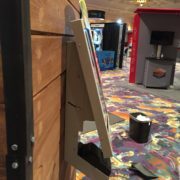 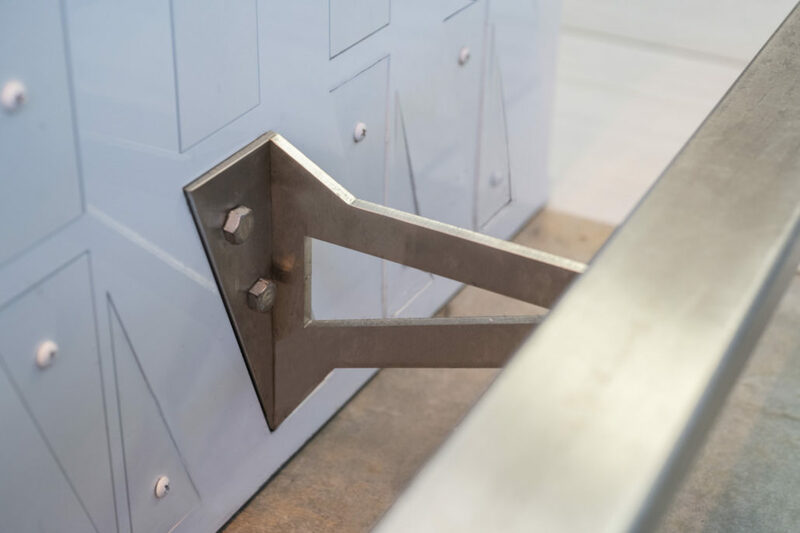 Hidden brackets that slide through laser cut slots in the 3″ square support posts allow for fasteners to be hidden creating a weld free aesthetic. 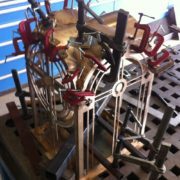 All components received a #4 finish. 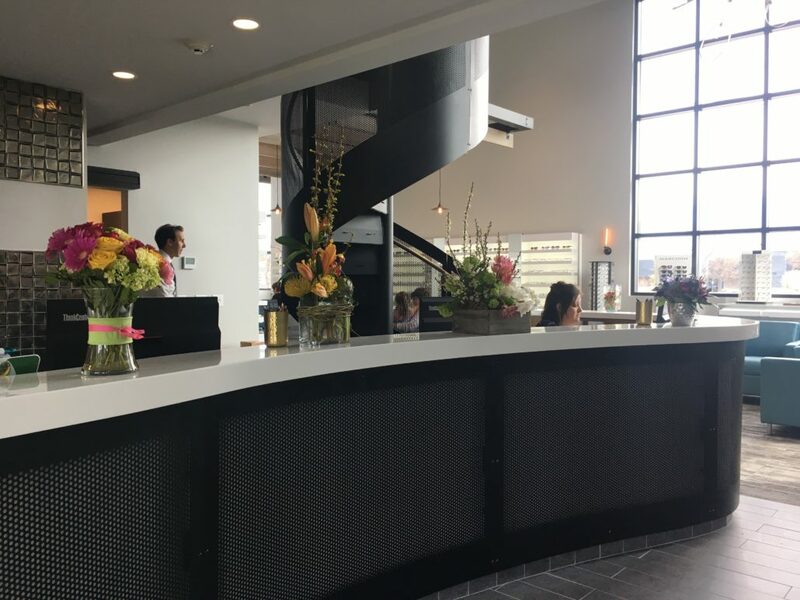 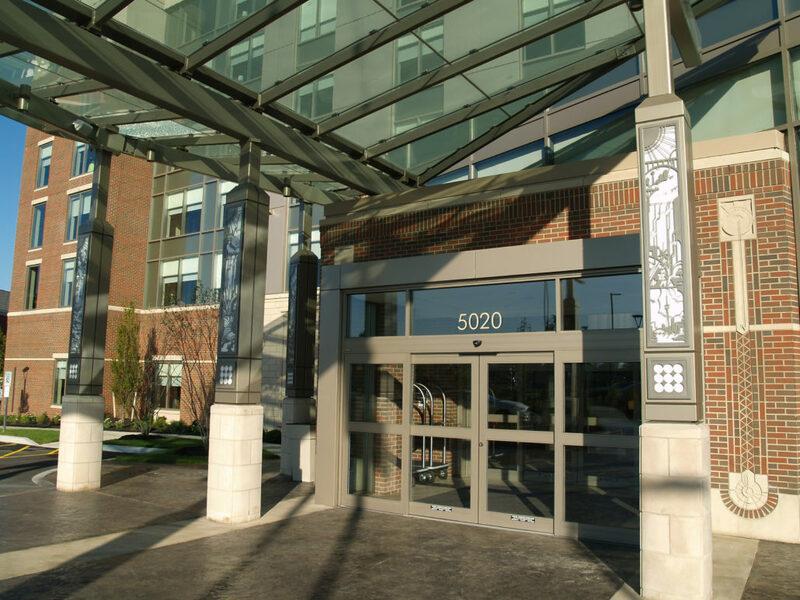 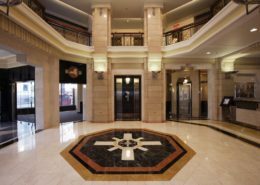 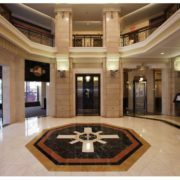 Partnering with Iskalo Development, Custom Laser was given the opportunity to make a great first impression at this beautiful hotel. 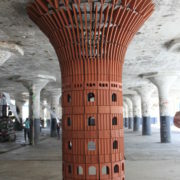 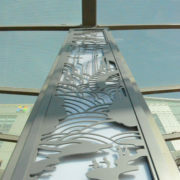 Each column of this canopy was carefully detailed to depict the culture of Western New York. 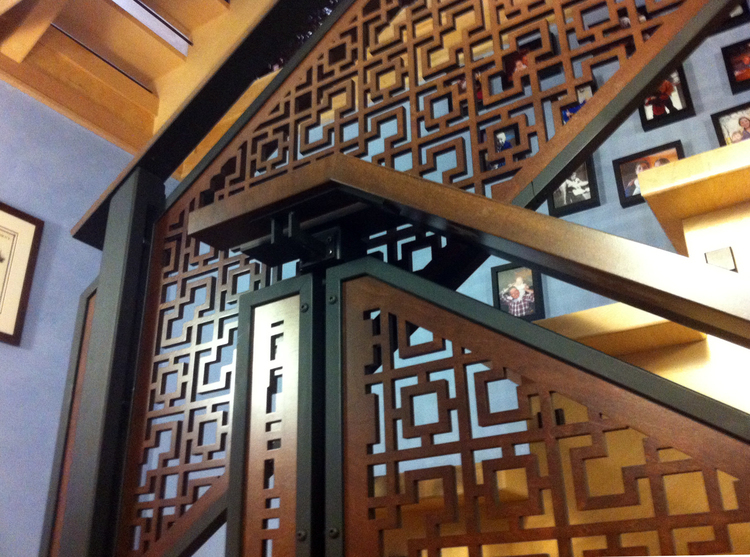 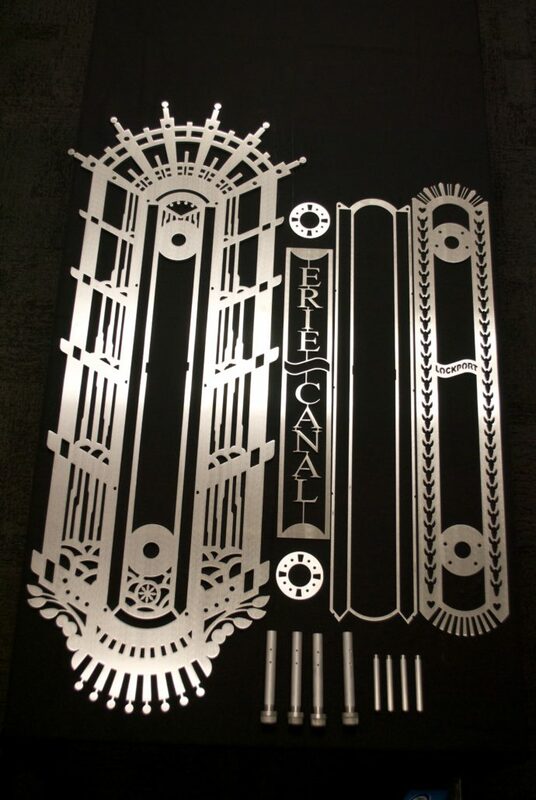 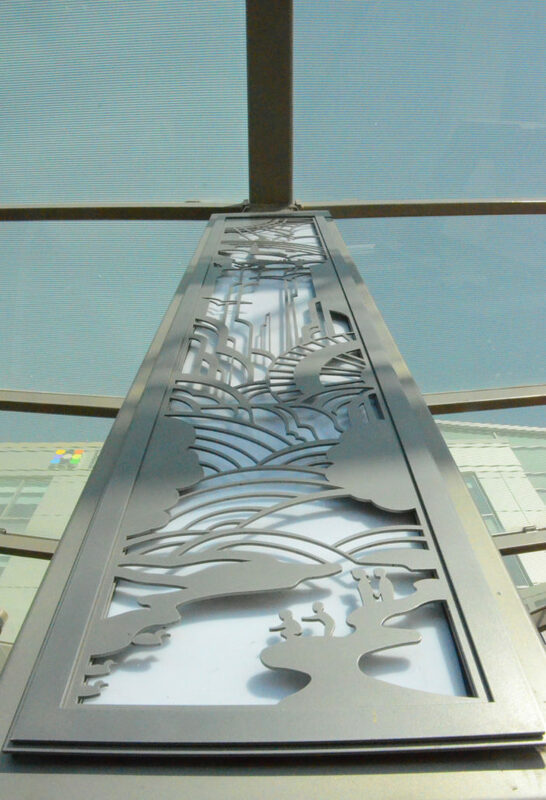 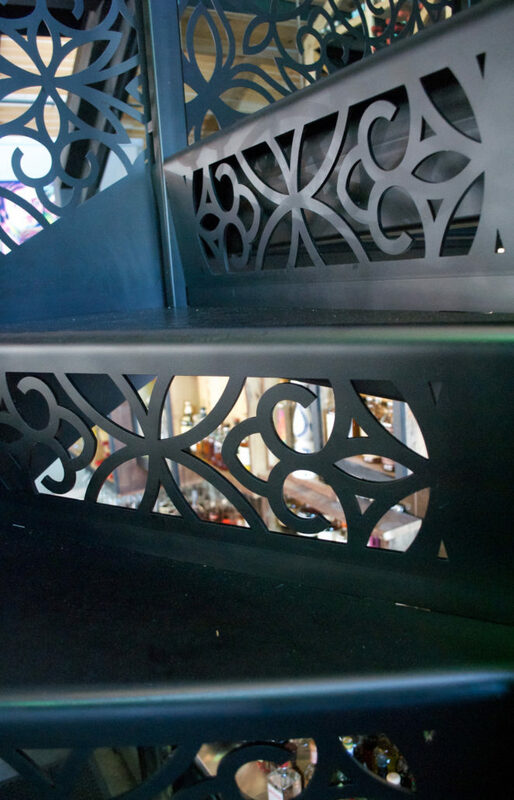 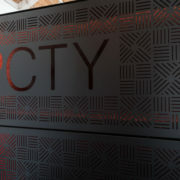 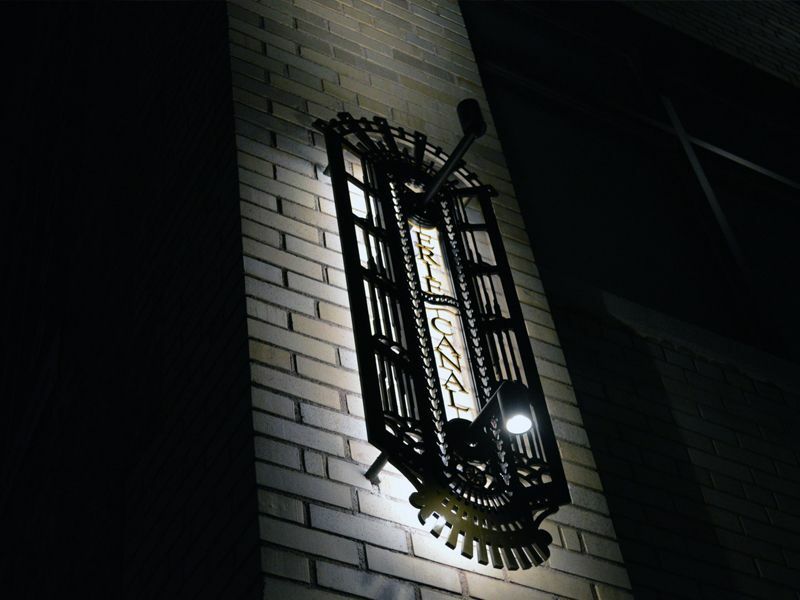 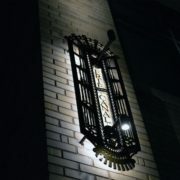 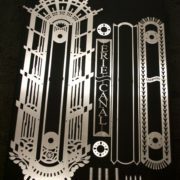 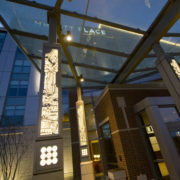 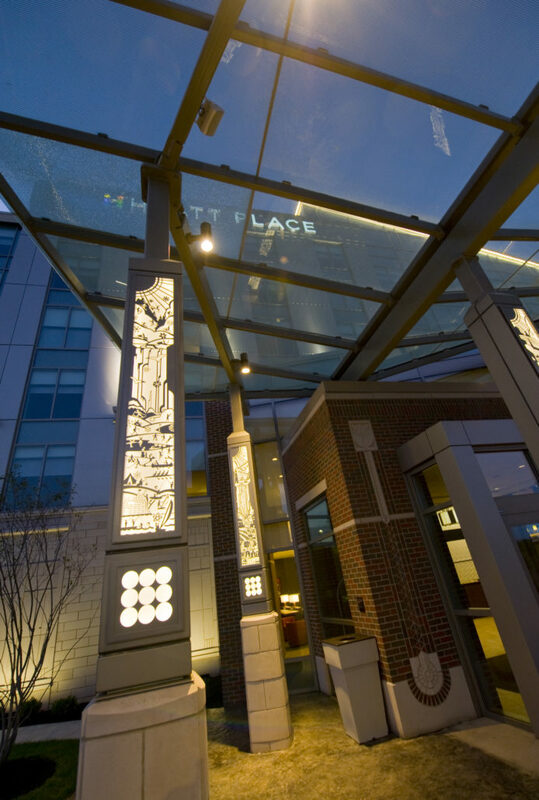 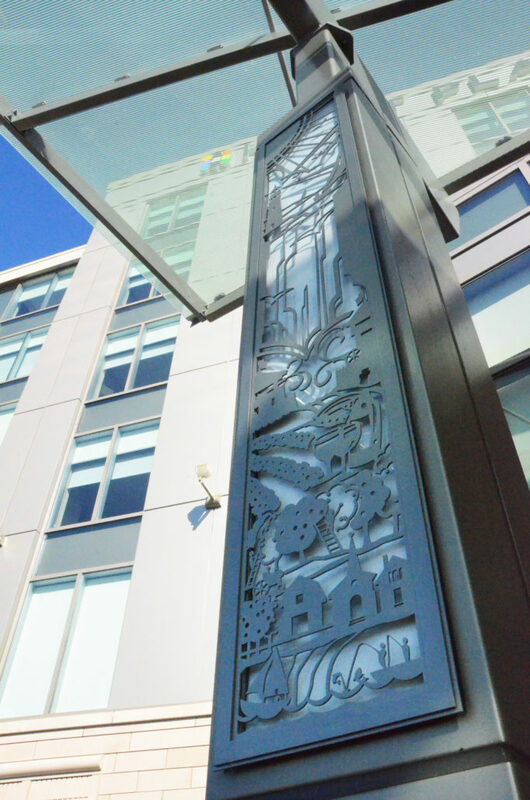 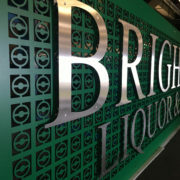 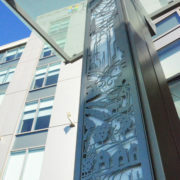 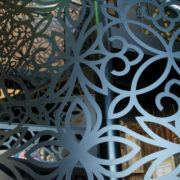 Laser cut from 1/8″ aluminum, powder coated and backlit, each unique column exudes an attention to detail. 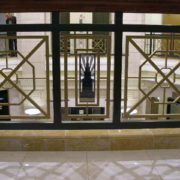 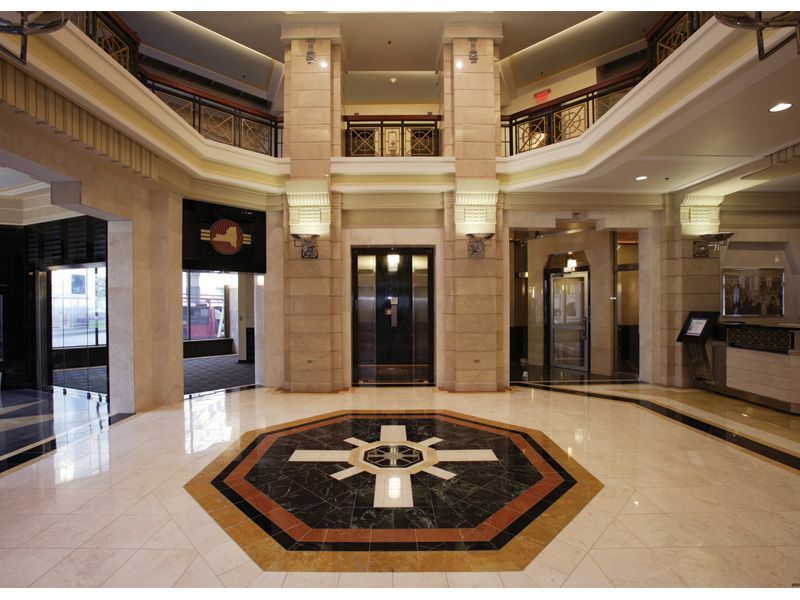 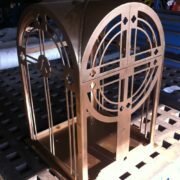 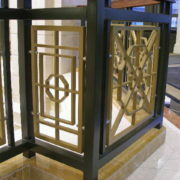 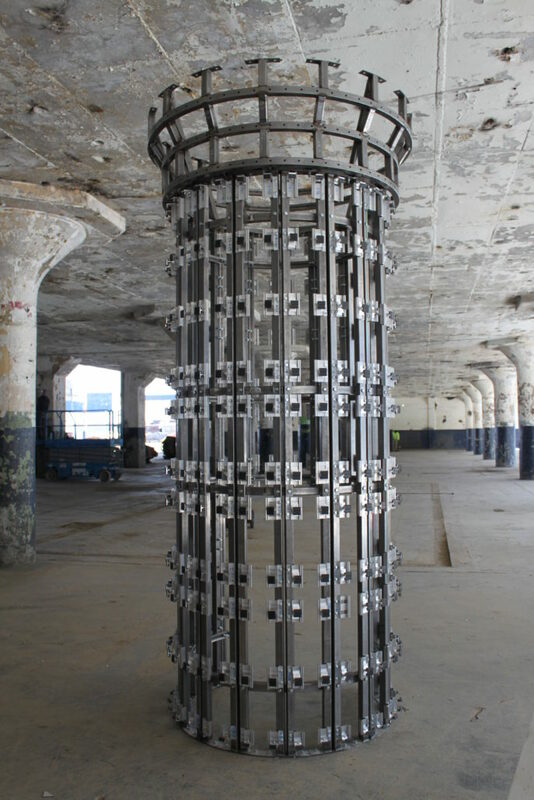 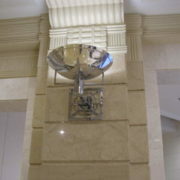 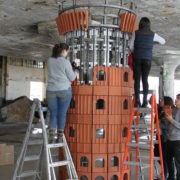 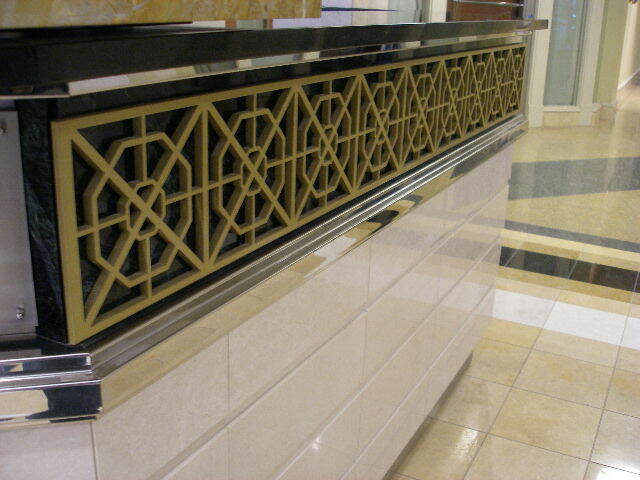 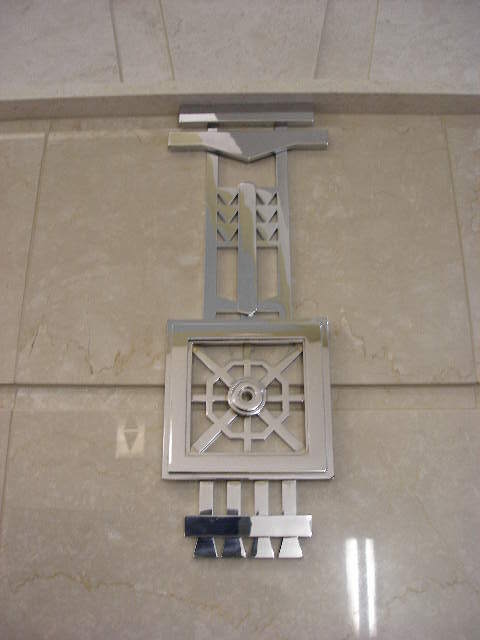 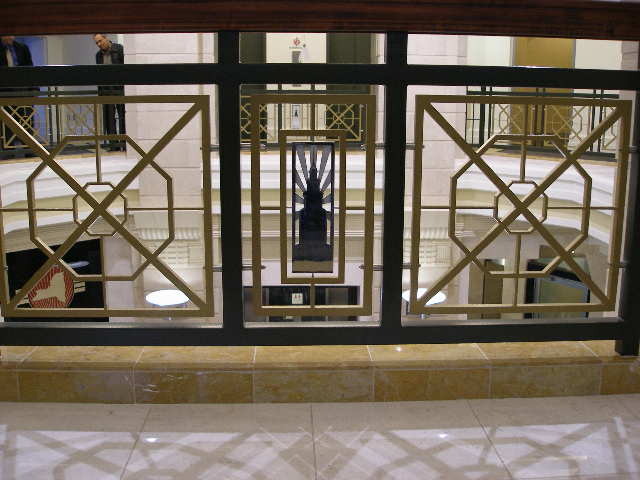 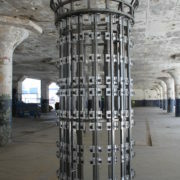 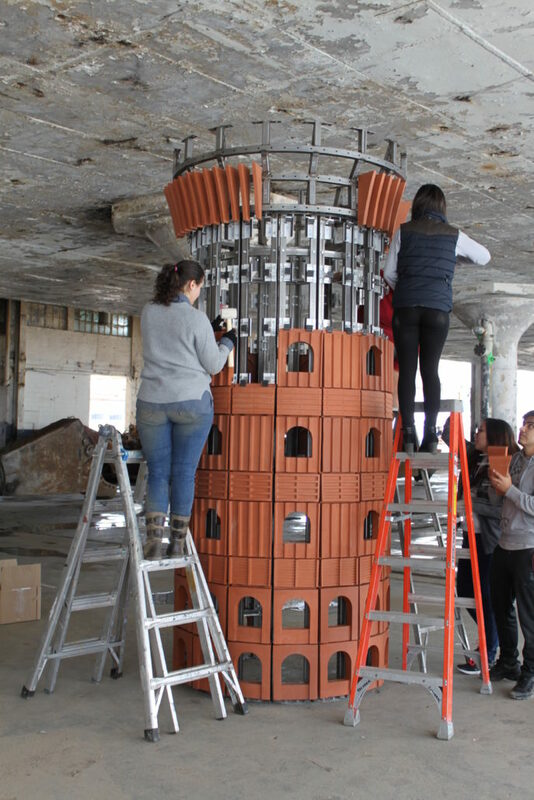 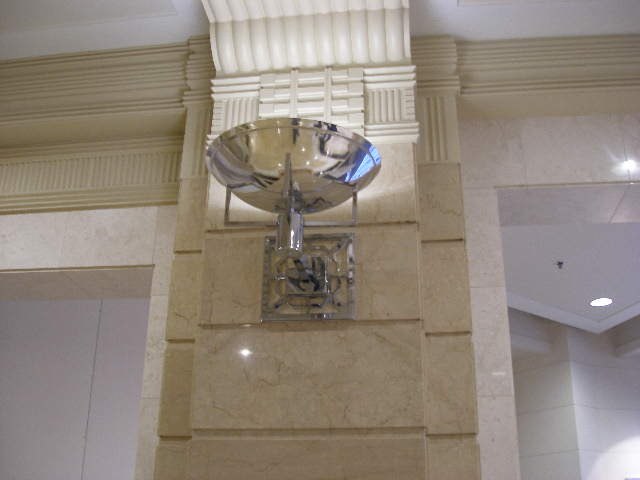 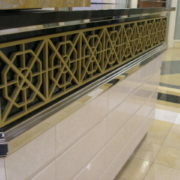 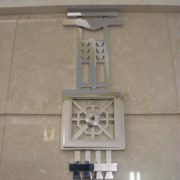 Ornamental architectural elements, ranging from 3/4″ aluminum replica railing infill and decorative pieces to the interlocking stainless and marble floor medallion, were made to complete the restoration of the Electric Tower interior, a significant architectural landmark in the city of Buffalo. 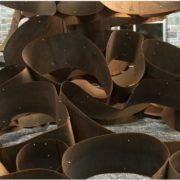 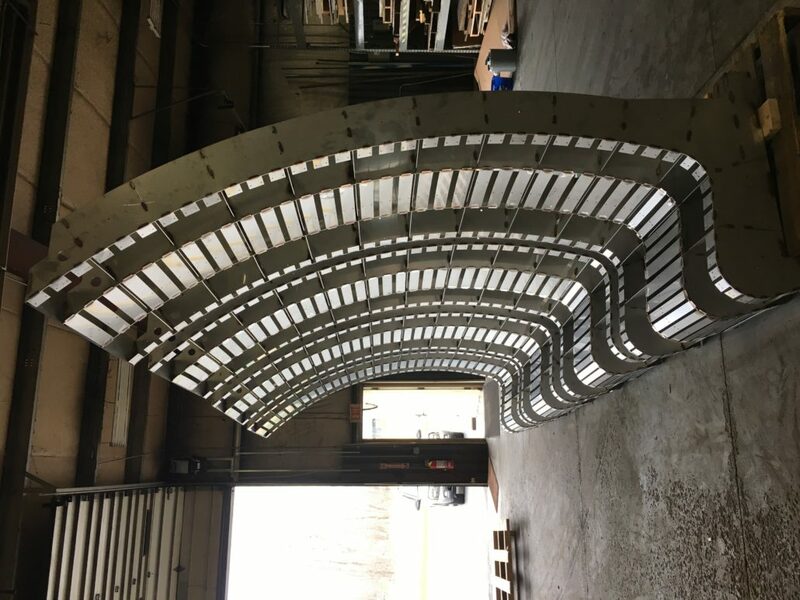 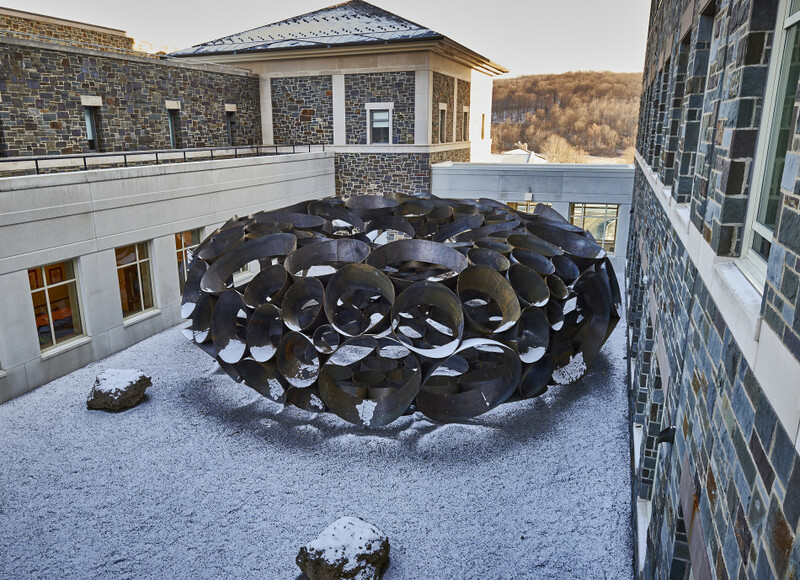 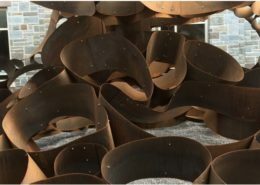 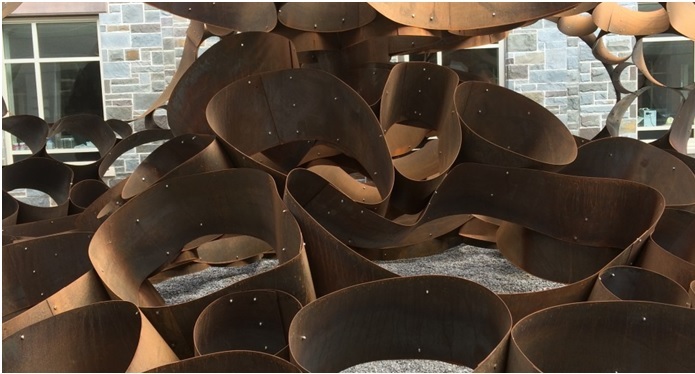 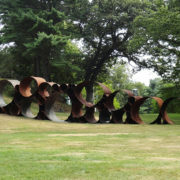 For many years, Custom Laser has been the source of laser cutting for Dewitt Godfrey, an American sculptor best known for his large abstract constructions of banded steel installed in public sites. 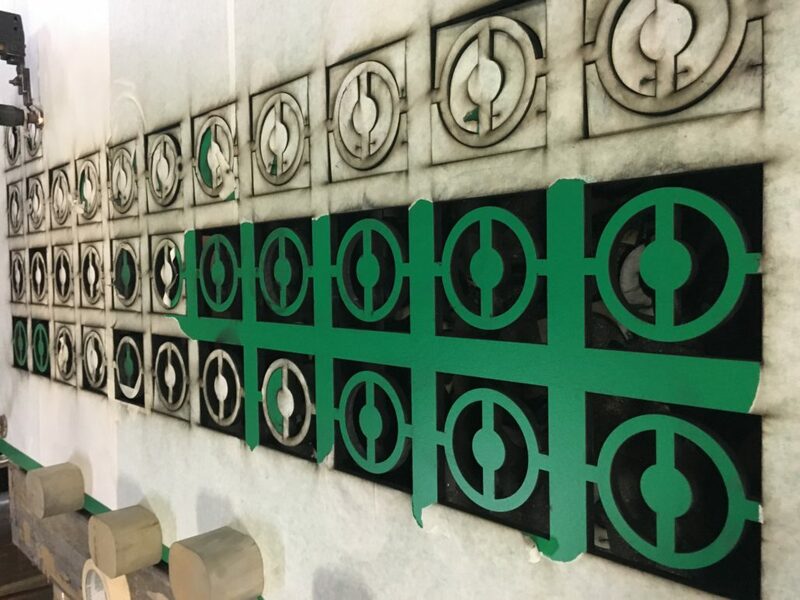 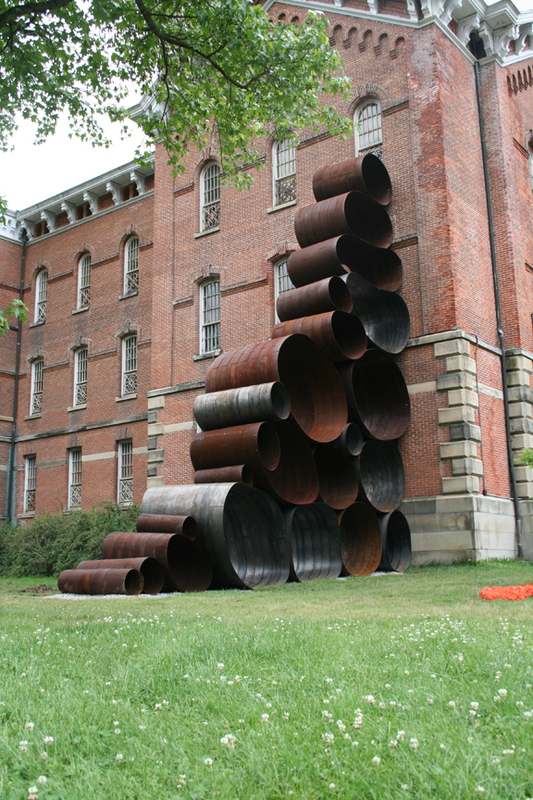 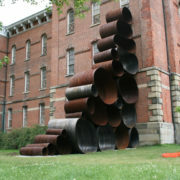 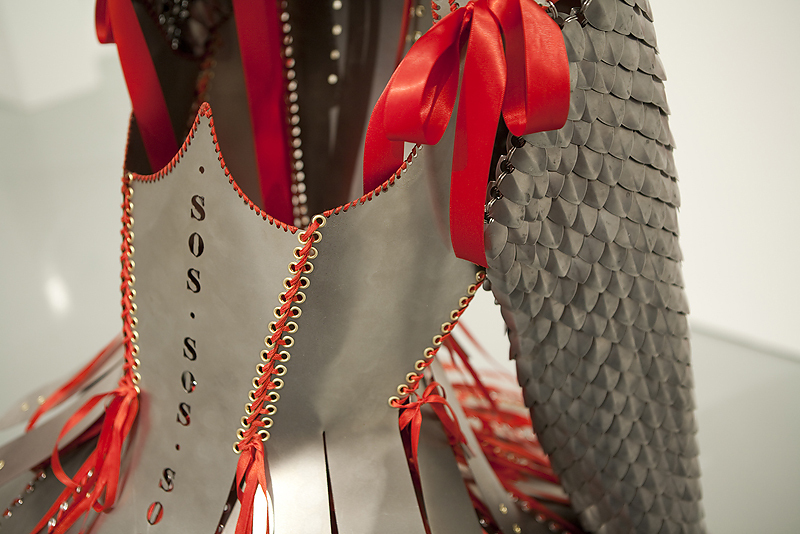 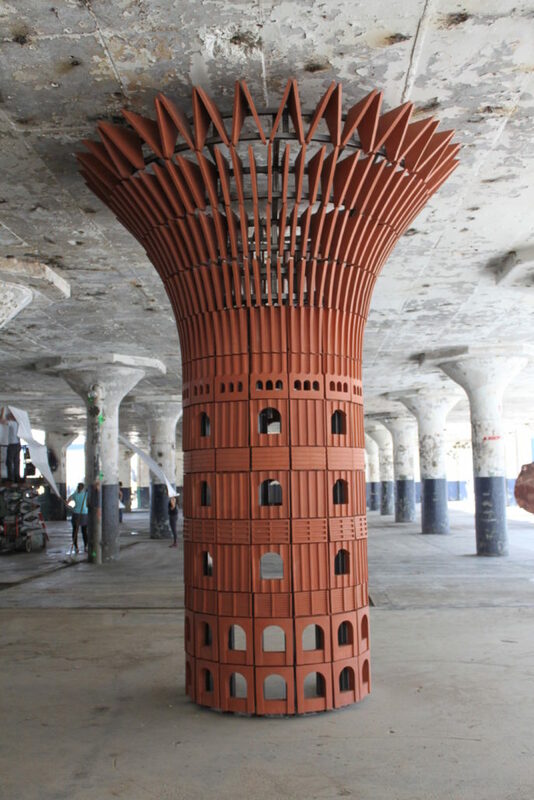 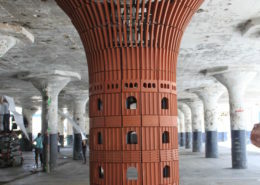 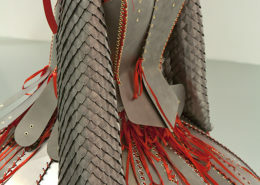 Complex flat patterns are cut and subsequently rolled into each unique piece to complete the public installations. 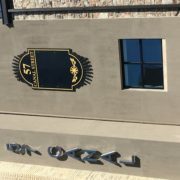 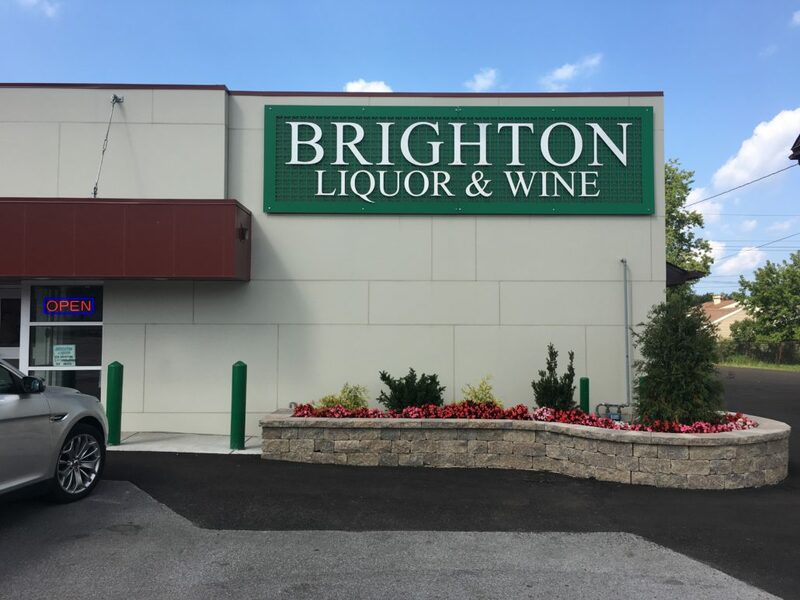 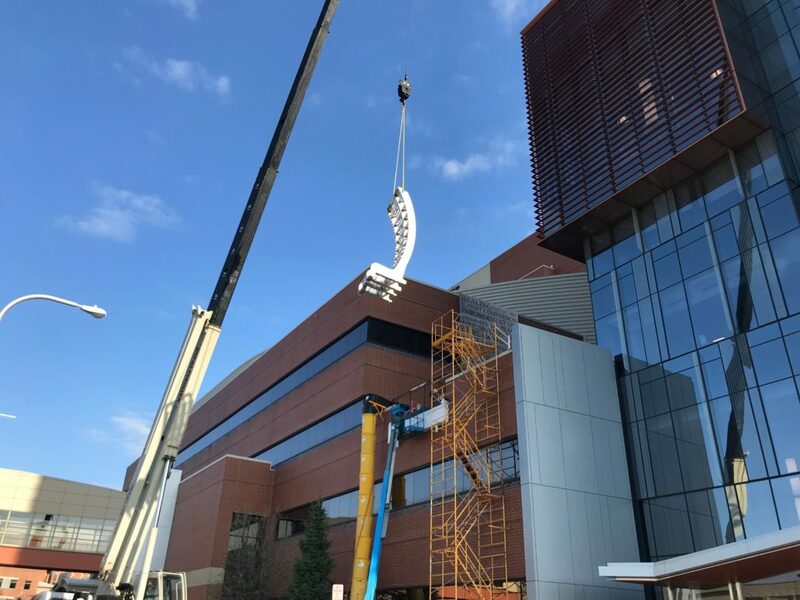 Eighteen feet of laser-cut Trespa phenolic panels function as the base for standoff stainless-steel letters on this sign installed in suburban Buffalo. 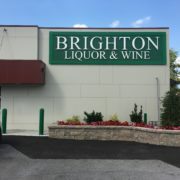 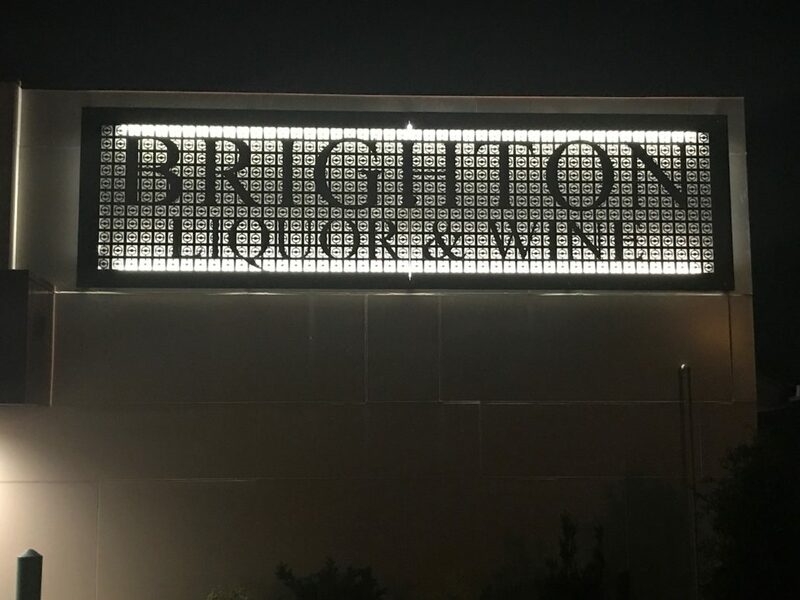 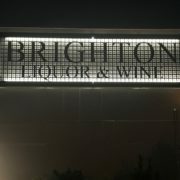 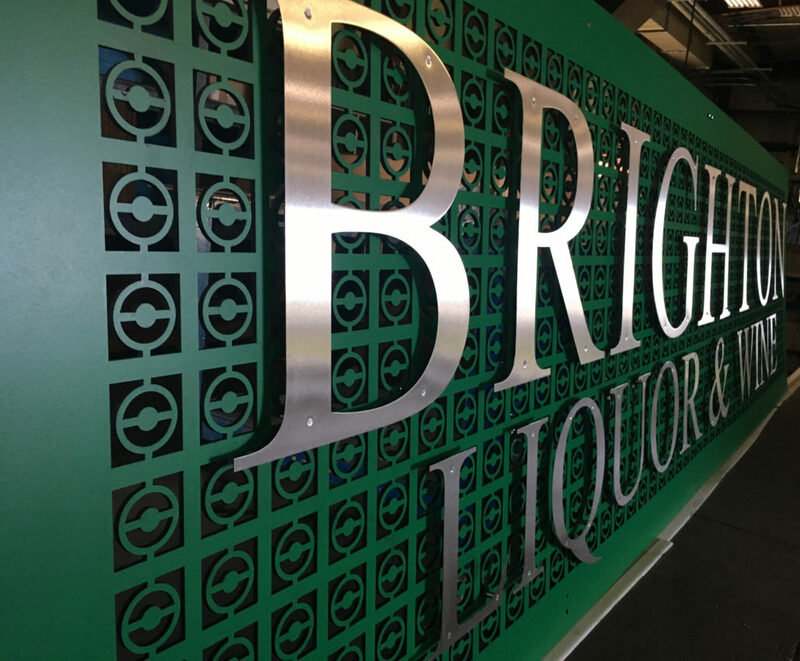 With the addition of back lighting, the sign features a vivid contrast between the green and stainless look during the day that converts to a black and white drawing at night. 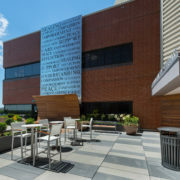 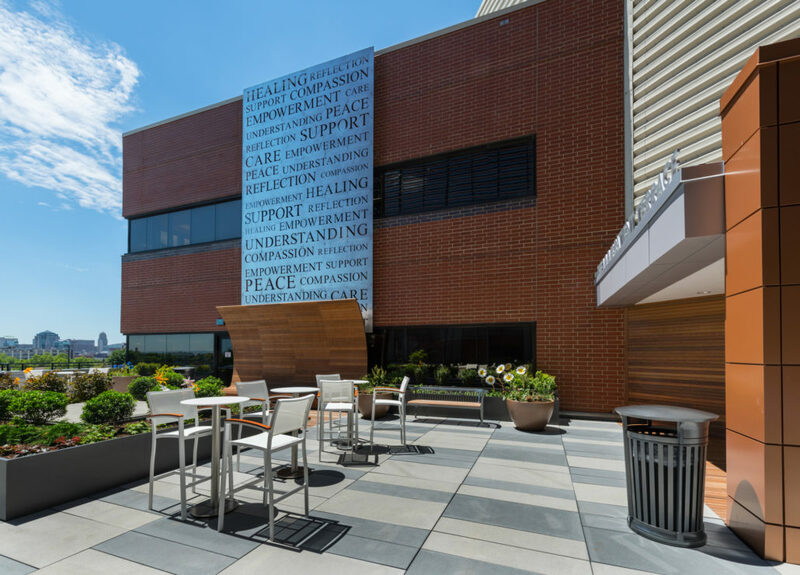 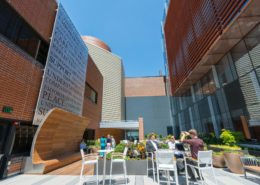 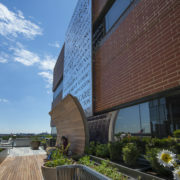 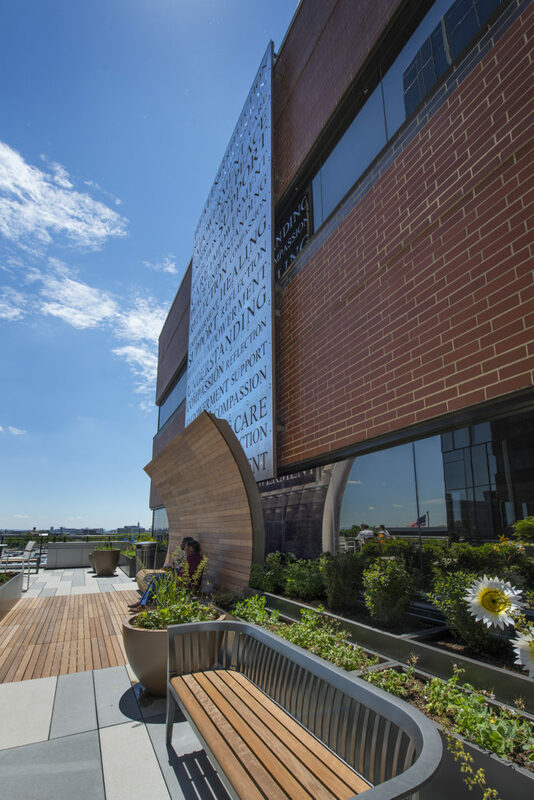 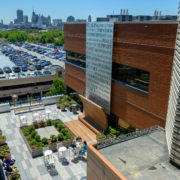 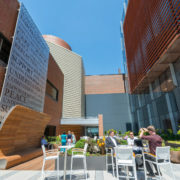 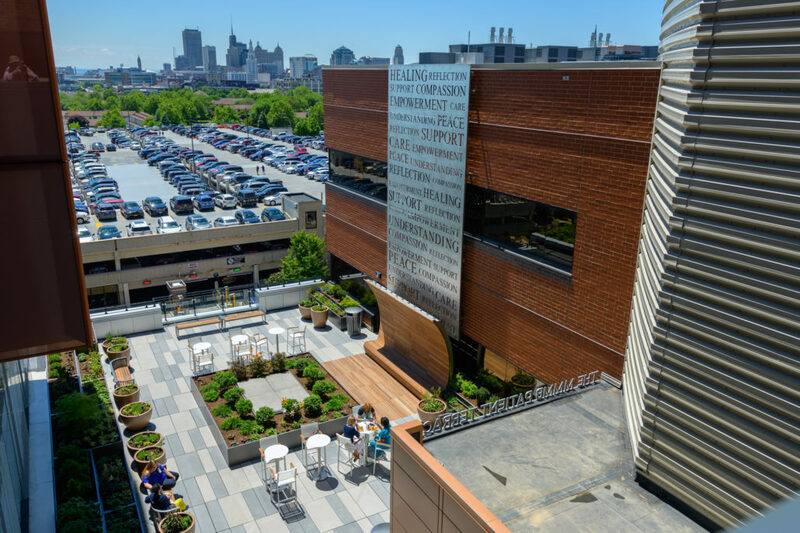 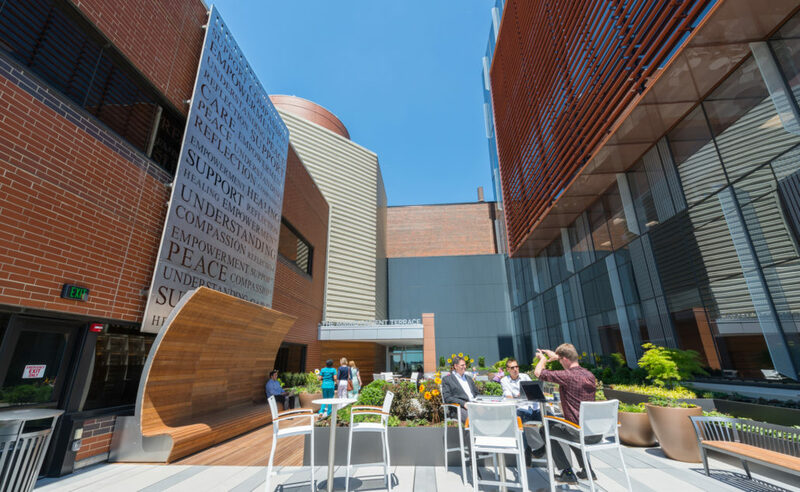 The MMMB Patient Terrace at Roswell Park Cancer Institute in Buffalo was designed as a rooftop oasis for cancer patients, family members and staff, providing a space for a moment of reflection and relaxation during the day. 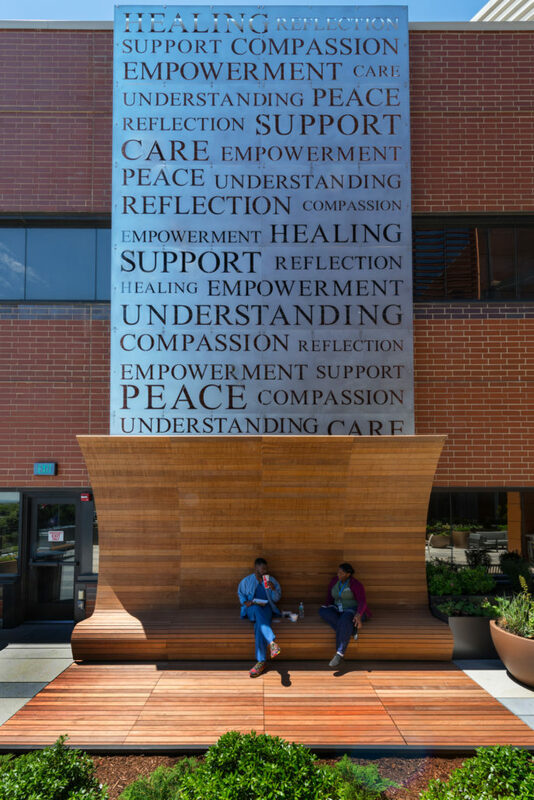 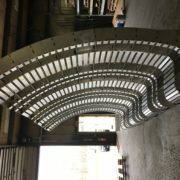 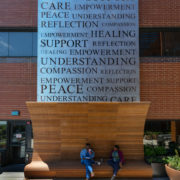 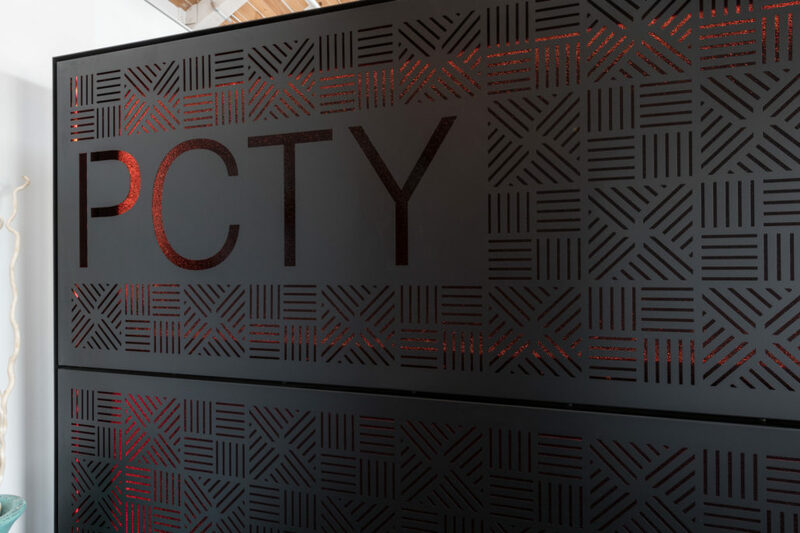 The 16′ x 24′ sign, composed of 12 individual 11 ga 316 stainless steel panels, displays a series of laser cut inspirational words, and serves as the backdrop to a custom-designed 16-foot by 10-foot stainless-steel bench clad in IPE decking. 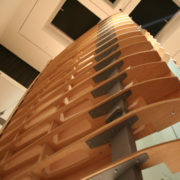 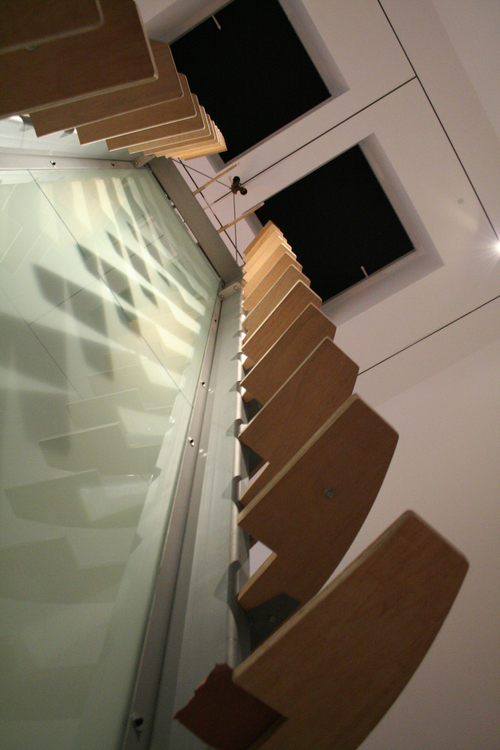 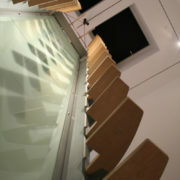 The fabrication technique for the bench structure was inspired by basswood dinosaur model kits as a method of manufacturing in response to the challenge of preserving the requested arched form while ensuring the maximum structural integrity in the lightest and most efficient possible construction. 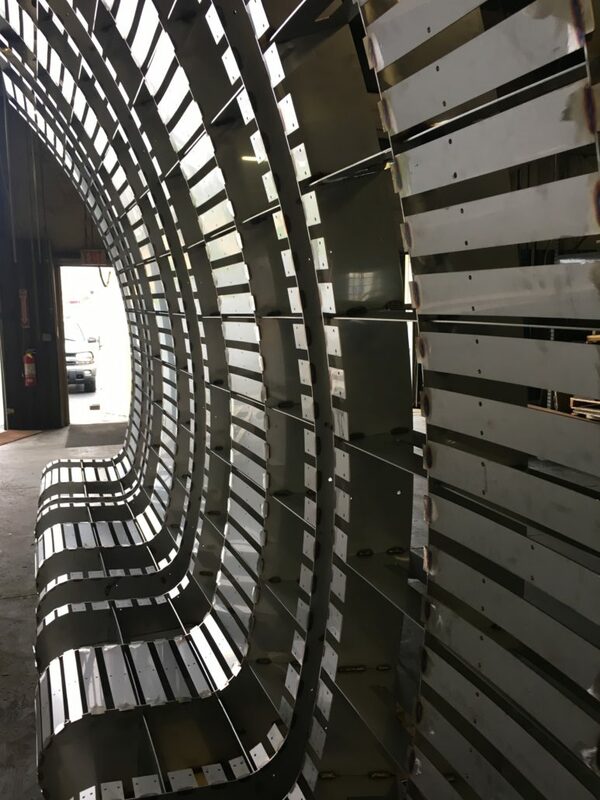 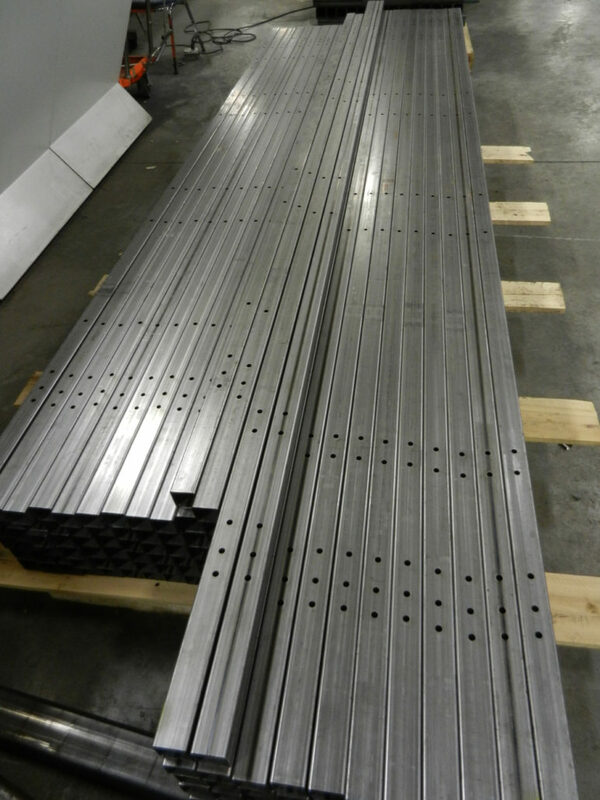 Each 11 ga planar 316 stainless member of the bench is slotted in a manner that allows for the complete assembly prior to welding, leading to the unit precision necessary to guarantee successful on-site assembly of all four bench units. 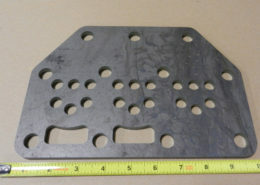 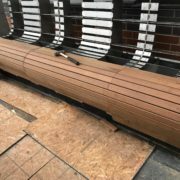 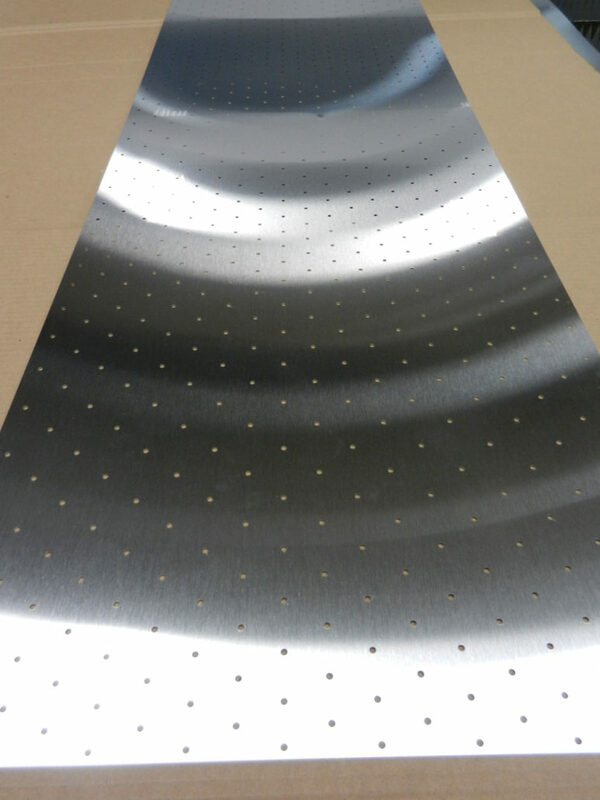 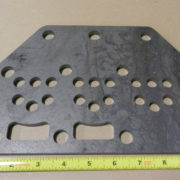 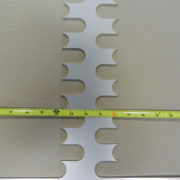 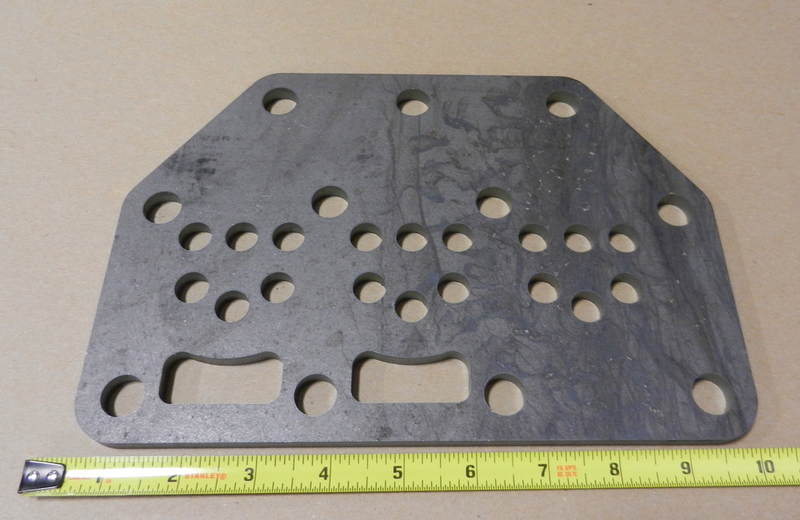 Backing plates contain holes along the entire serpentine surface and act as the hidden attachment points for the IPE boards. 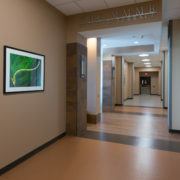 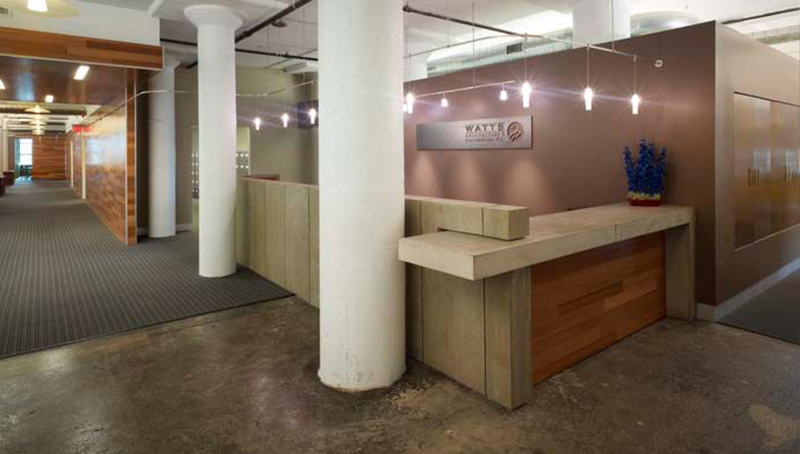 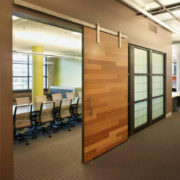 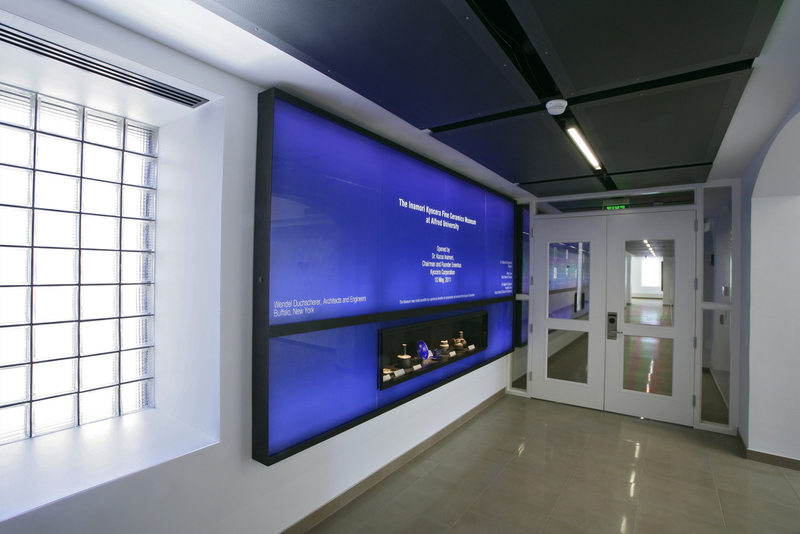 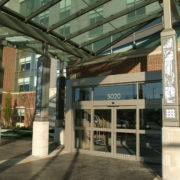 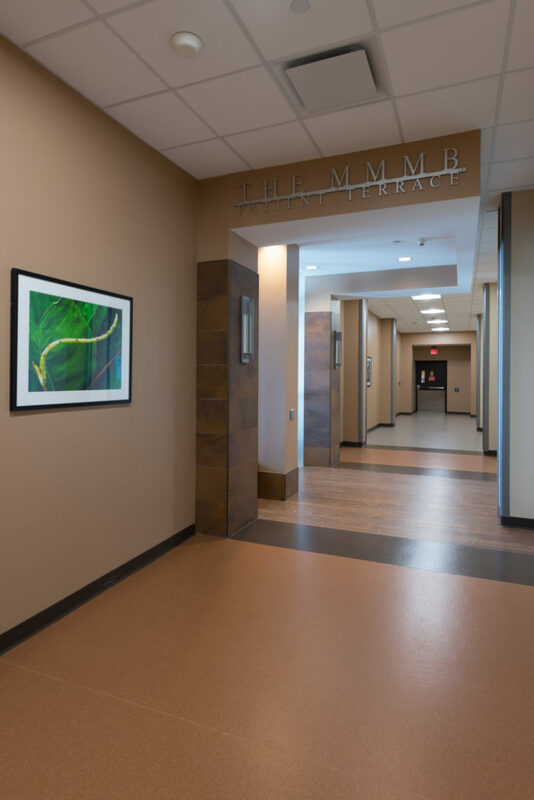 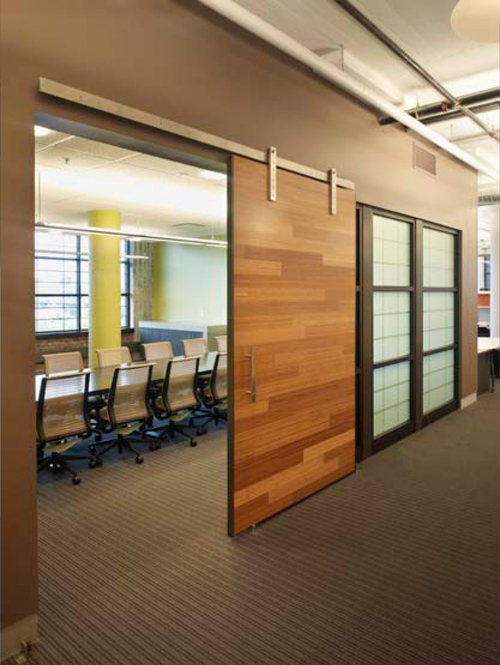 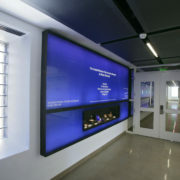 A smaller scale corridor sign of the same material completed the scope of the project. 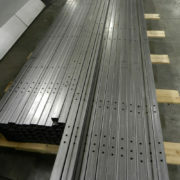 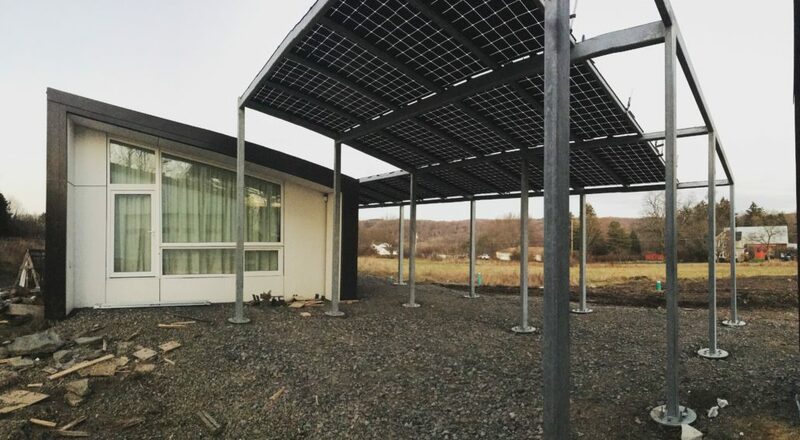 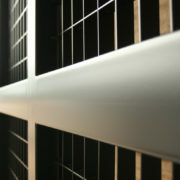 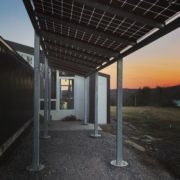 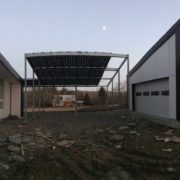 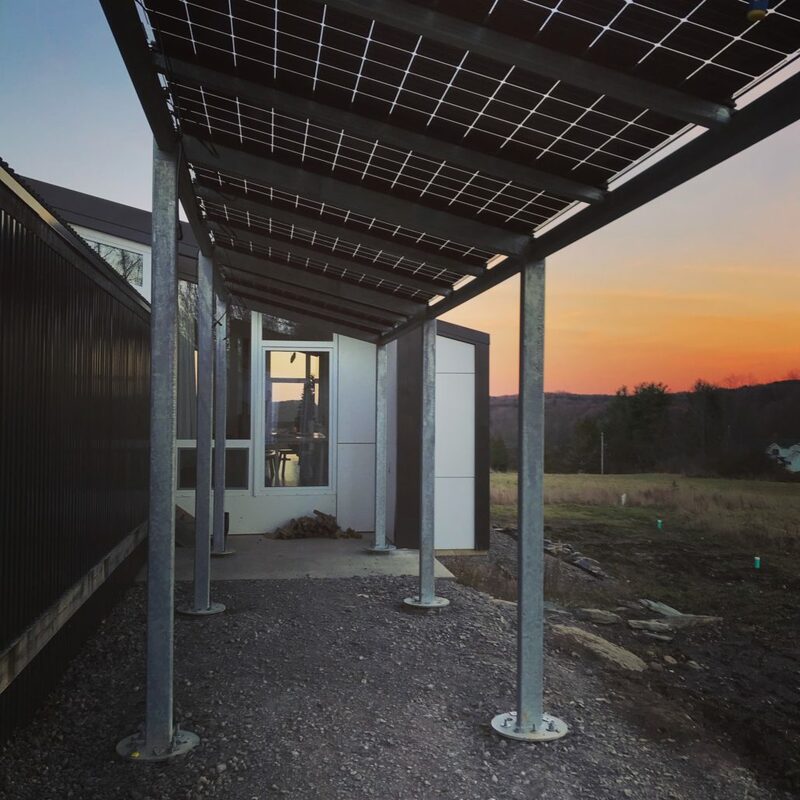 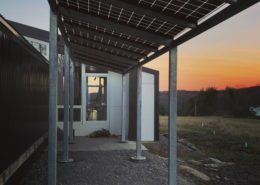 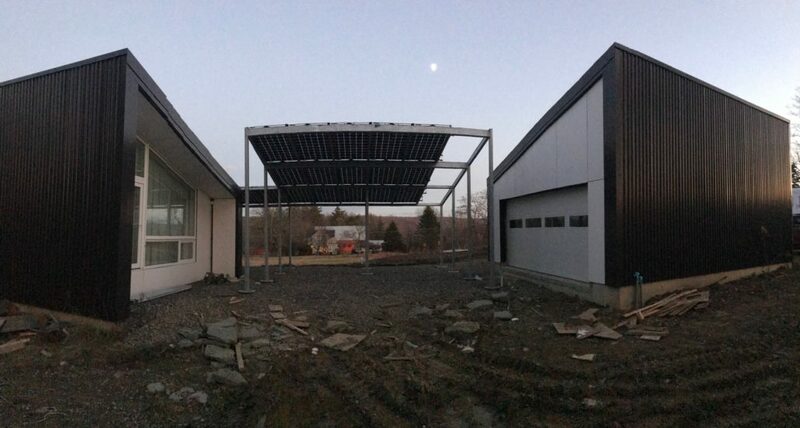 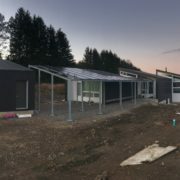 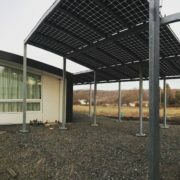 Tubular U-shaped units connect horizontally to create a steel pergola foundation for the solar panels above. 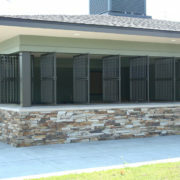 The patio space below functions as the pathway from the driveway to the entrance of the residence. 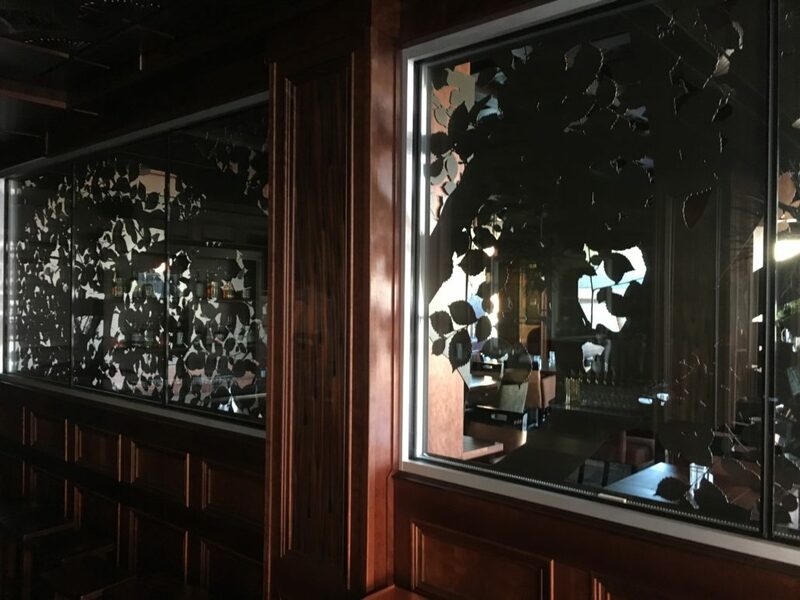 At the request of the client, the design intent of the screen partition between the restaurant and bar spaces had to incorporate a reference to the elm tree, a once-prolific tree in the Western NY area that, as a result of Dutch elm disease, suffered devastating losses. 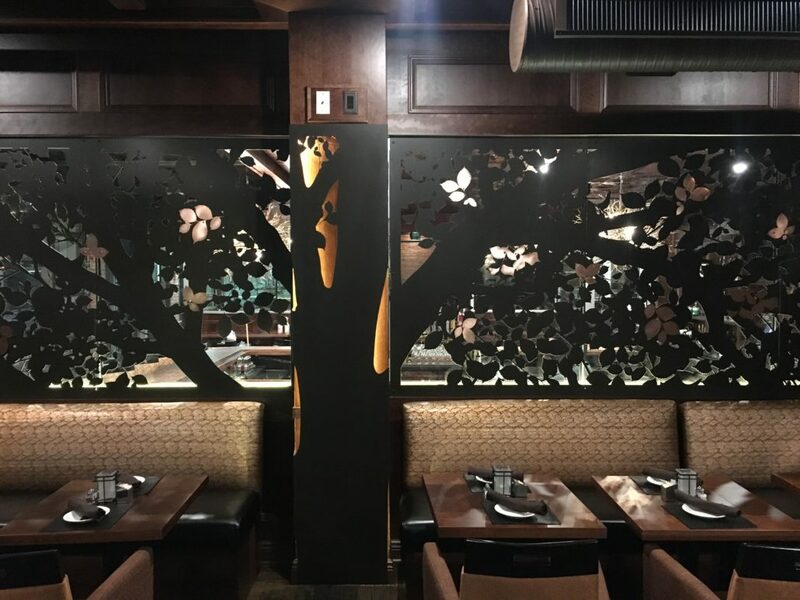 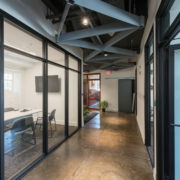 The solution was to design the screen as though it were a cross section through the middle of an elm tree, controlling the amount of visual openness necessary to respond to the needs of the adjacent areas. 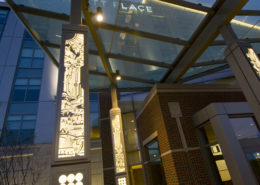 Accented with LED lighting, the central column serves as the foundation for the trunk. 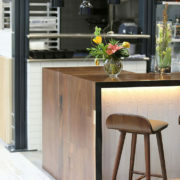 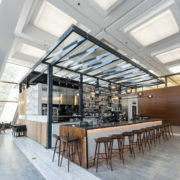 The natural leaf density on either side fosters a delicate balance between the need for privacy in the dining area while keeping a visual connection with the bar space behind. 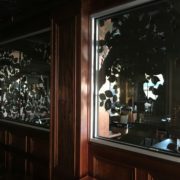 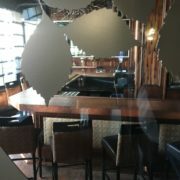 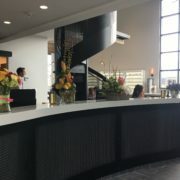 The proliferation of leaves farthest from the trunk offers increased privacy from the hallway that leads from the main entrance directly back to the bar. 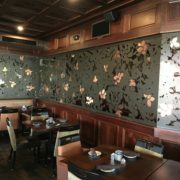 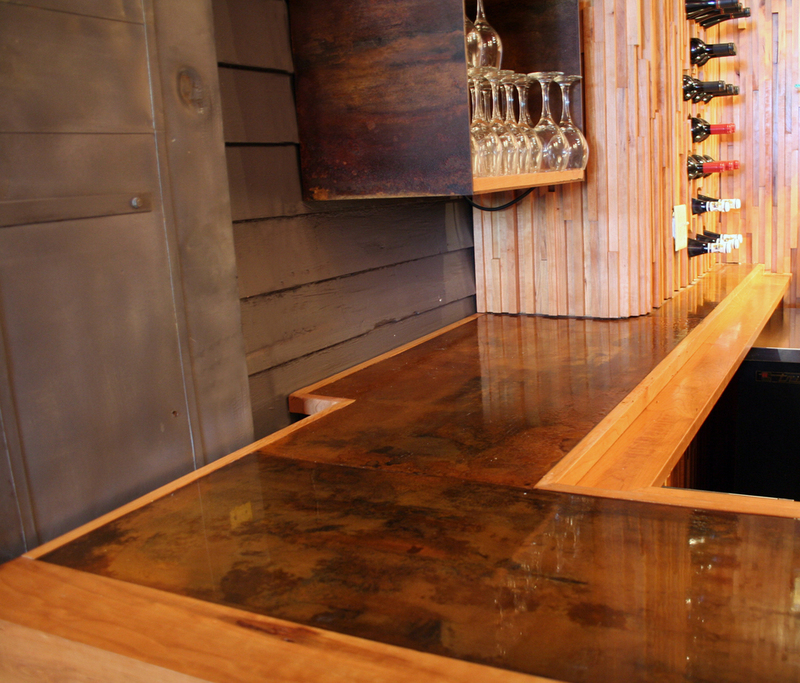 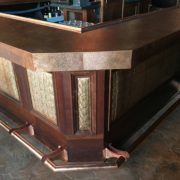 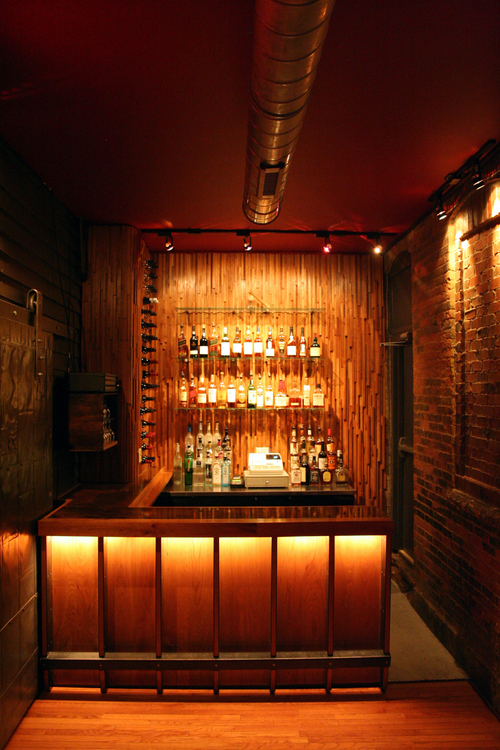 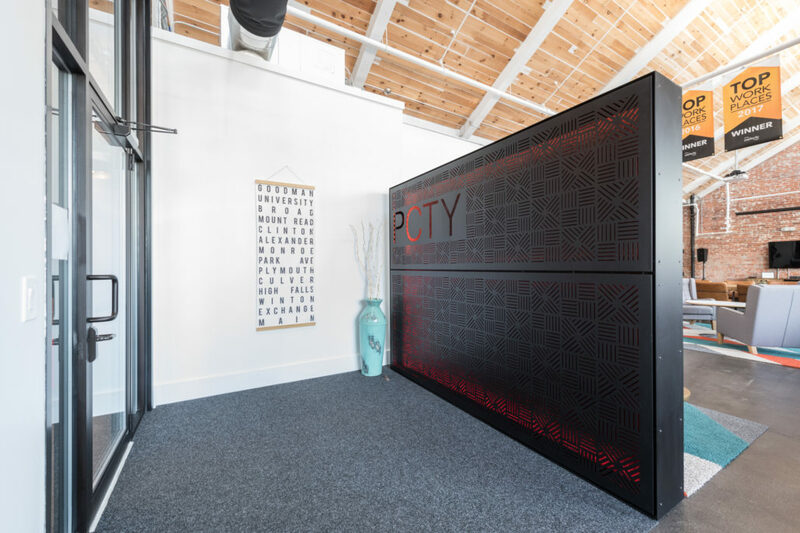 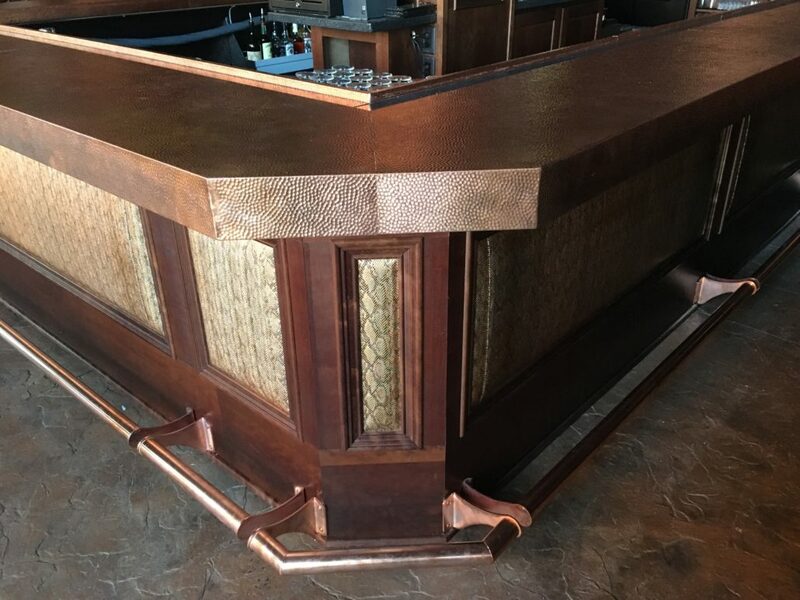 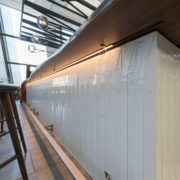 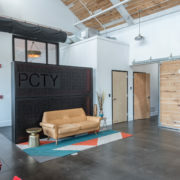 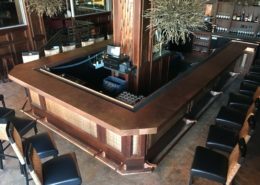 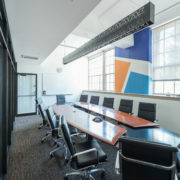 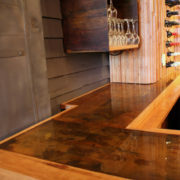 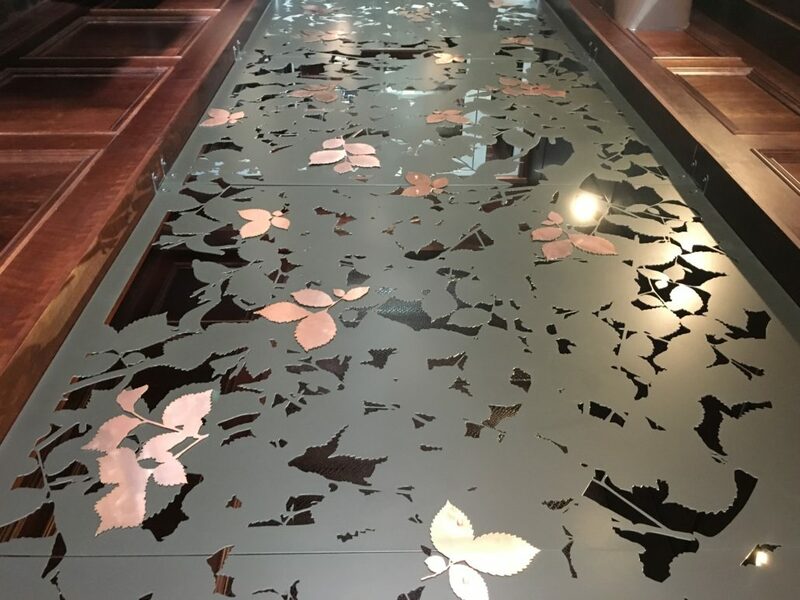 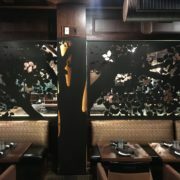 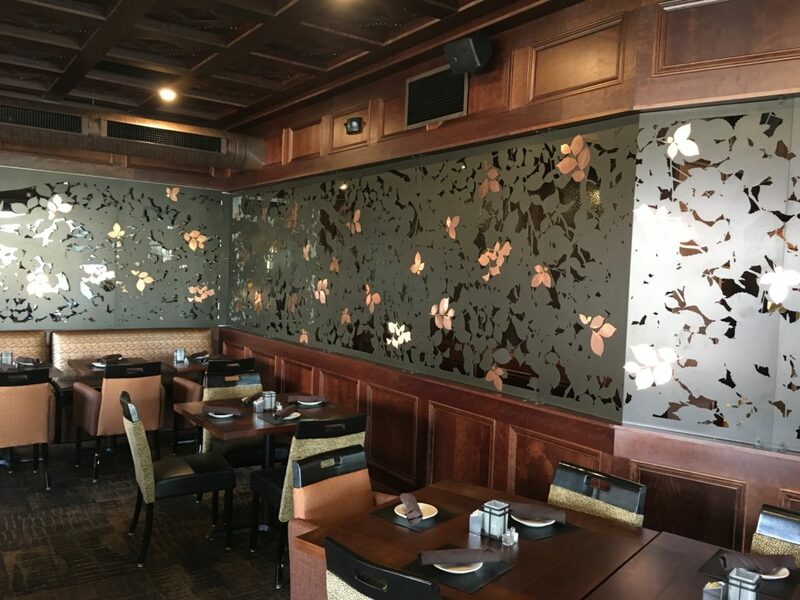 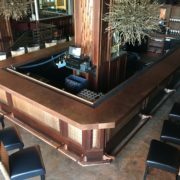 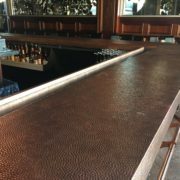 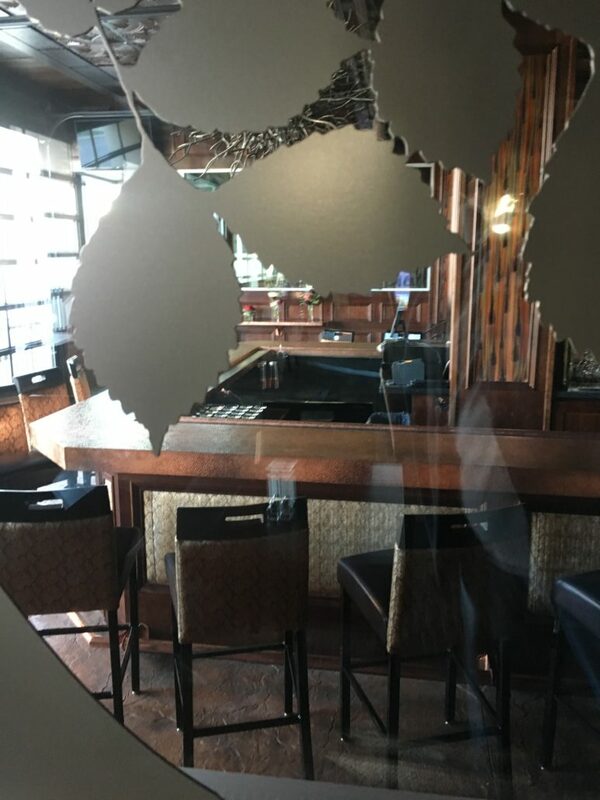 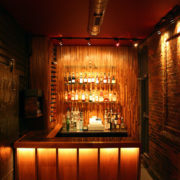 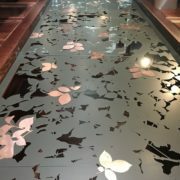 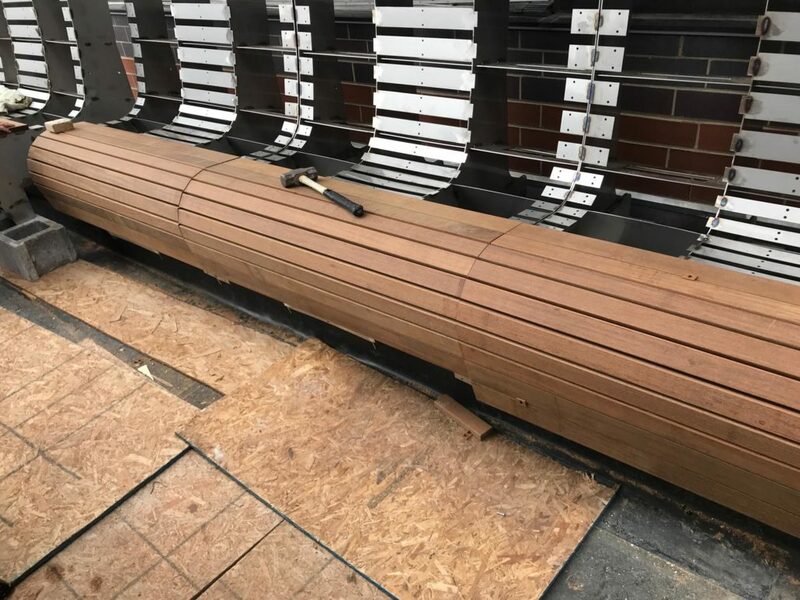 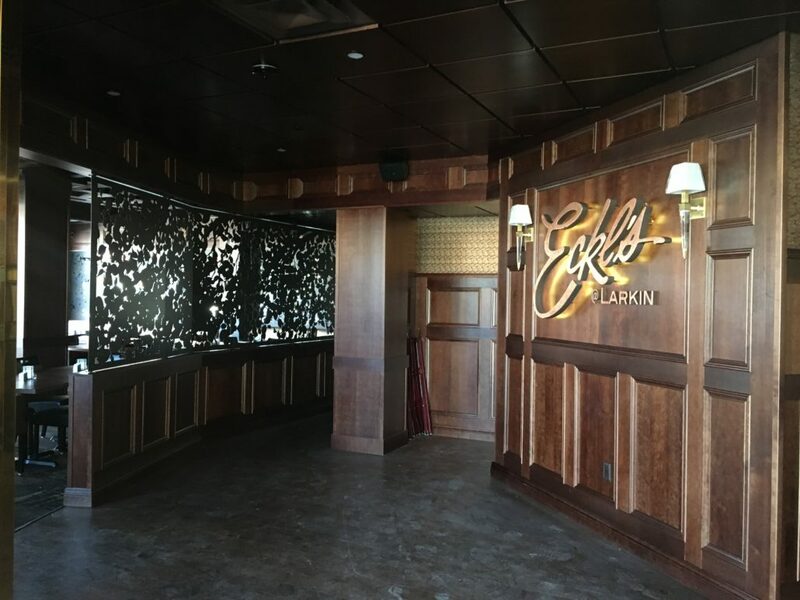 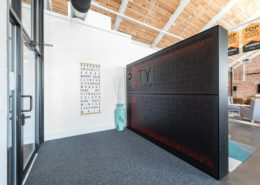 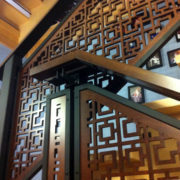 Ninety square feet of laser cut, formed hammered copper sheets are installed over laser cut sheets of plywood substrate to ensure that prefabricated bar, server rail cap, and drink rail segments could be precisely installed with a minimal amount of intrusion in an already finished space. 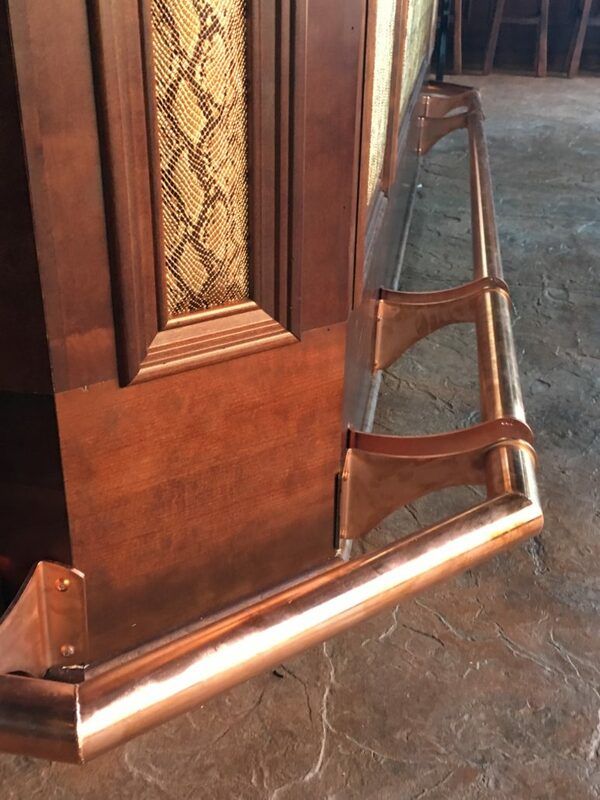 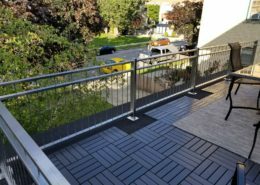 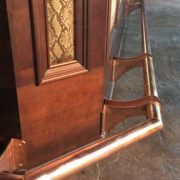 Custom designed and fabricated copper-plated stainless-steel foot rail units and drink rail brackets completed the scope of the project. 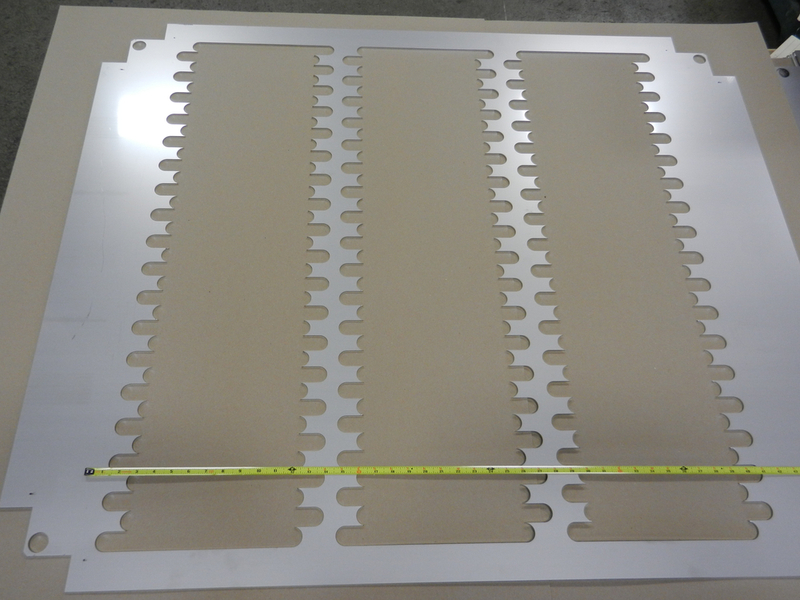 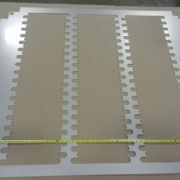 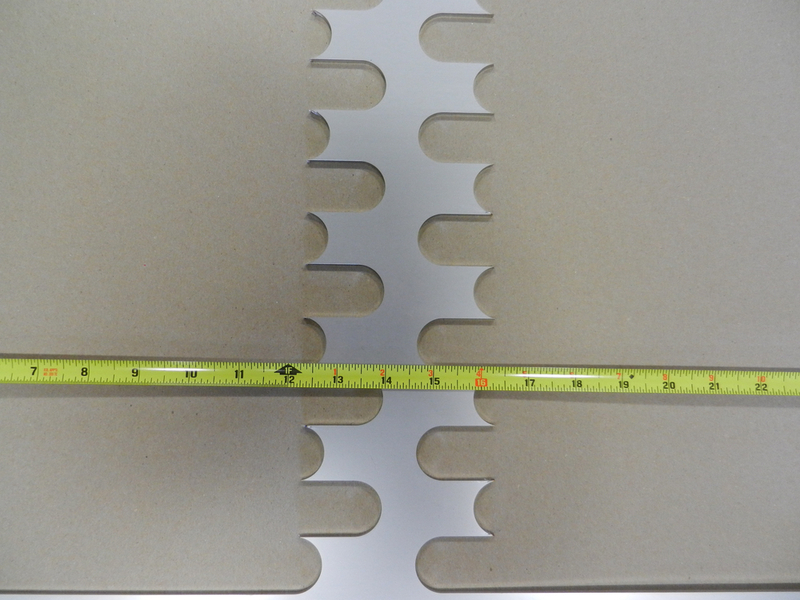 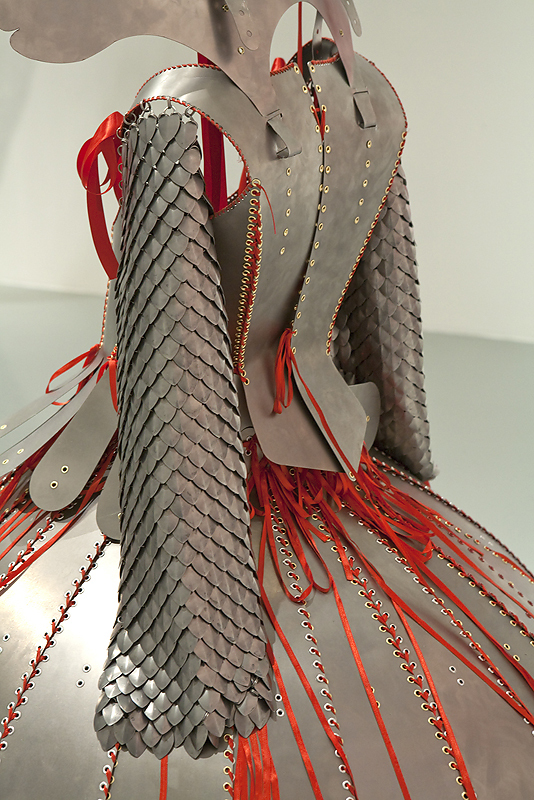 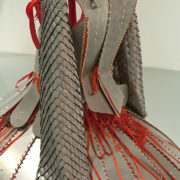 Multiple layers of aluminum of varying thickness were laser cut and stacked in a manner to hide all fasteners. 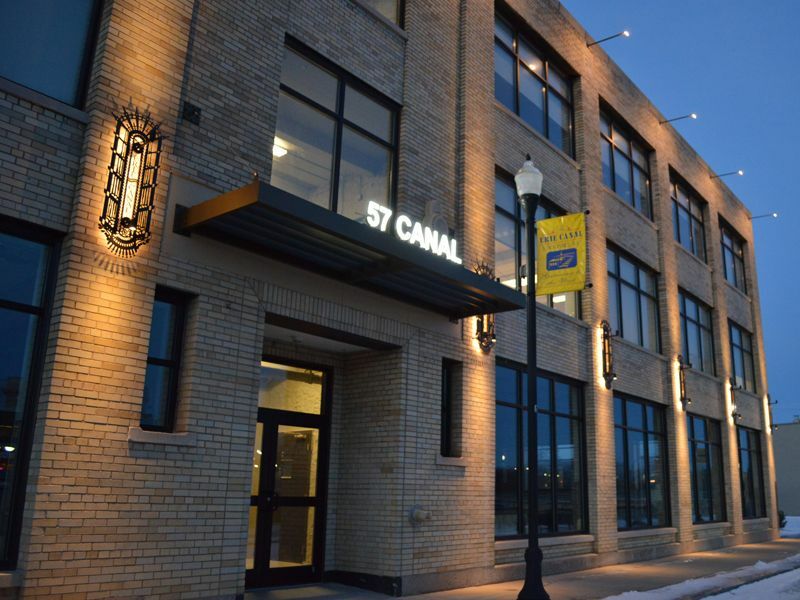 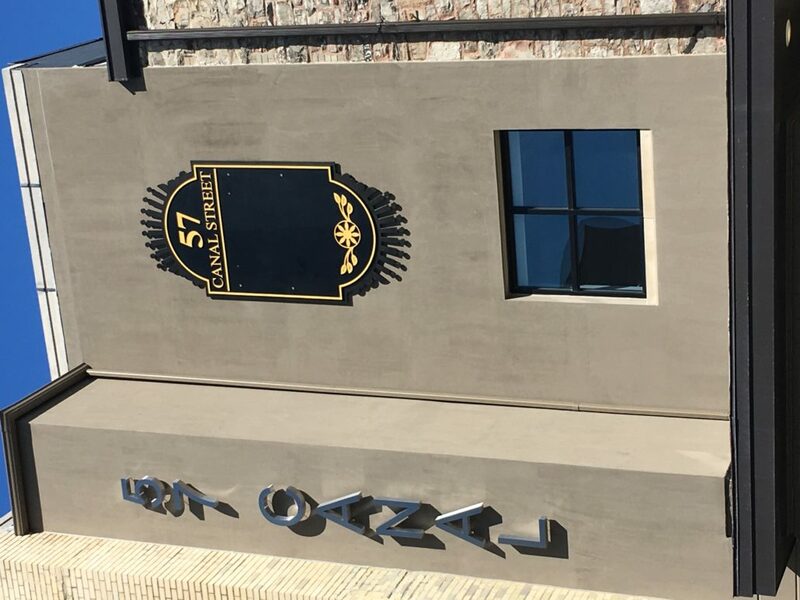 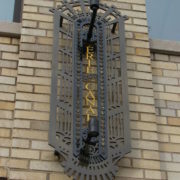 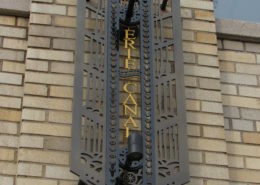 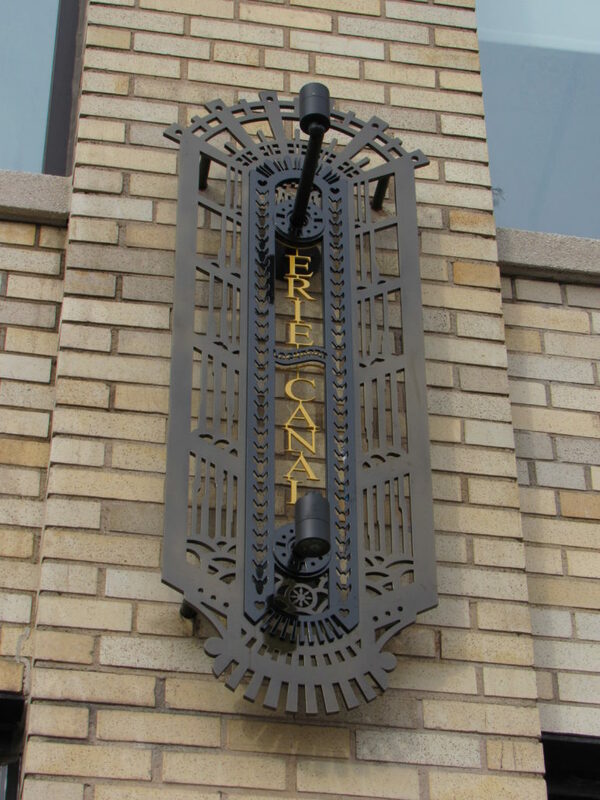 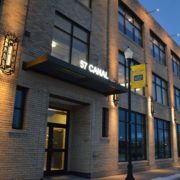 Due to the building’s adjacency to the Erie Canal, the symbolism of the design elements on each layer reflect the history of the area. 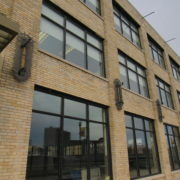 The signage on the opposite side of the building employs the same fabrication technique at a larger scale. 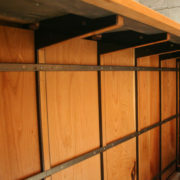 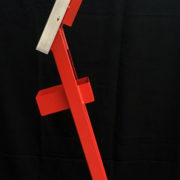 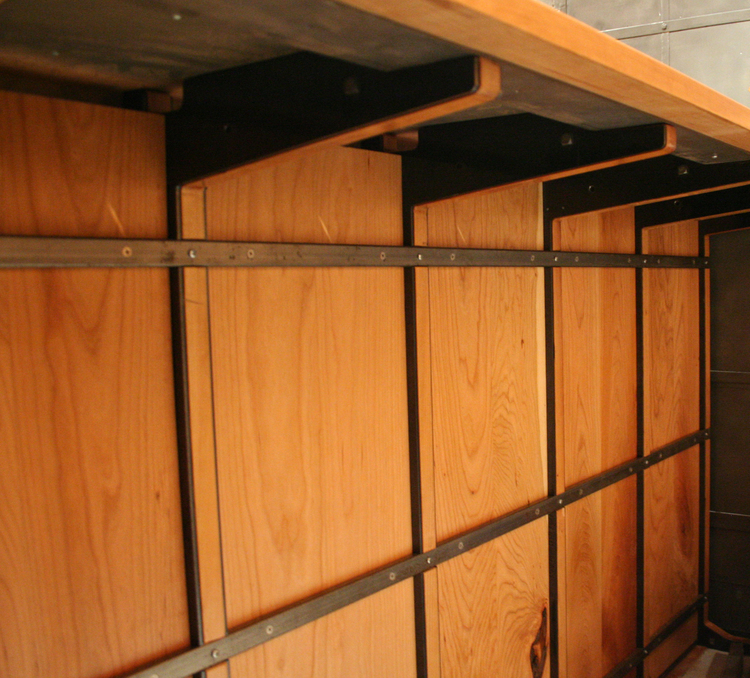 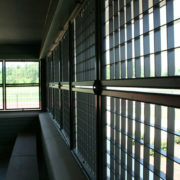 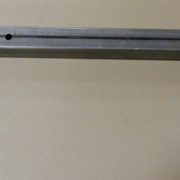 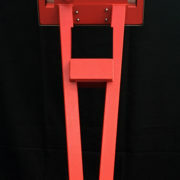 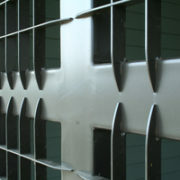 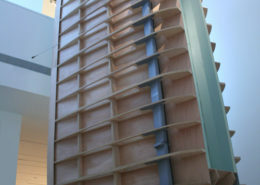 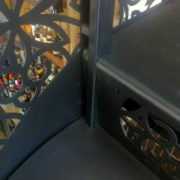 Layering planes with back-fastened, countersunk fasteners allowed for different powder coat colors to be used for each layer. 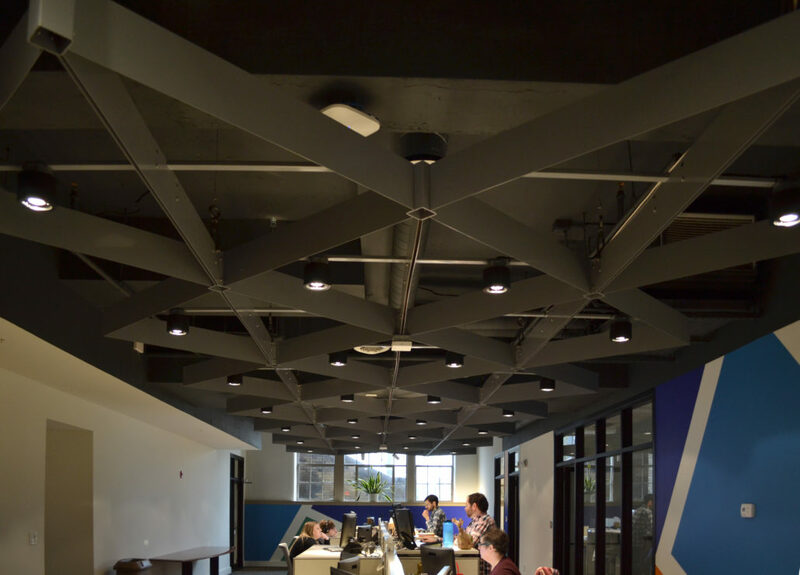 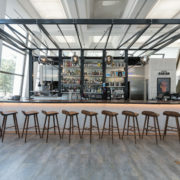 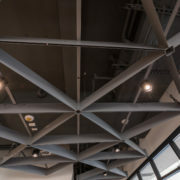 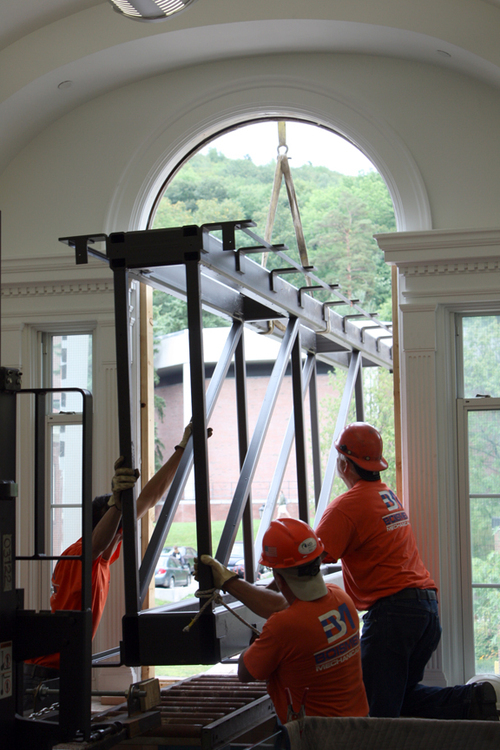 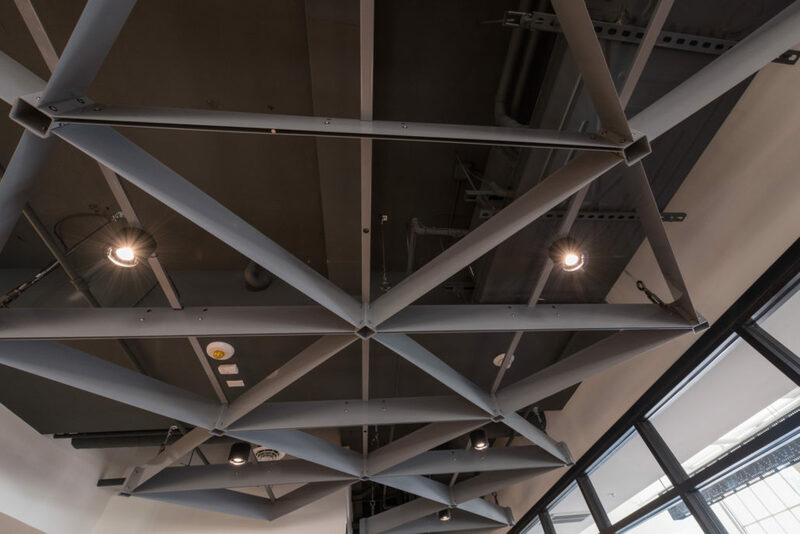 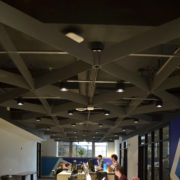 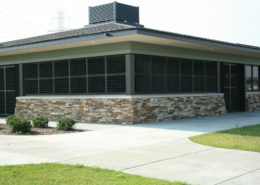 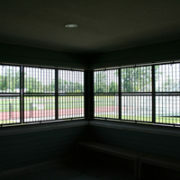 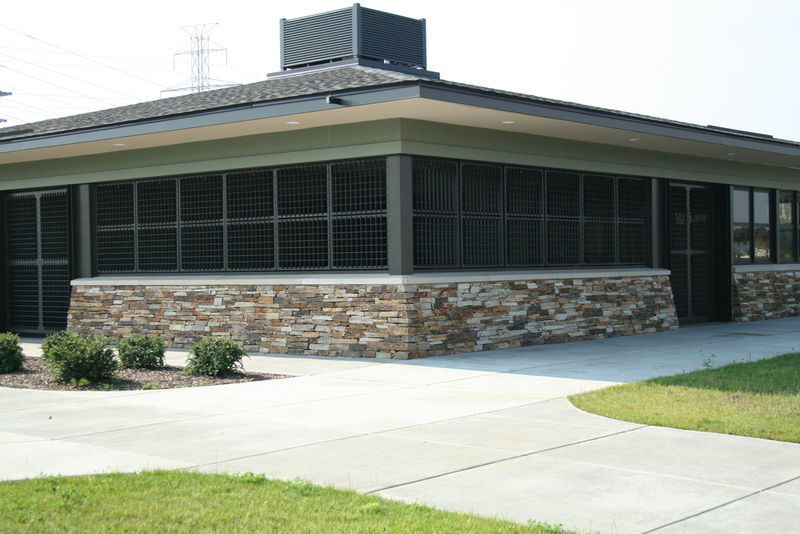 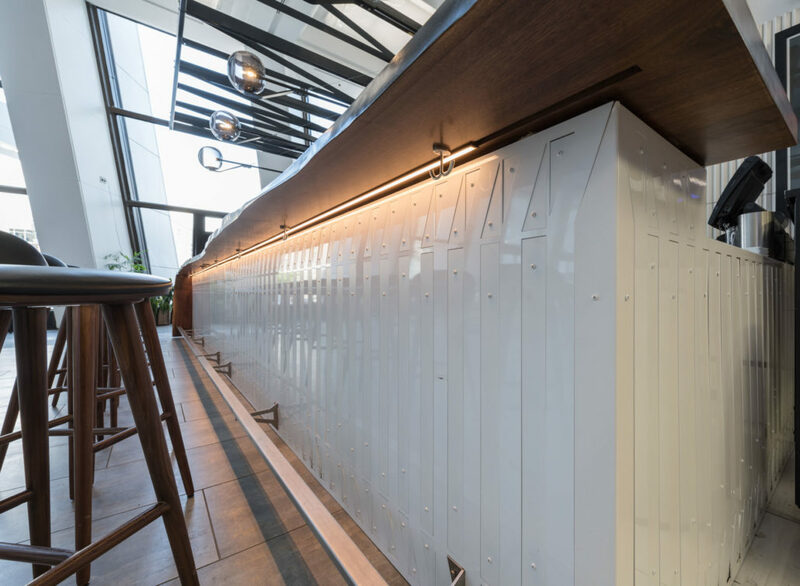 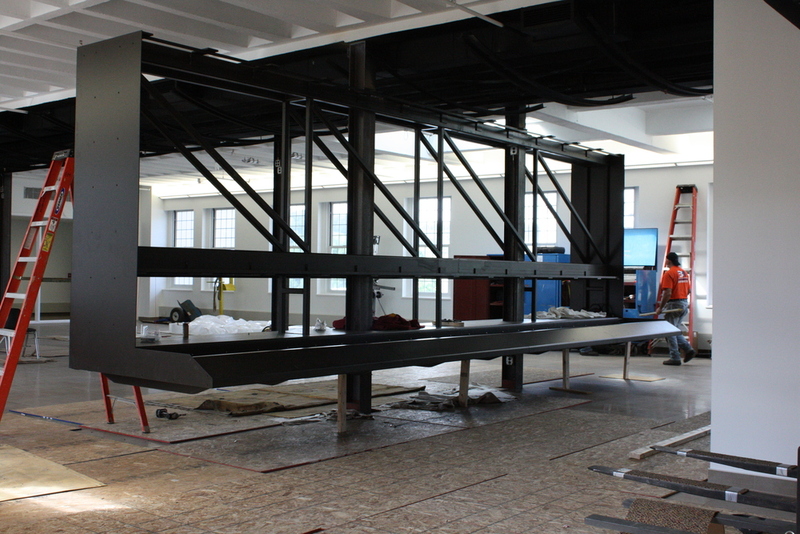 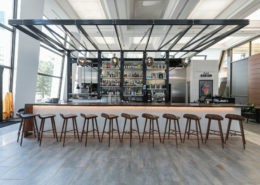 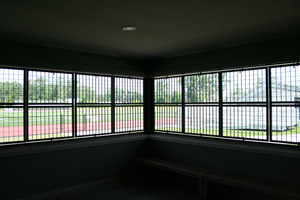 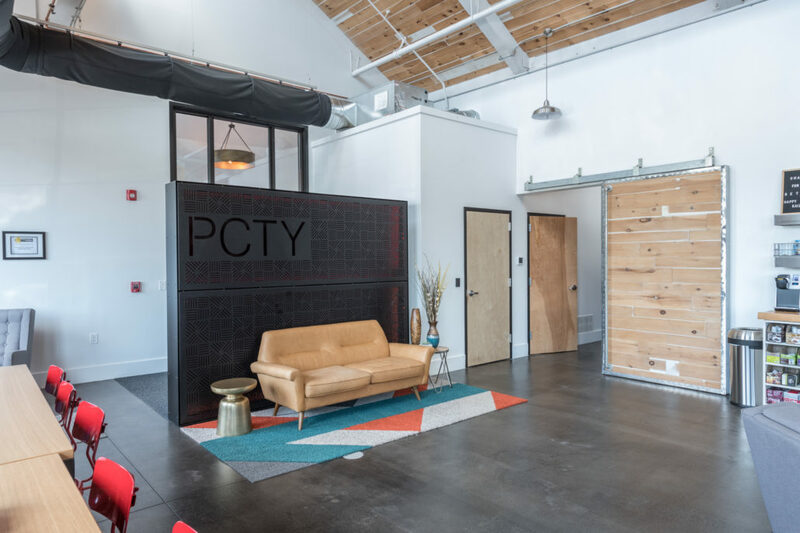 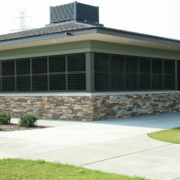 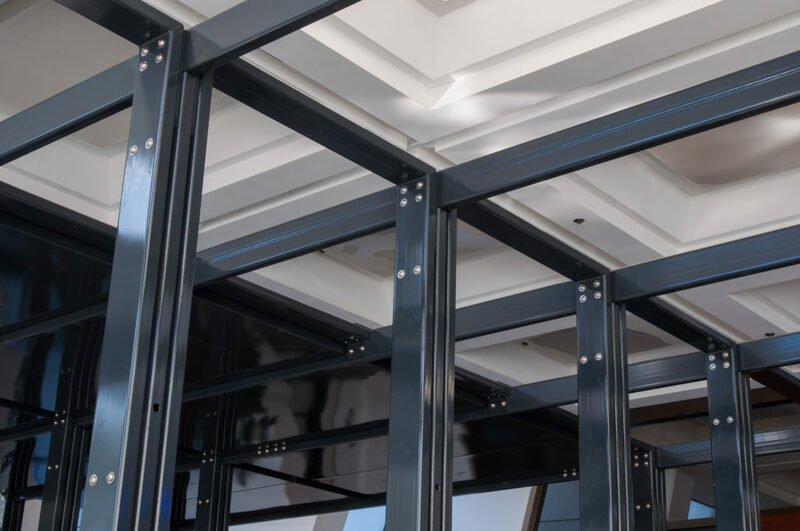 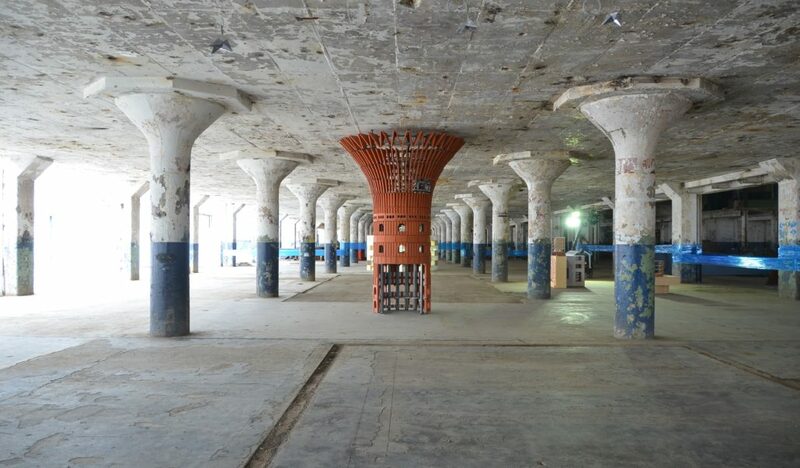 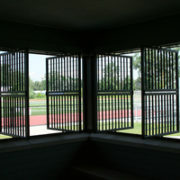 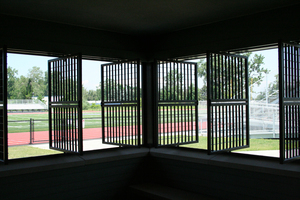 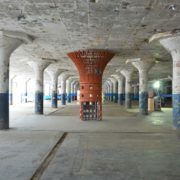 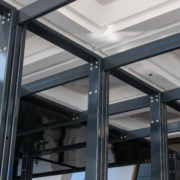 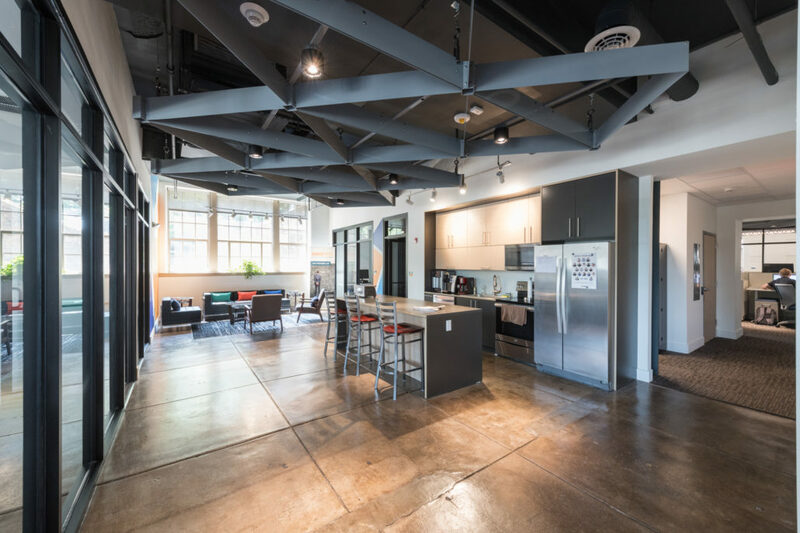 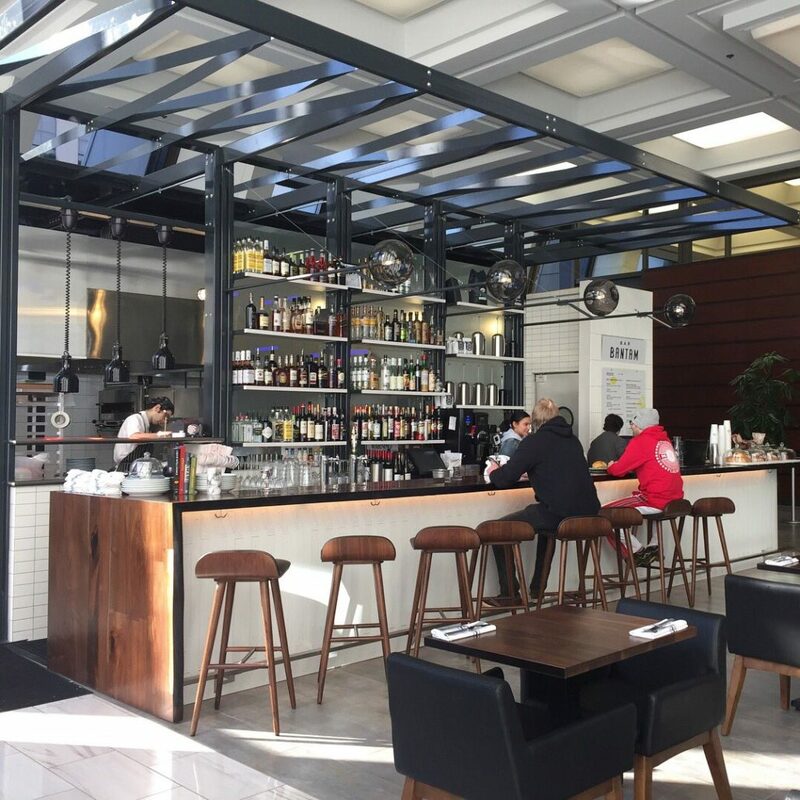 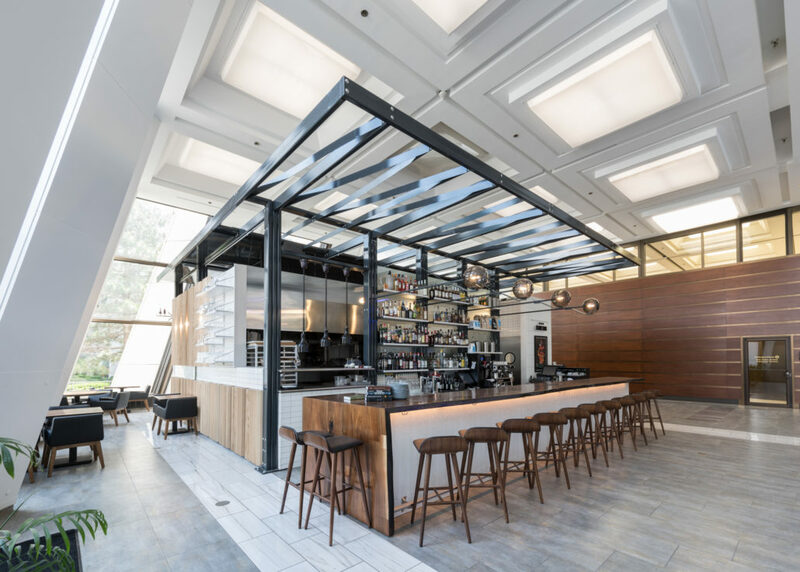 As a response to site constraints, the structural framework for the bar required the design of a system that was fully assemblable post powder coat. 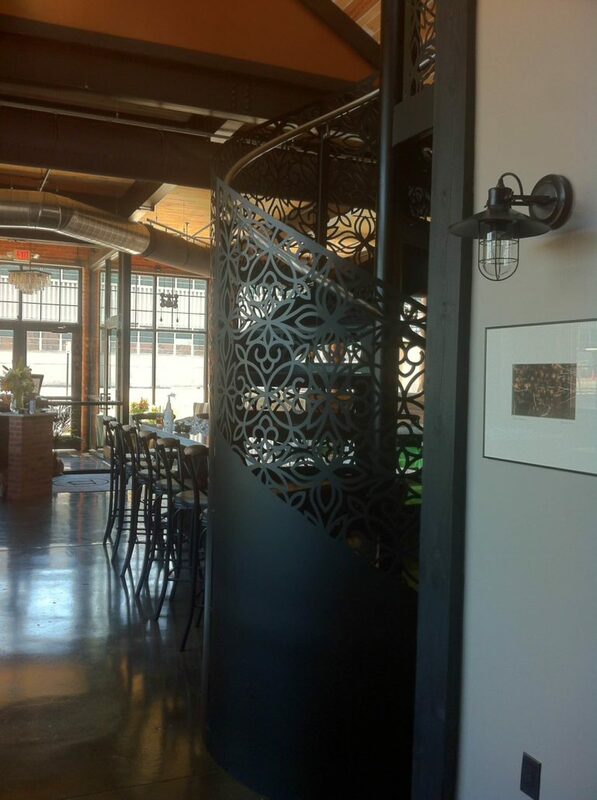 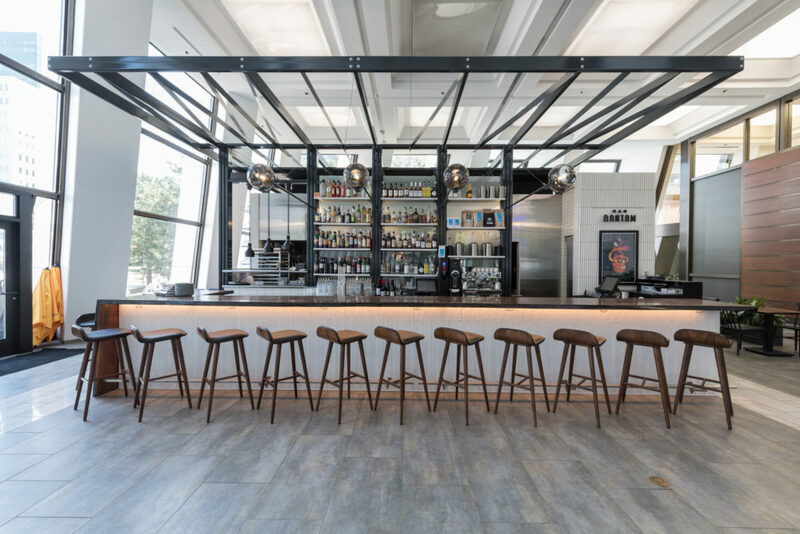 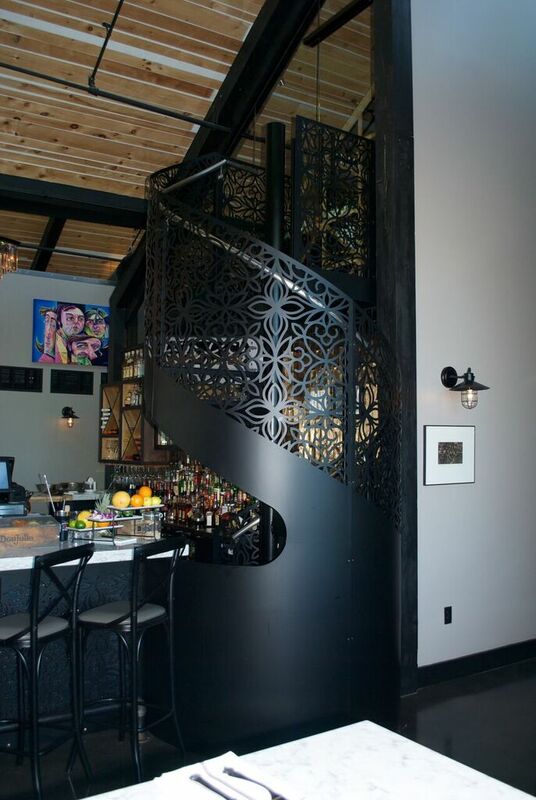 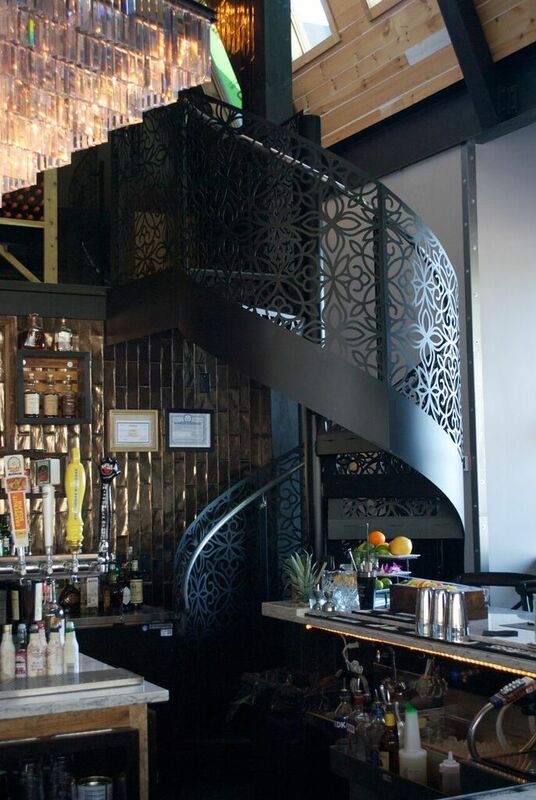 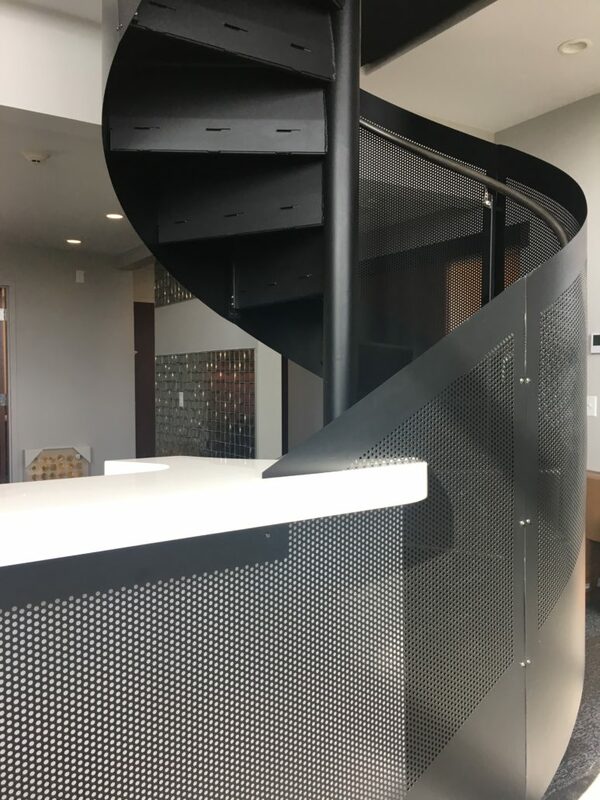 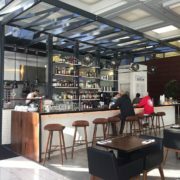 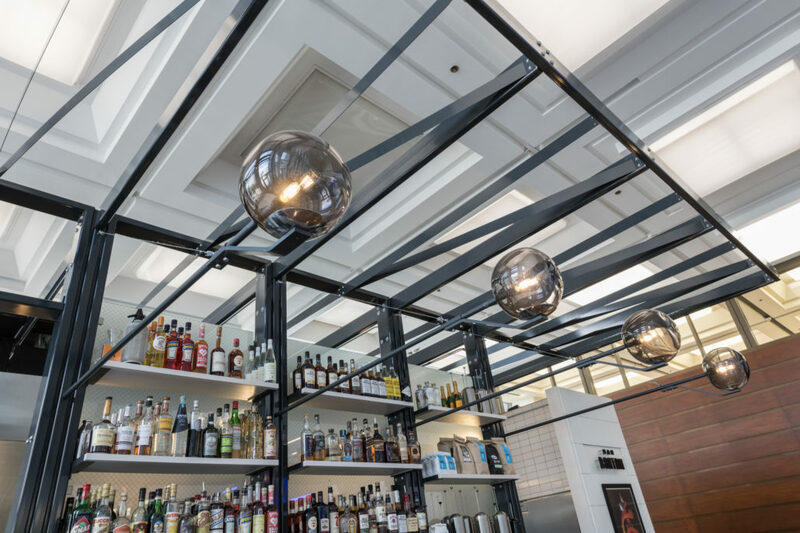 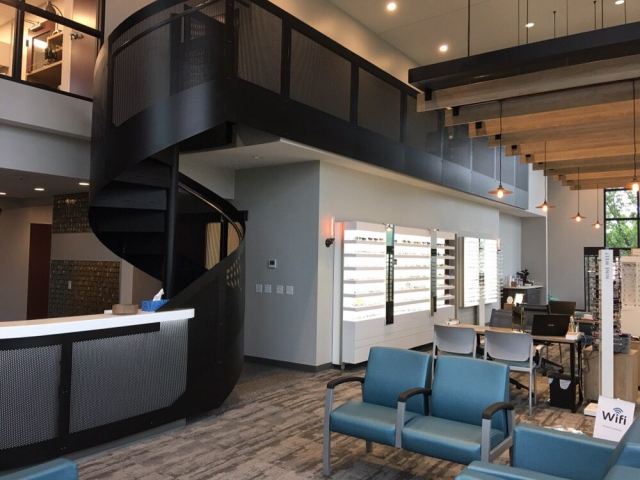 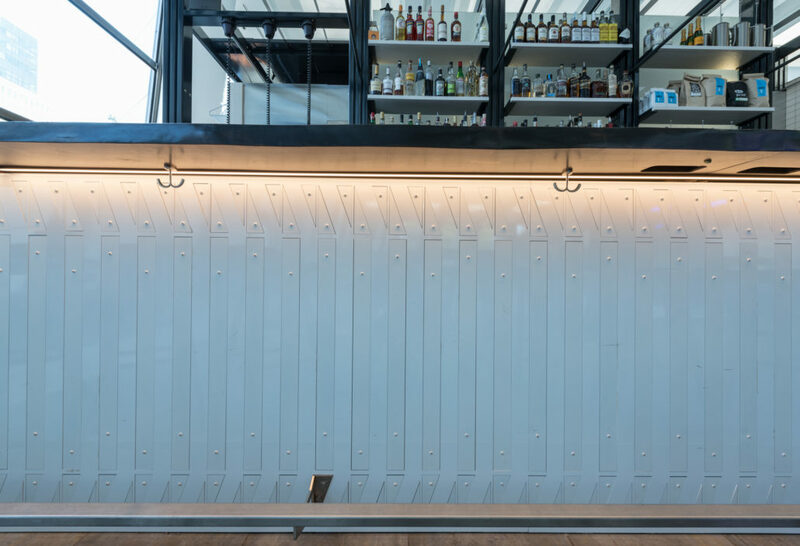 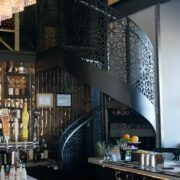 Inspired by the building facade, U-shaped tube structures combine with 1/2″ steel plate spacers and central columns to form a laminated support for the beams above creating and facilitate a nine-foot cantilever over the bar. 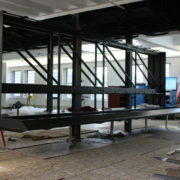 The structural grid becomes the foundation for the remainder of the build out. 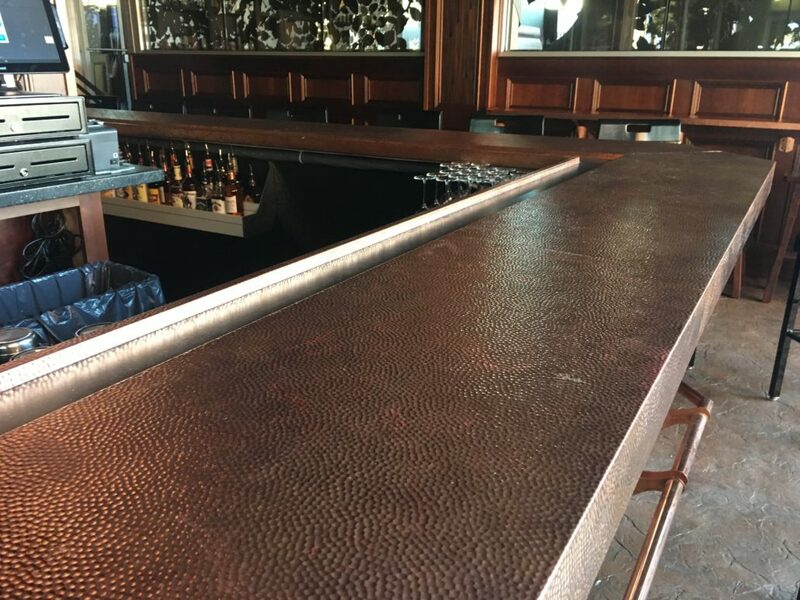 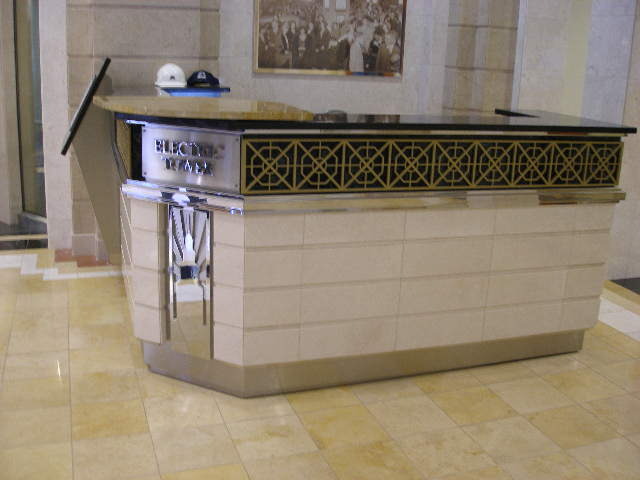 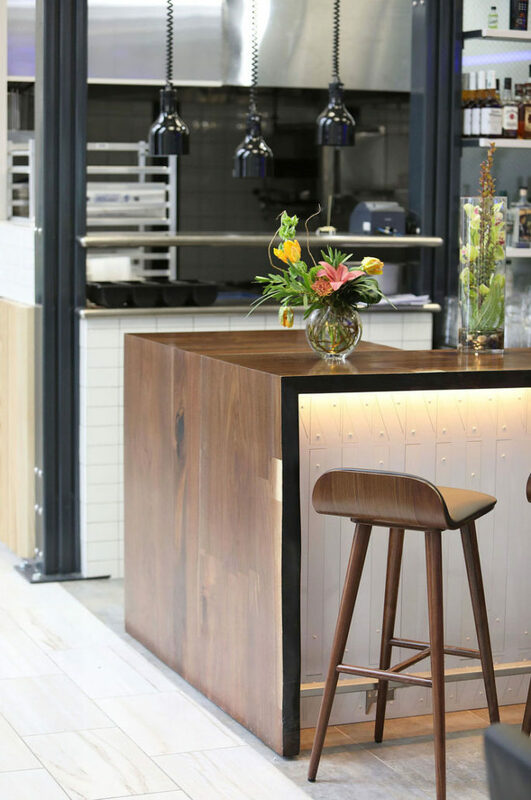 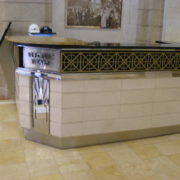 The bar front tiles were designed in response to the unavailability and excessive costs of custom ceramic tile in the desired pattern. 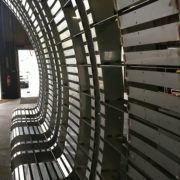 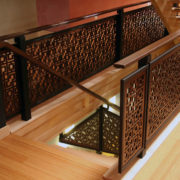 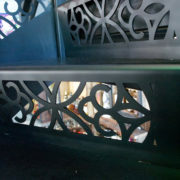 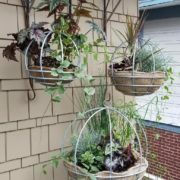 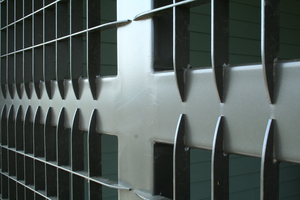 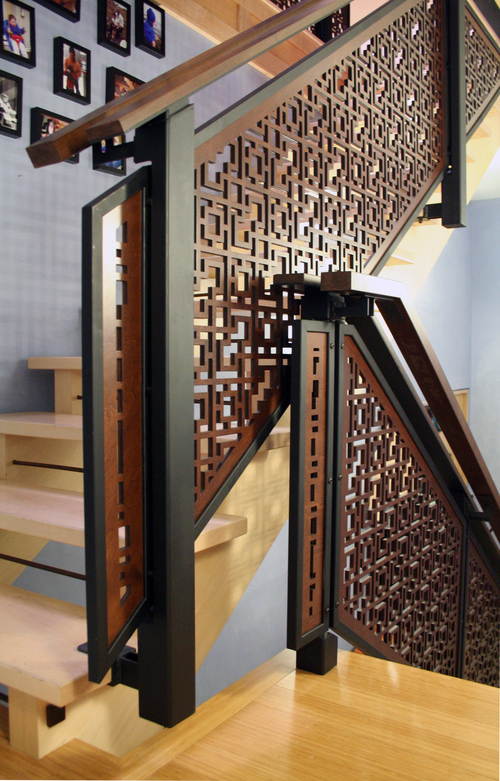 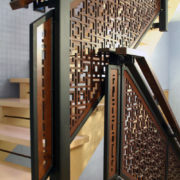 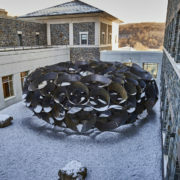 The construction of the pattern consists of powder-coated 13 ga steel skeleton sections with steel pieces cut to fit the voids. 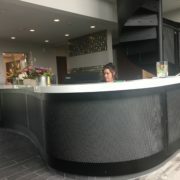 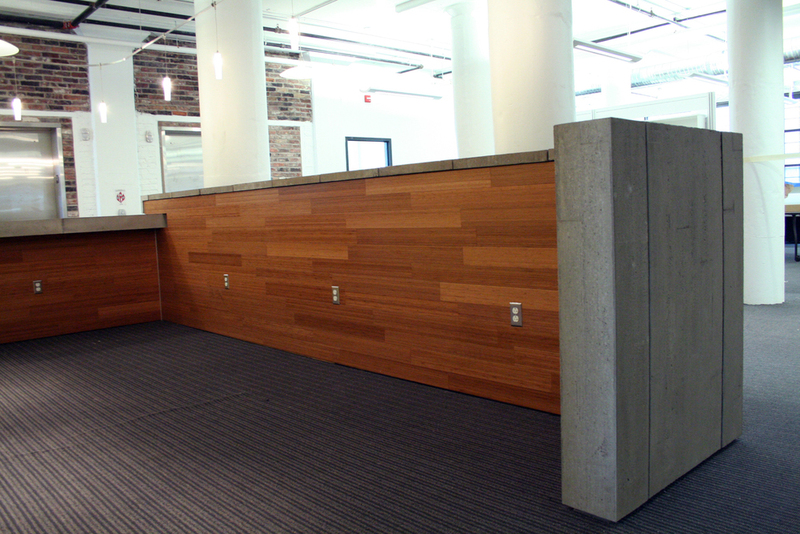 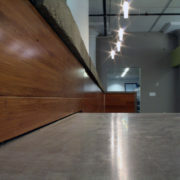 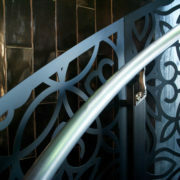 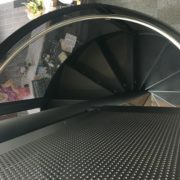 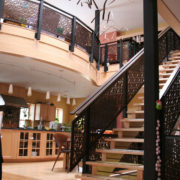 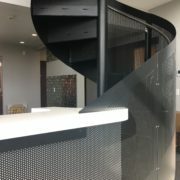 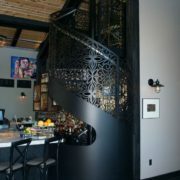 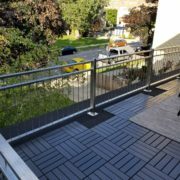 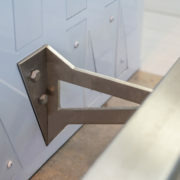 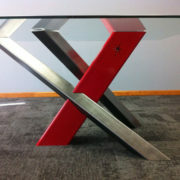 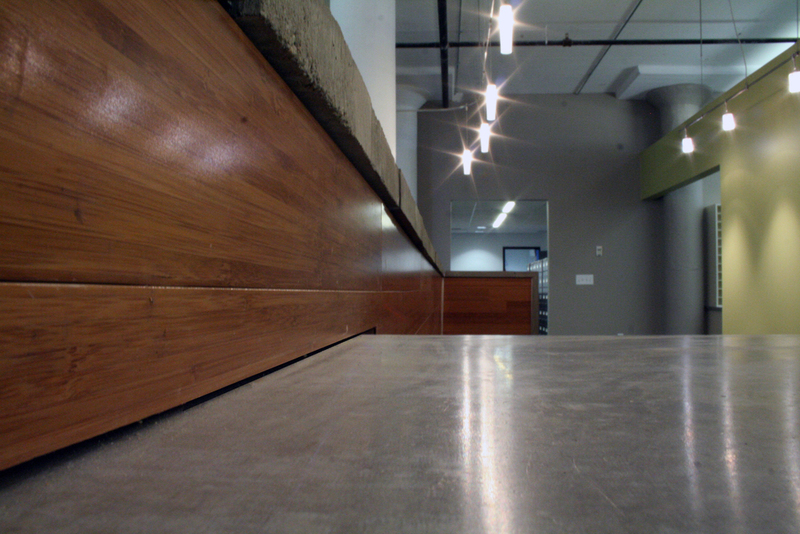 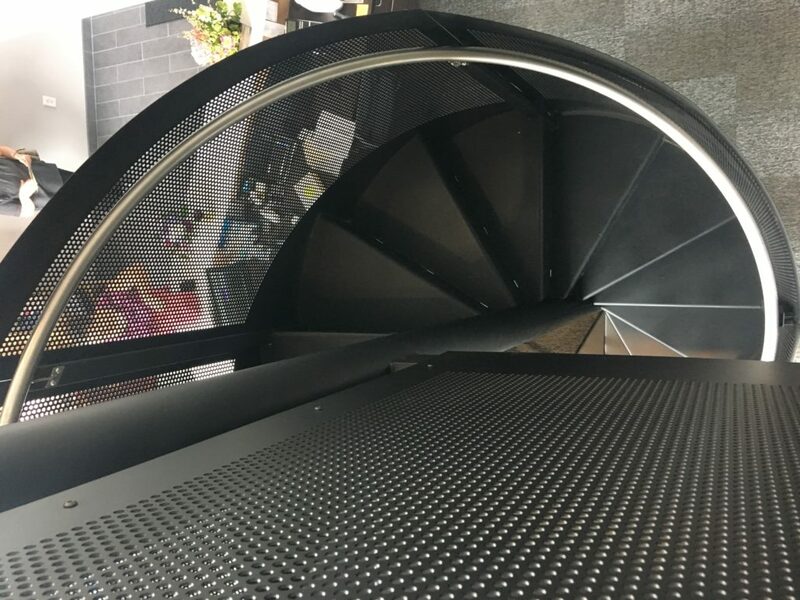 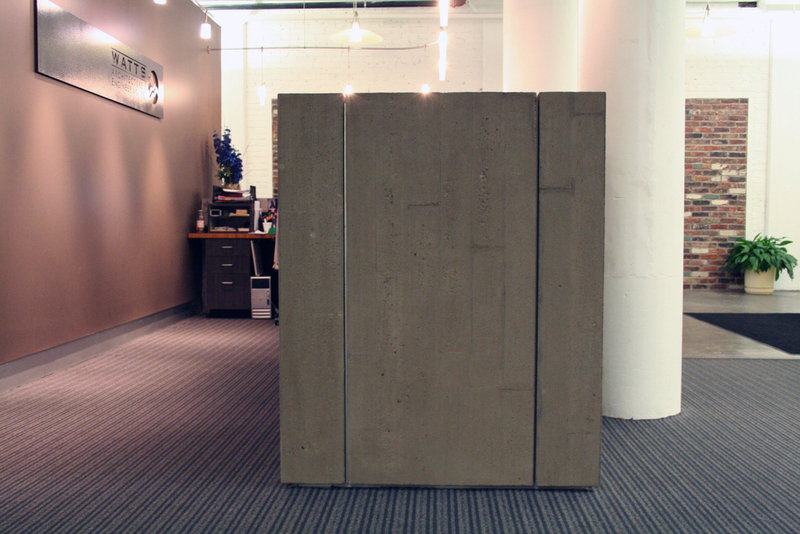 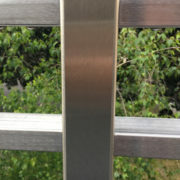 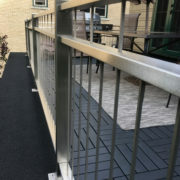 The design is completed with a brushed stainless steel foot rail along the bottom. 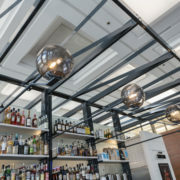 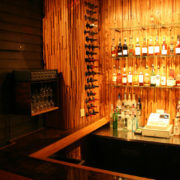 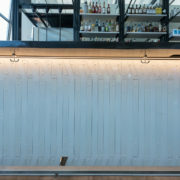 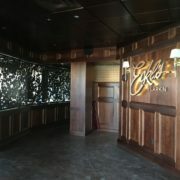 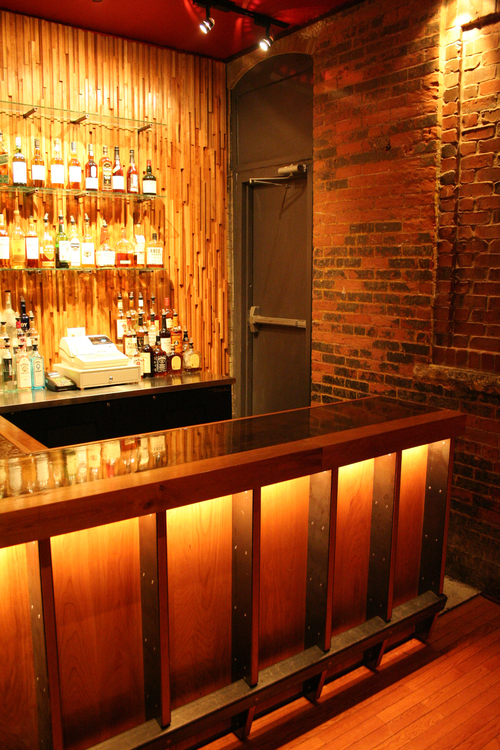 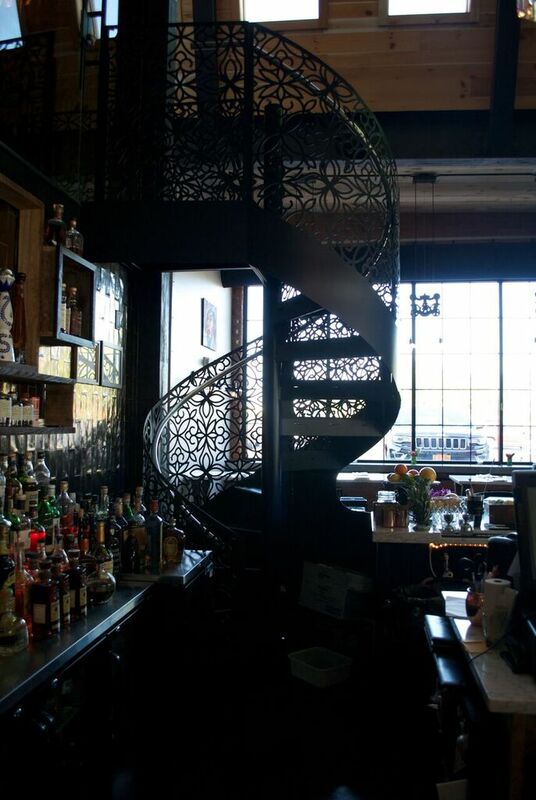 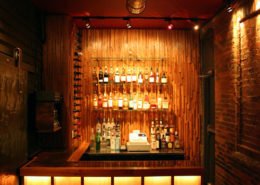 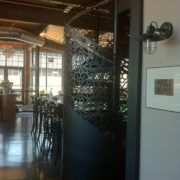 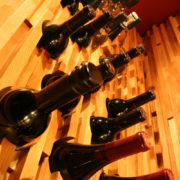 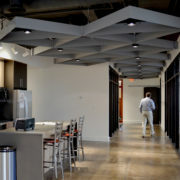 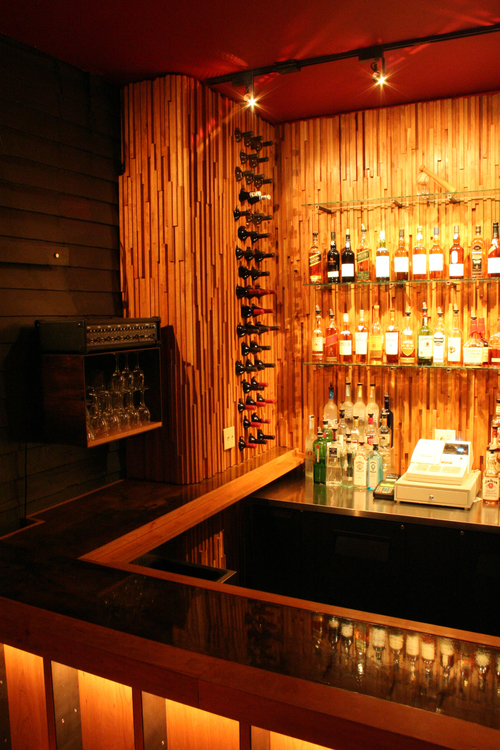 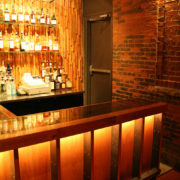 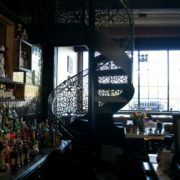 Light fixtures were designed and custom fabricated to position hand-blown glass shades directly above the bar surface. 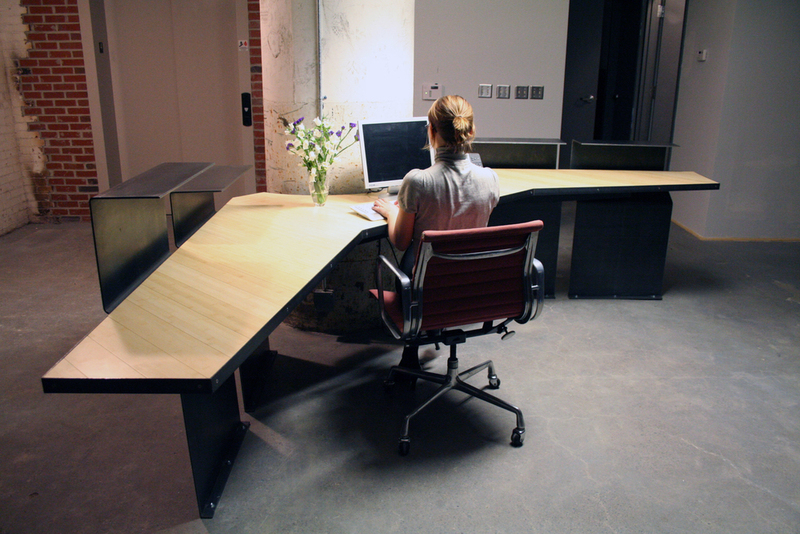 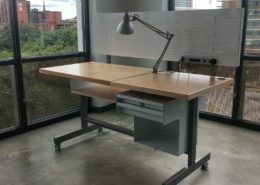 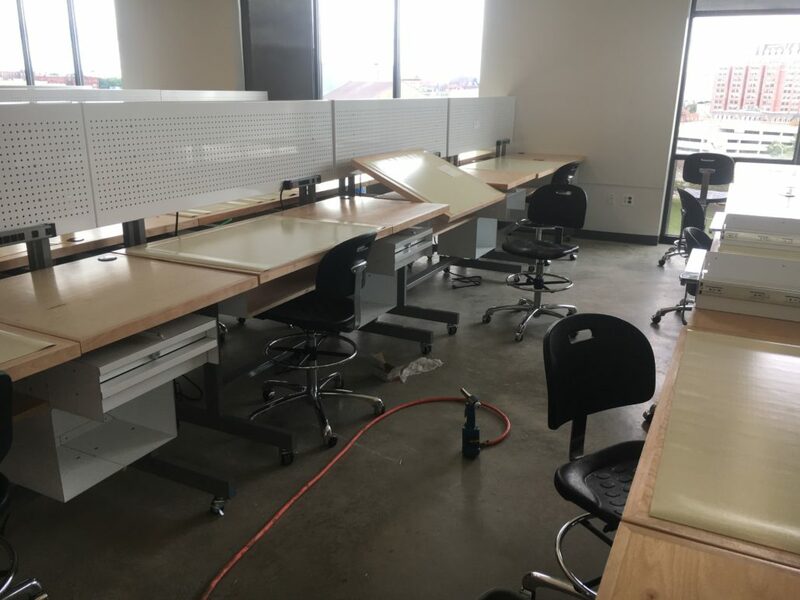 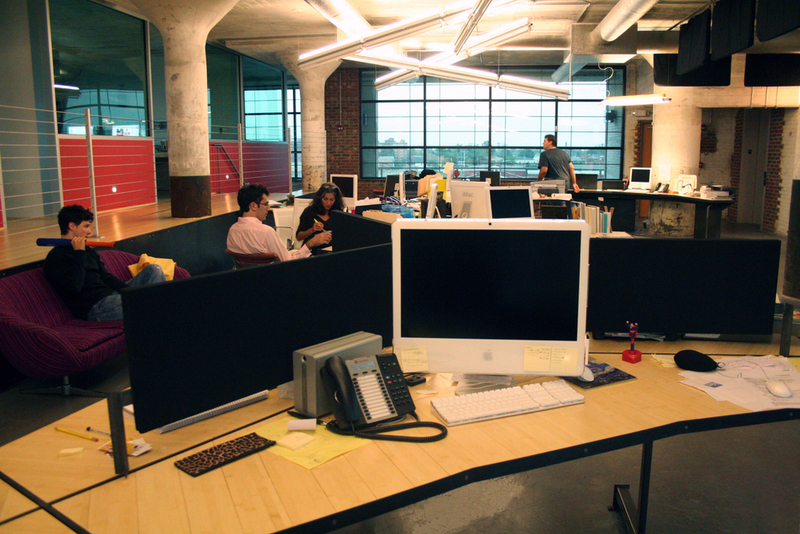 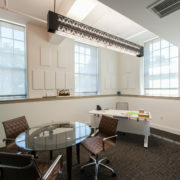 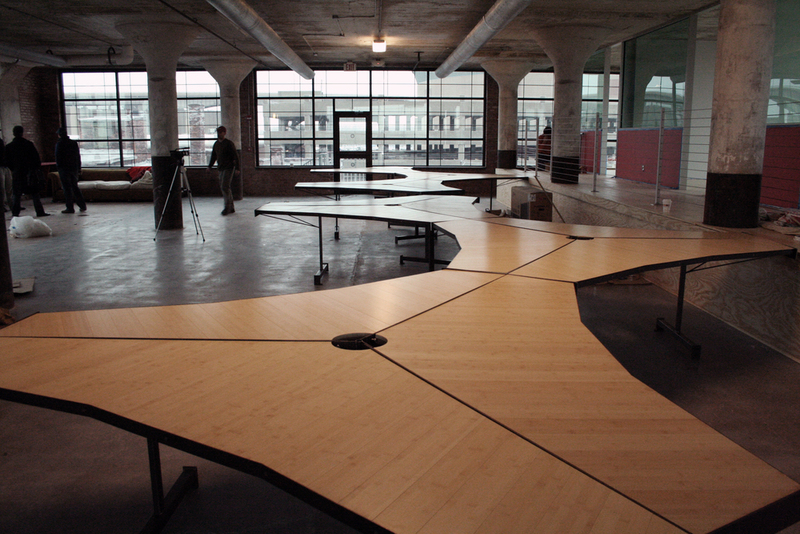 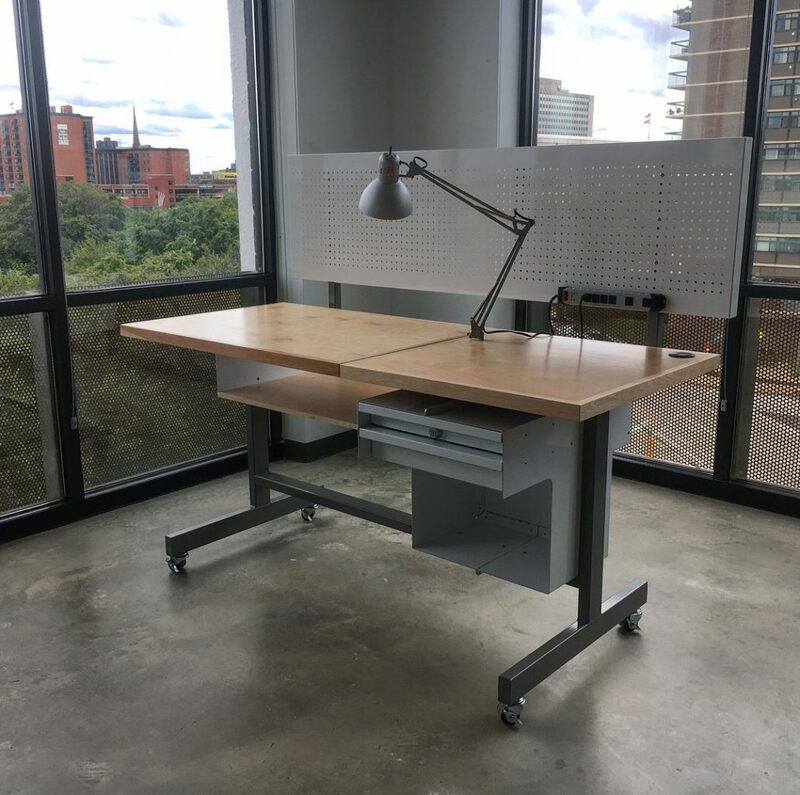 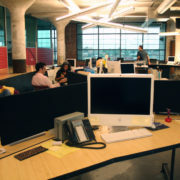 The drafting tables, designed for the Maryland Institute of Art, employ half-lap and slot-and-tab technology to facilitate the assembly process as well as the attachment, removal, and storage of the vertical component of the desks. 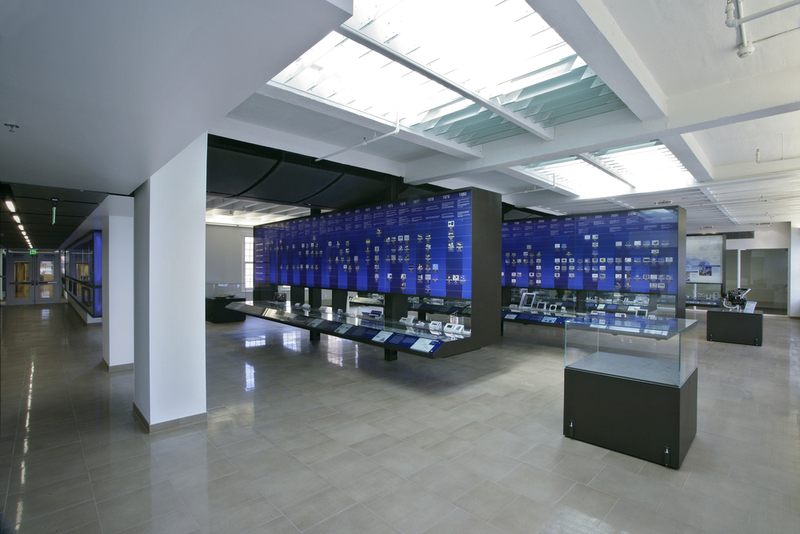 The Inamori Kyocera Museum of Fine Ceramics chronicles the history, in written, audio/visual, and object media, of the evolution of Ceramic Engineering from its pottery origins to its present day innovations. 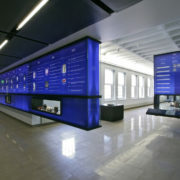 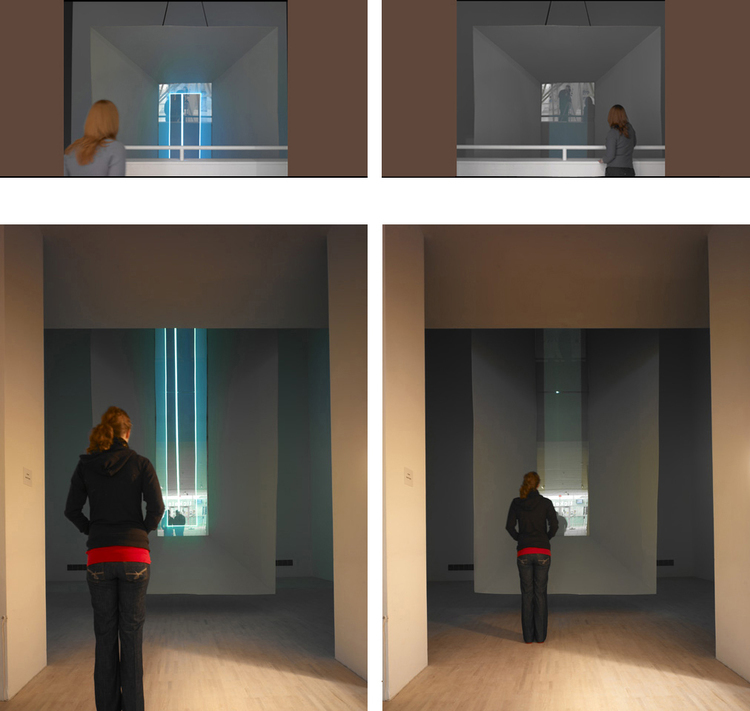 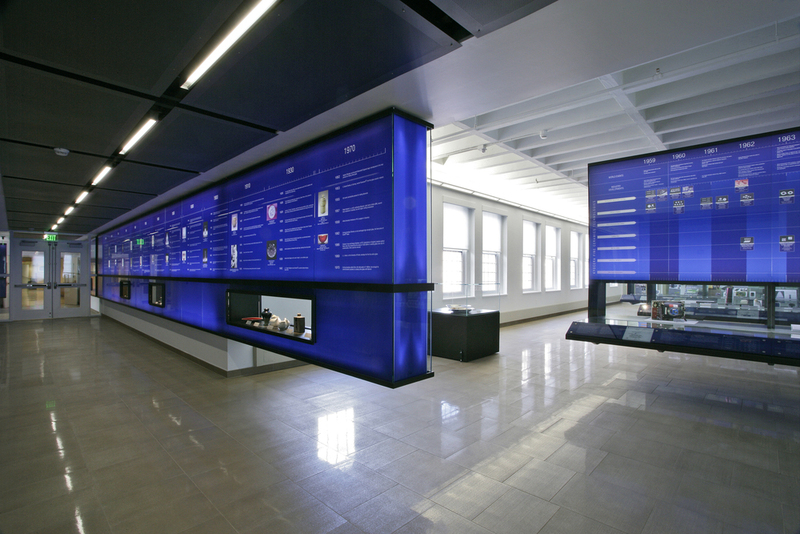 The evolutionary timeline moves through the space facilitated by a series of back lit wall mount, cantilevered, and rolling displays, which themselves exhibit a structural engineering feat by visually floating in the space. 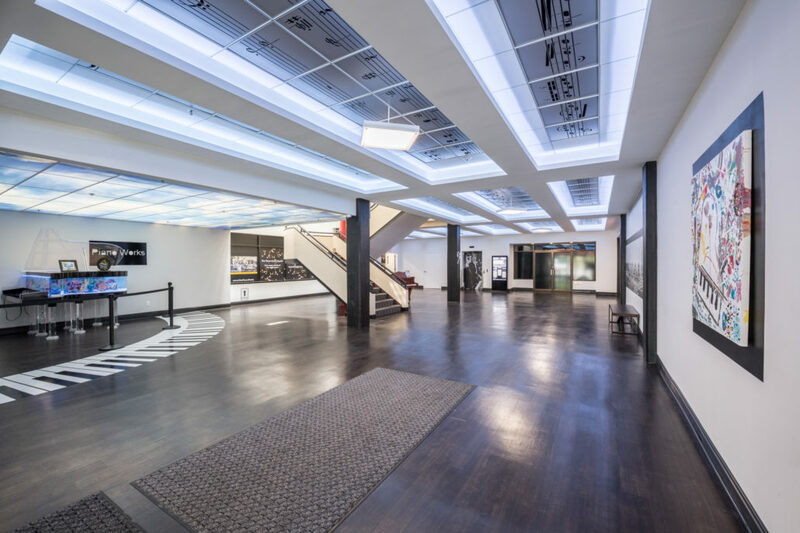 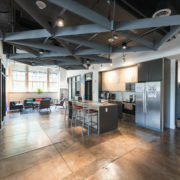 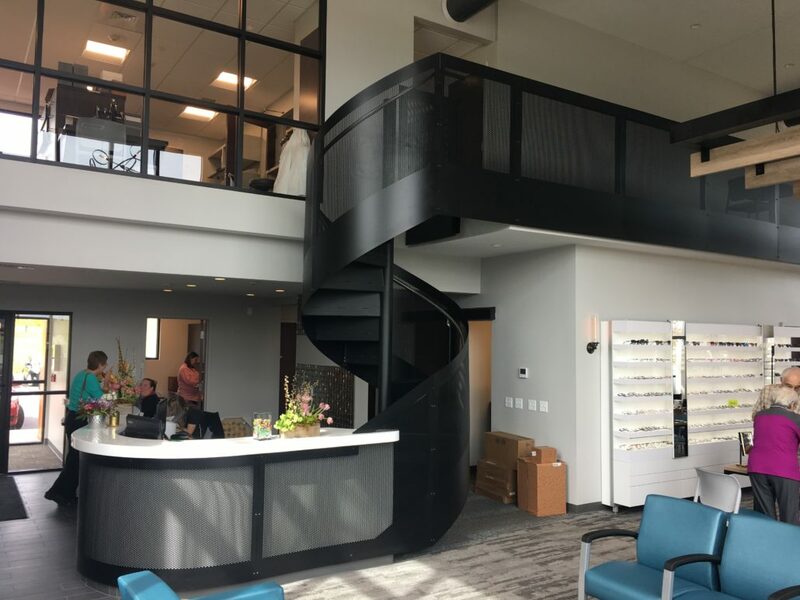 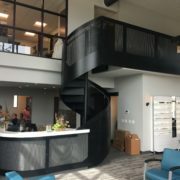 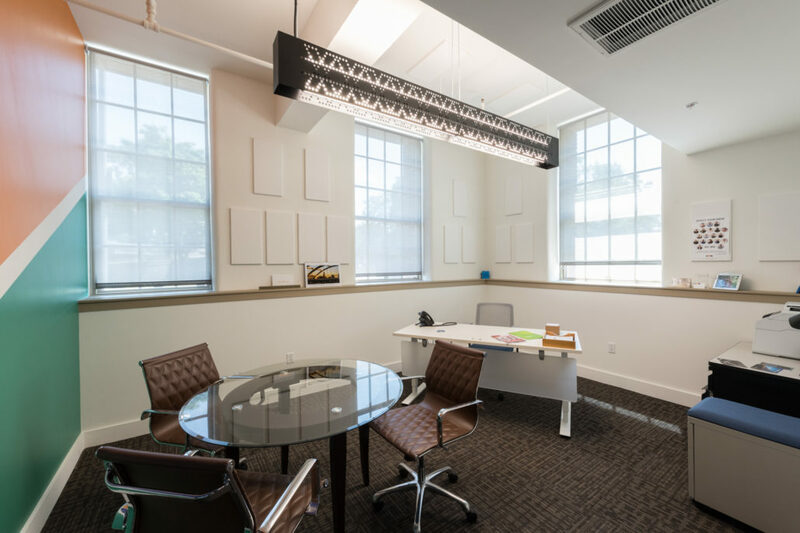 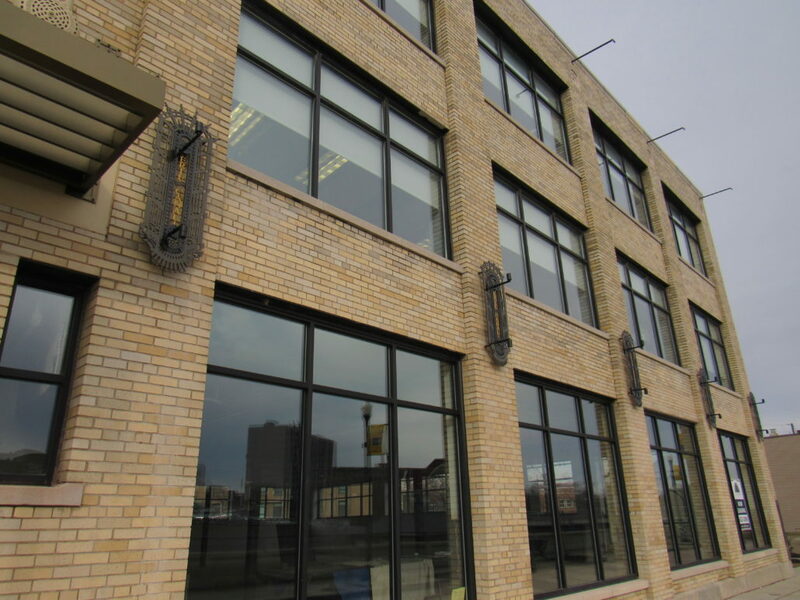 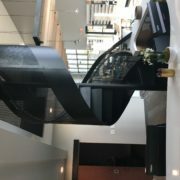 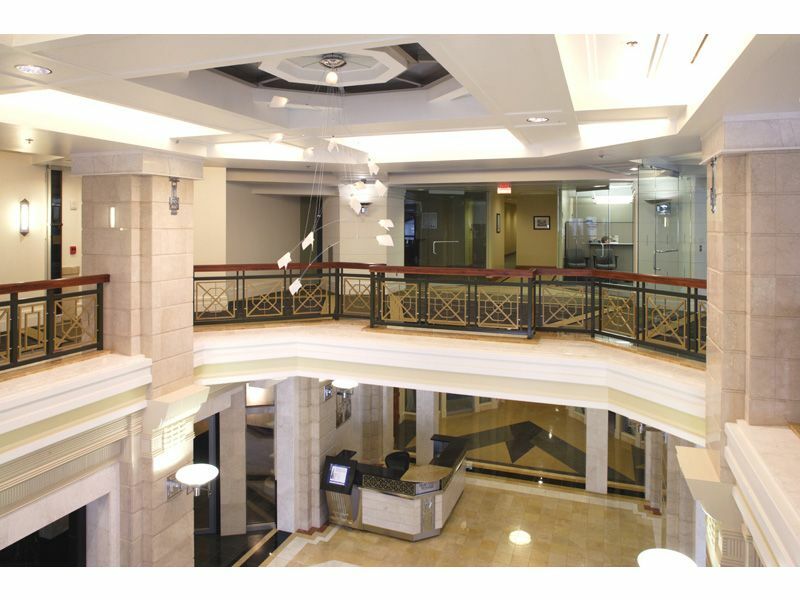 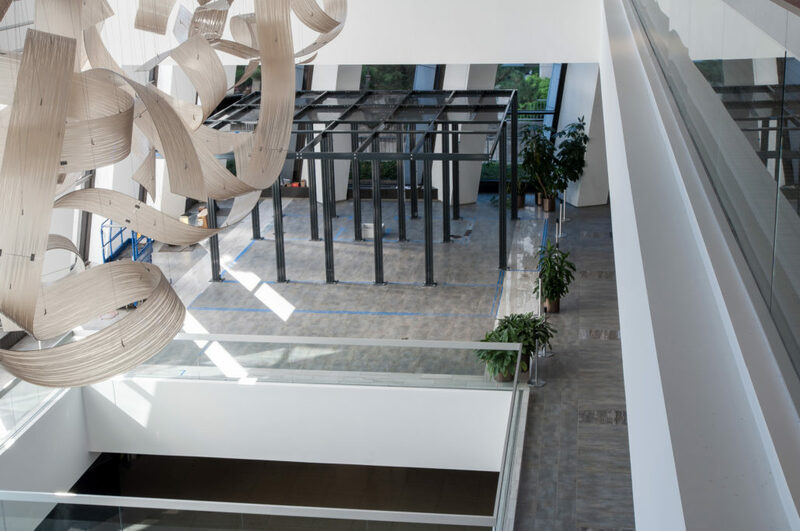 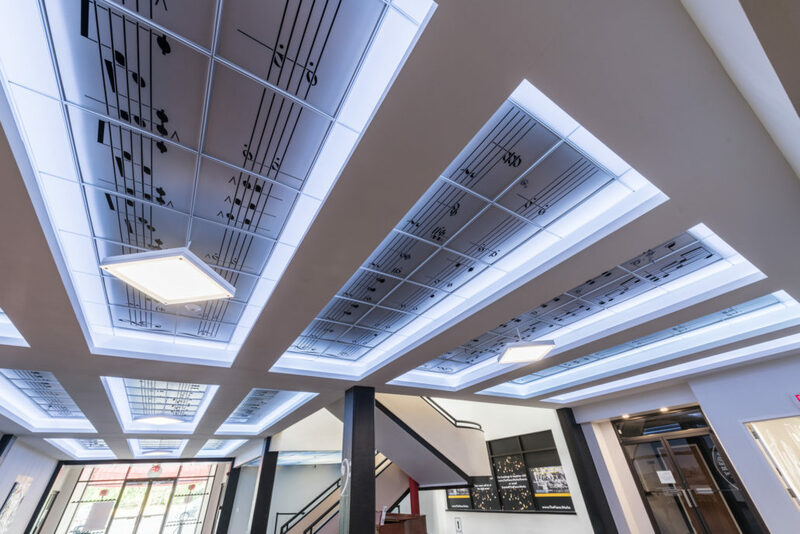 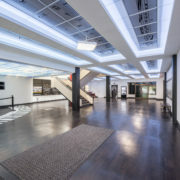 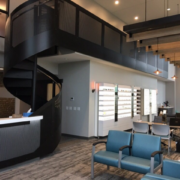 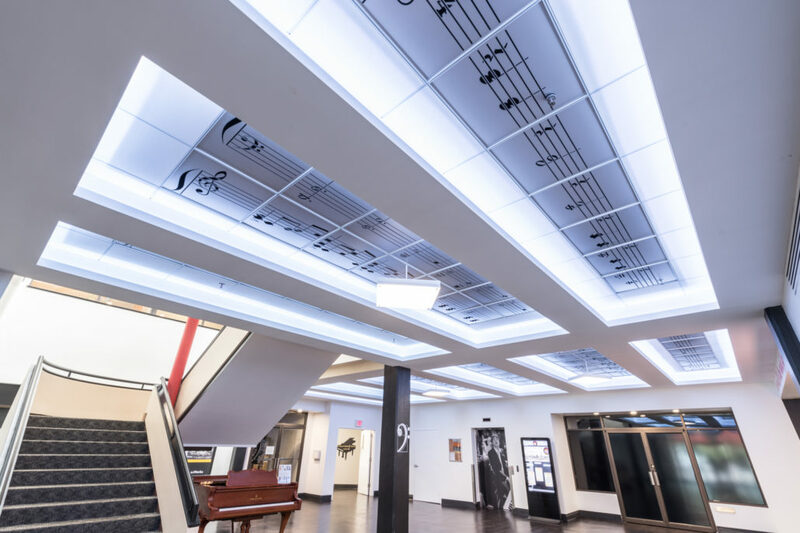 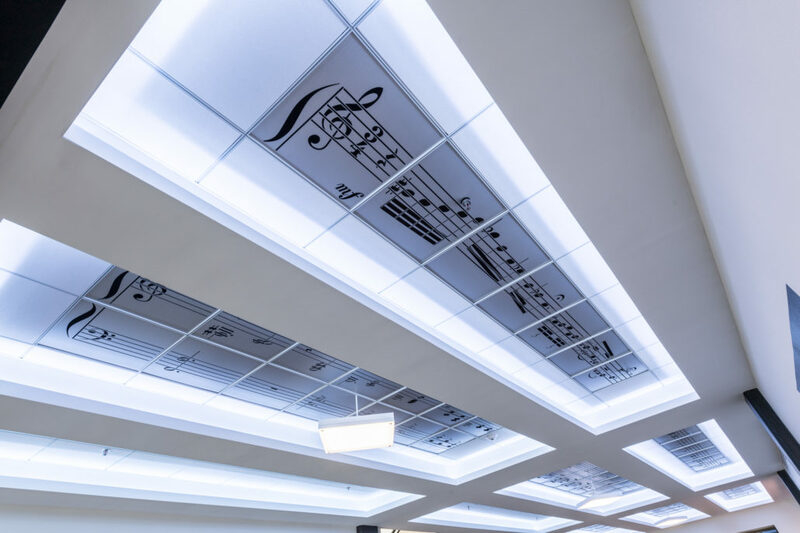 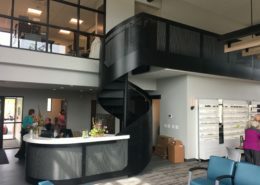 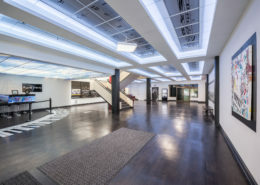 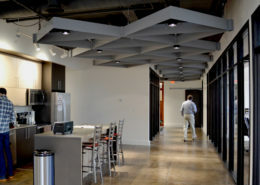 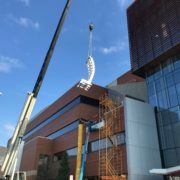 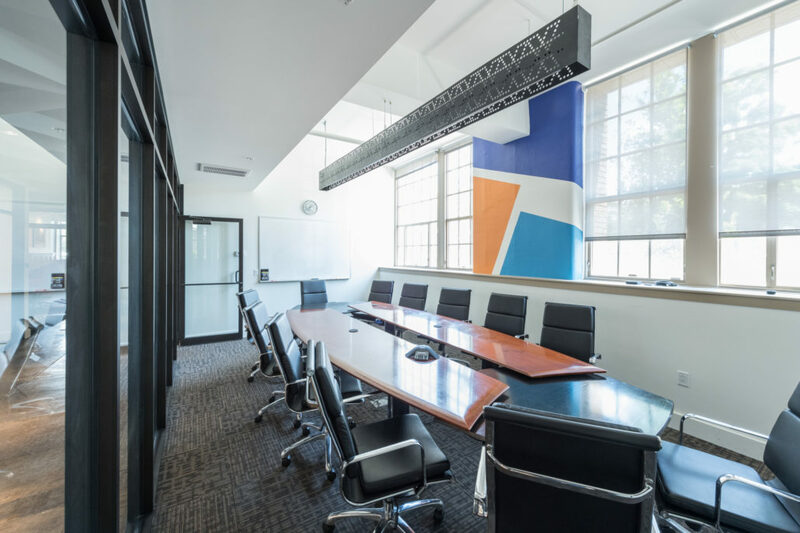 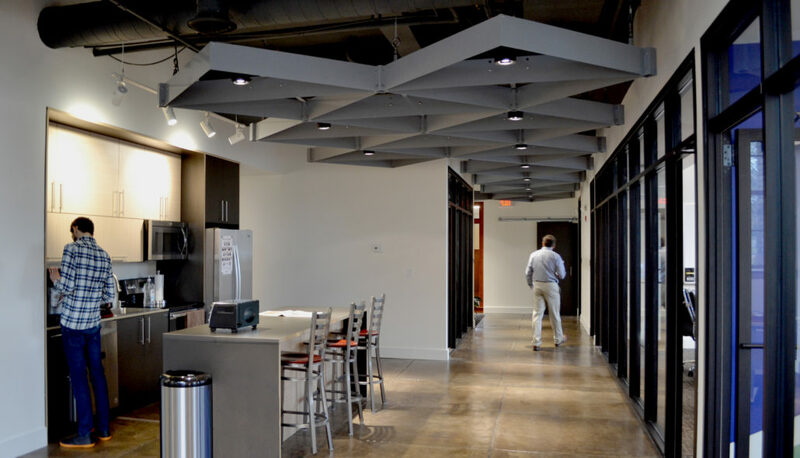 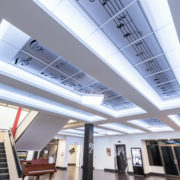 FDF, by coordinating all aspects of the project, from supplemental design to fabrication and installation, was able streamline the fabrication/installation process, keeping the project within budget. 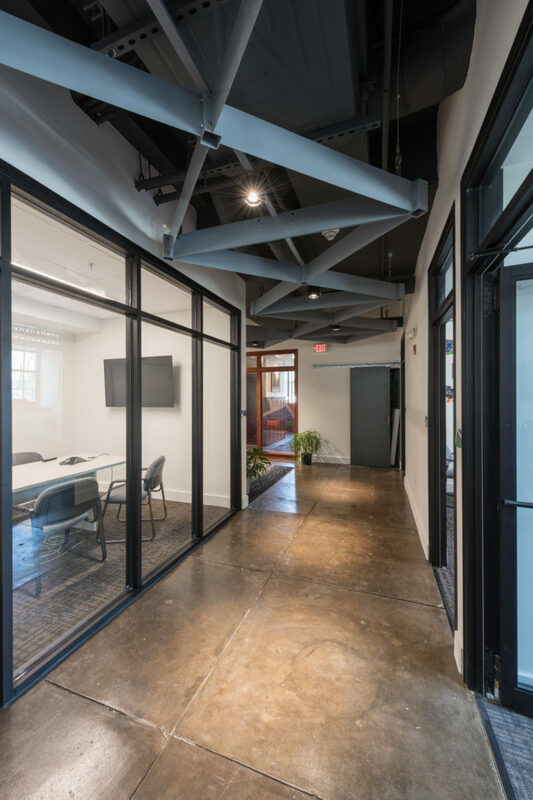 The working relationship between the architect and FDF provided for timely and efficient design solutions responding to the complex structural issues that arose without compromising the spirit of the overall design. 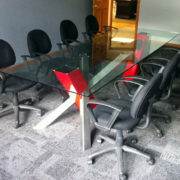 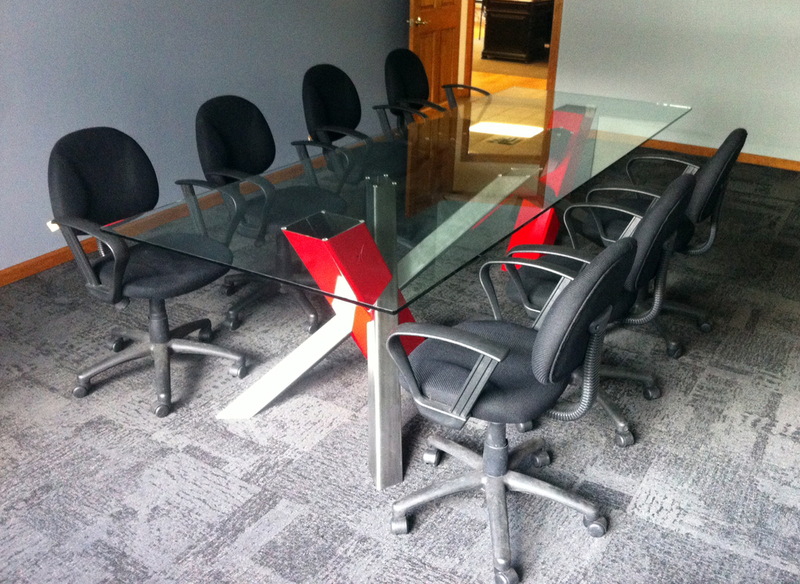 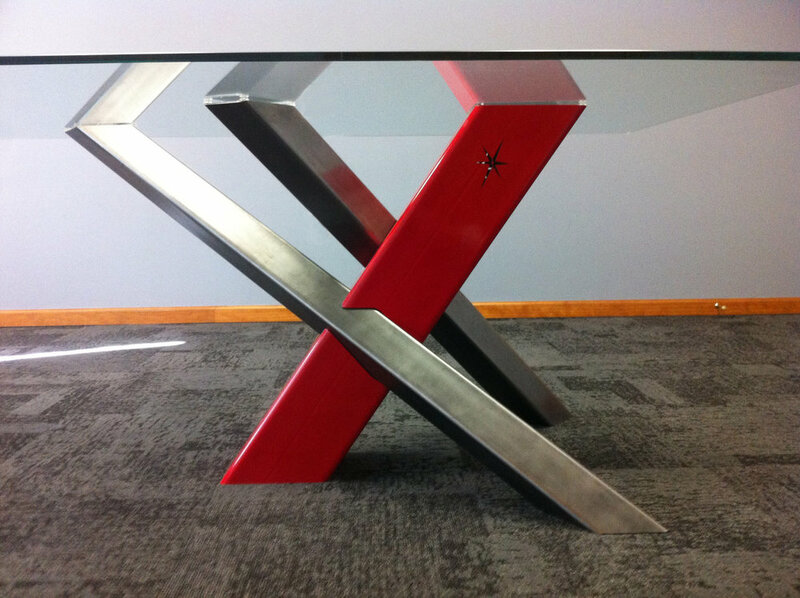 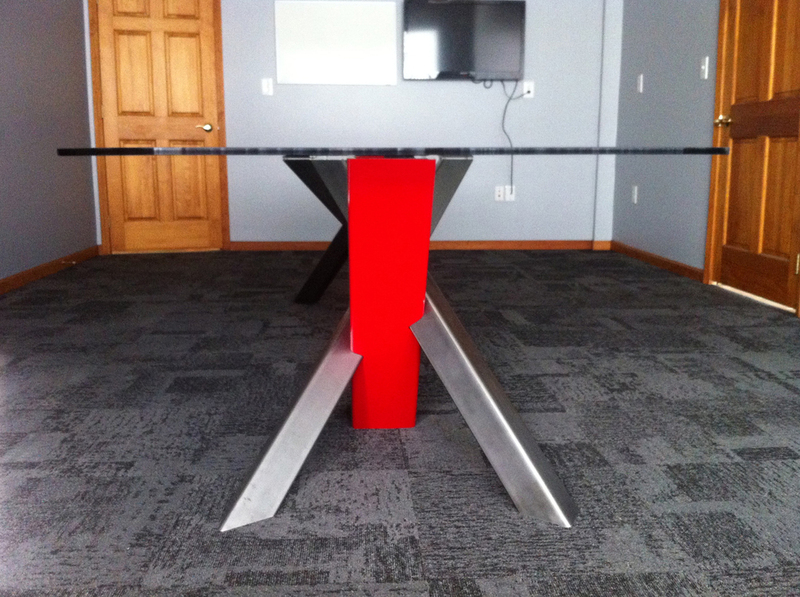 Commissioned by Custom Laser Inc, the conference table is designed to showcase and compliment their recent acquisition of a 5-axis tube laser cutting machine. 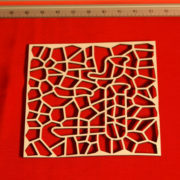 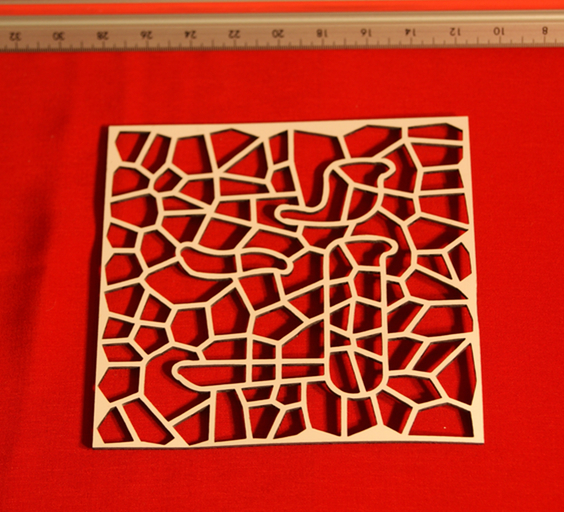 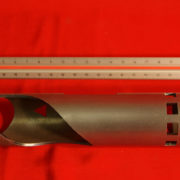 employ of the 5-axis laser cutter. 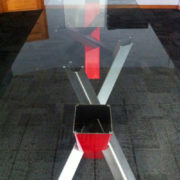 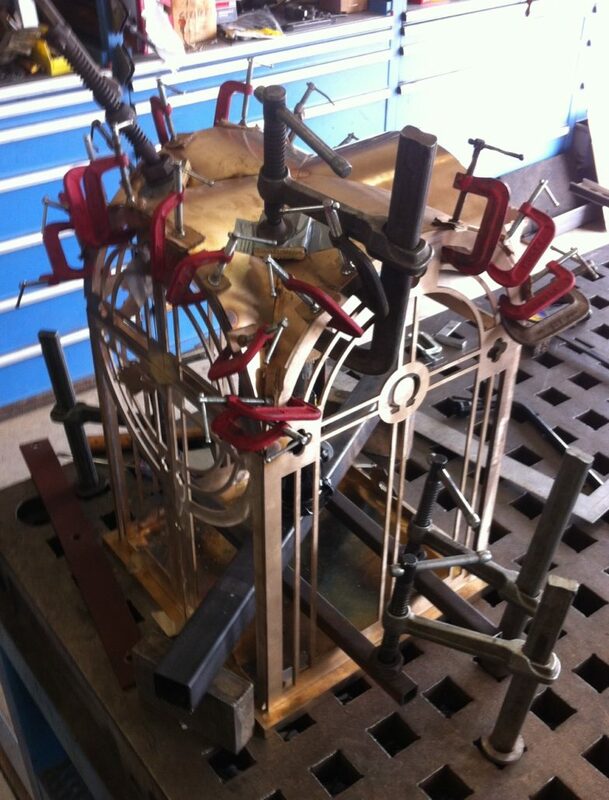 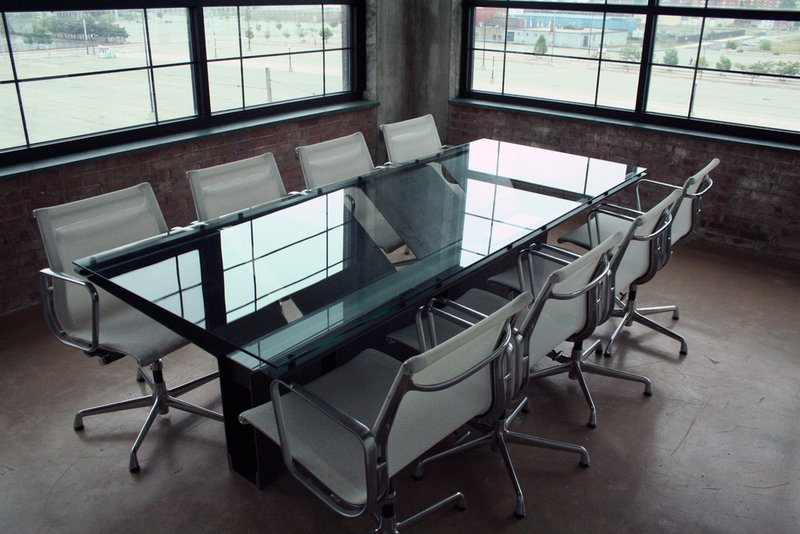 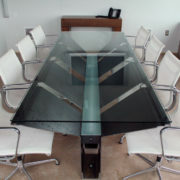 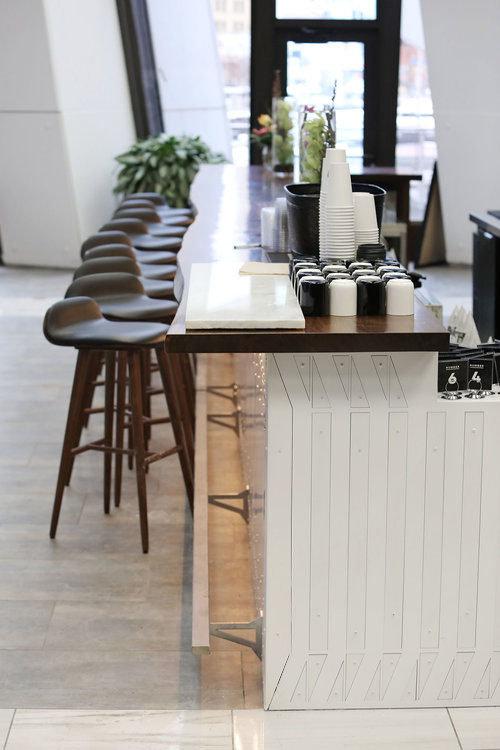 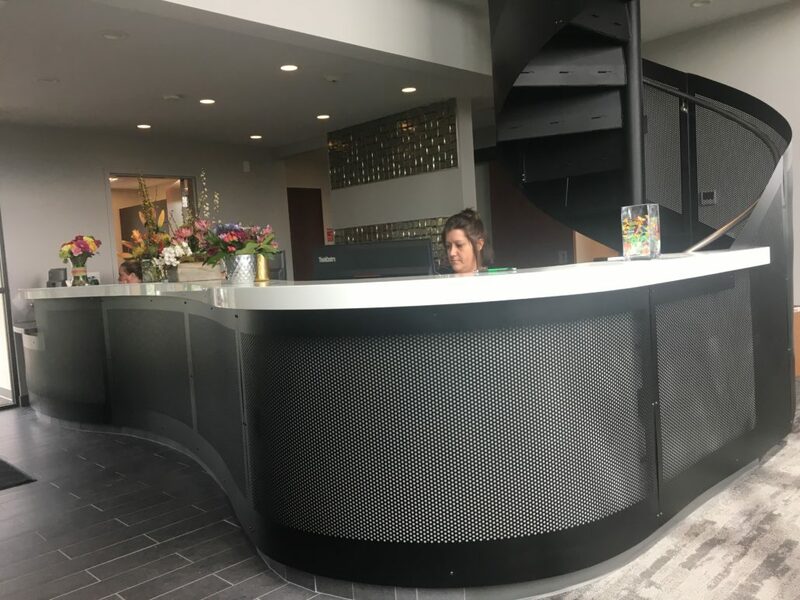 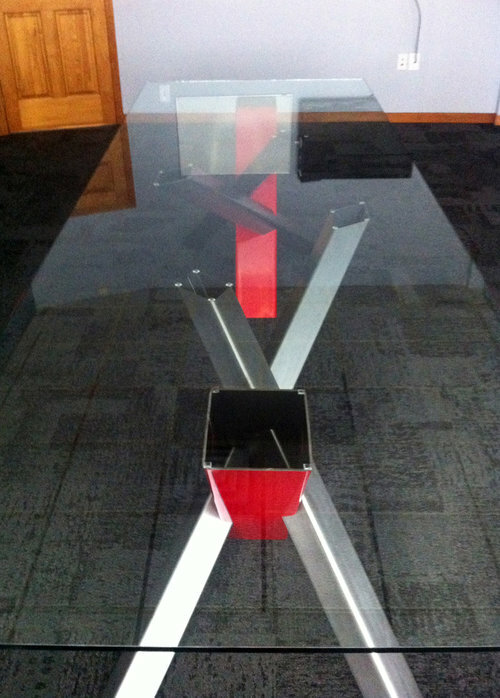 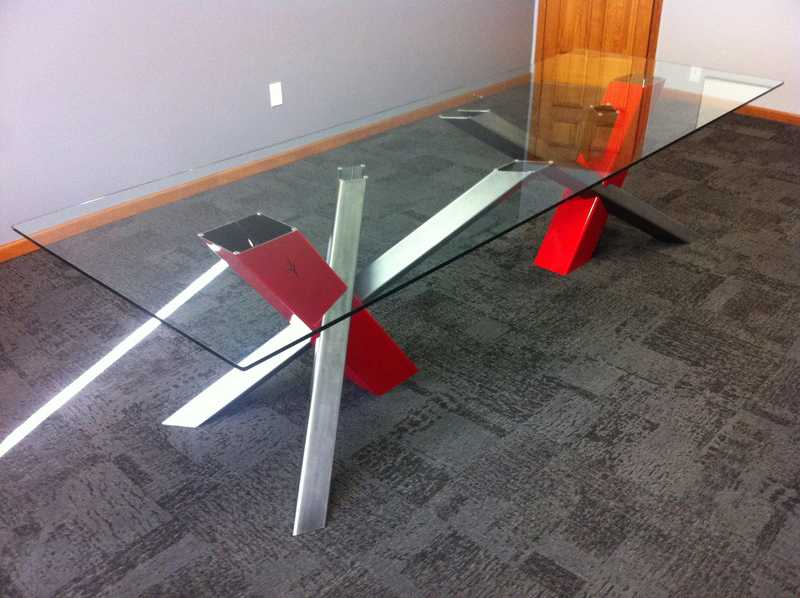 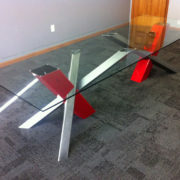 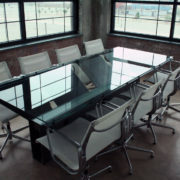 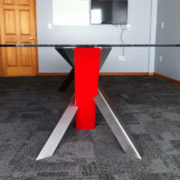 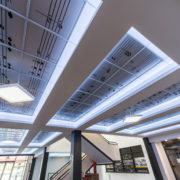 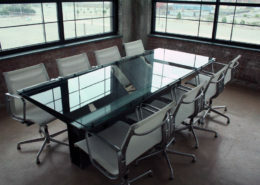 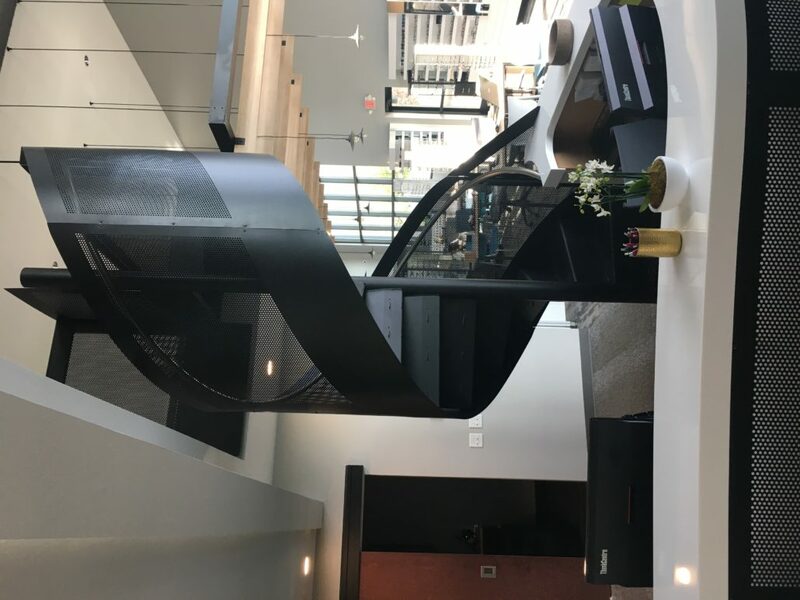 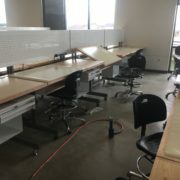 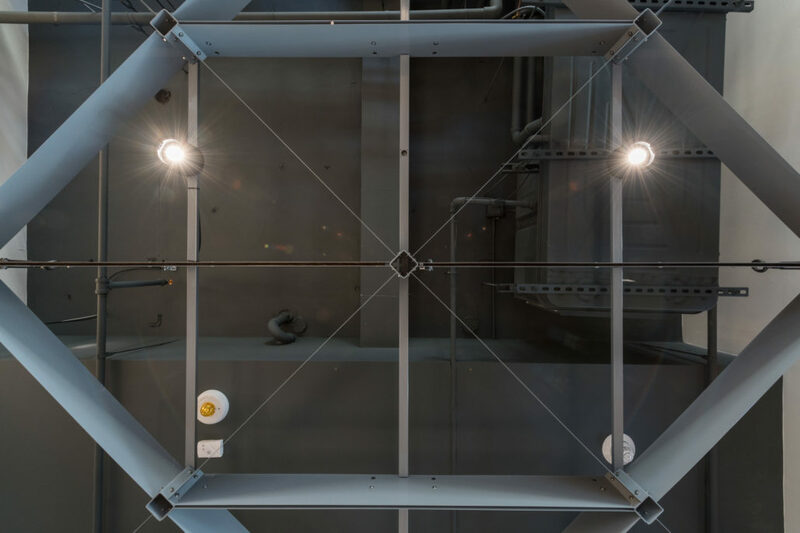 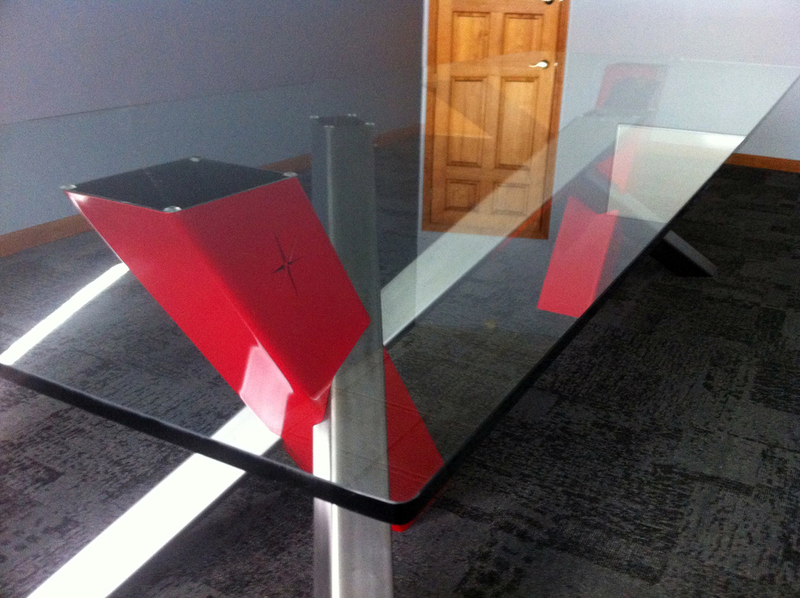 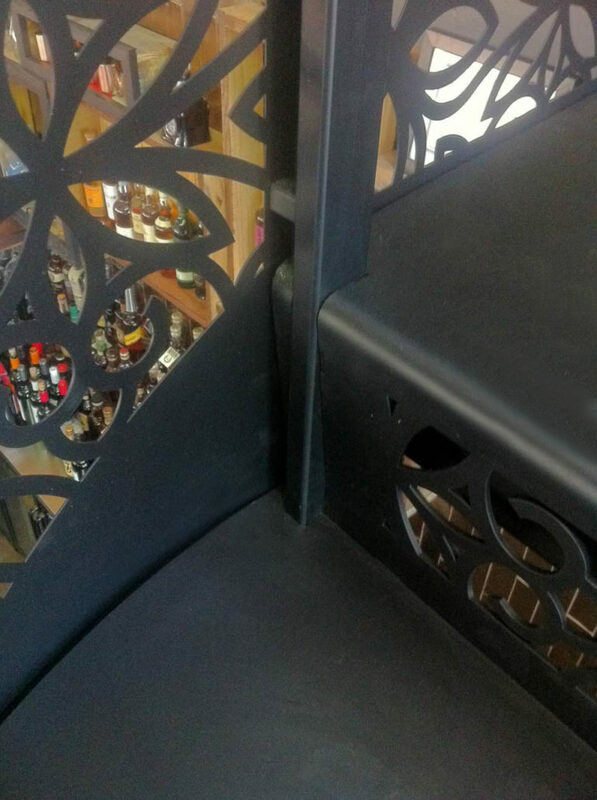 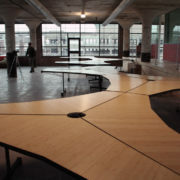 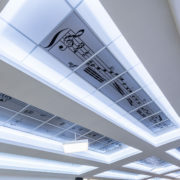 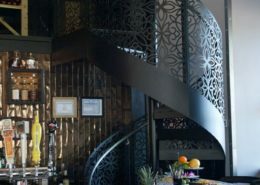 Without the use of mechanical or weld connections, the table base components rely on gravity (specifically the weight of the glass top), friction, and accuracy of laser cuts for its structural stability. 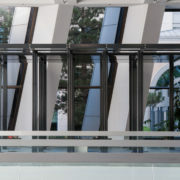 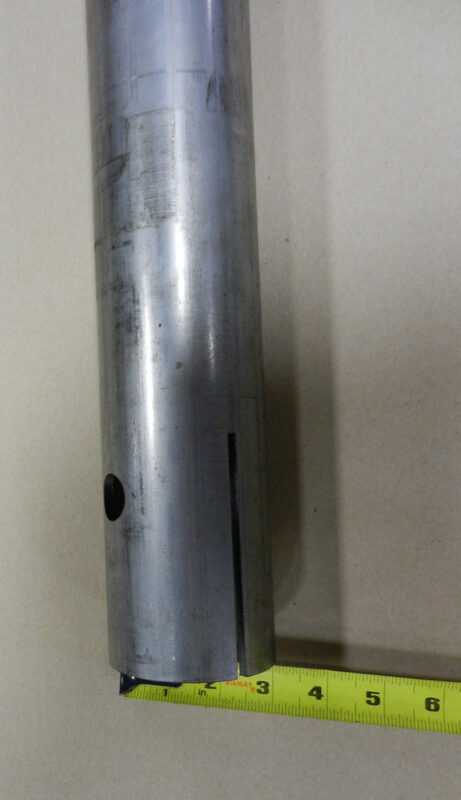 The ends of the larger tube components are left open to exhibit the interaction between themselves and the smaller tube legs revealing a simplicity of design and construction. 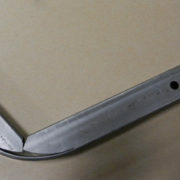 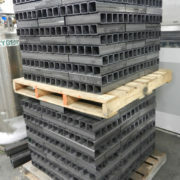 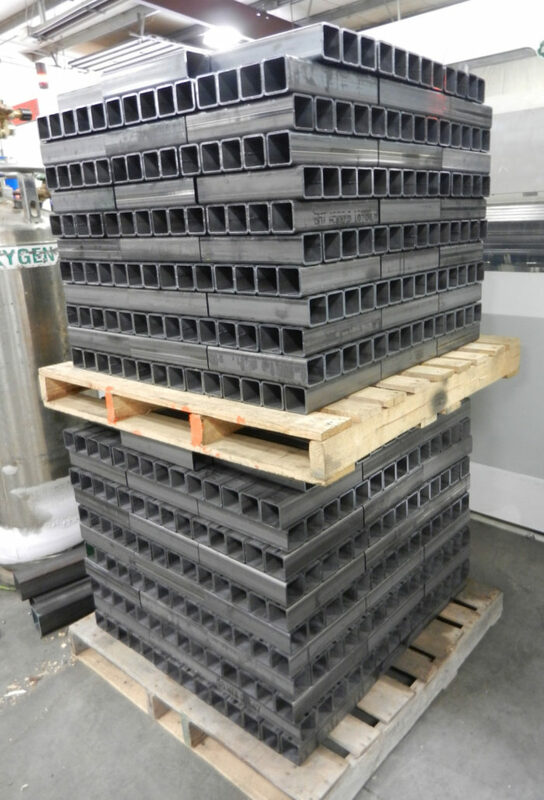 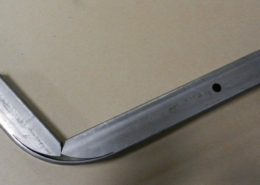 The base is composed of 7″ and 3-1/2″ square tubing with 3/16″ wall thicknesses. 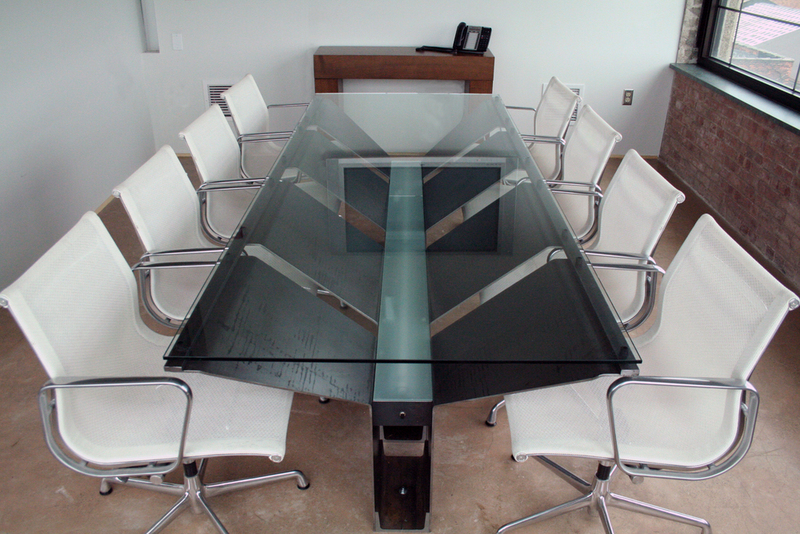 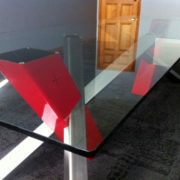 1/2″ tempered glass completes the construction. 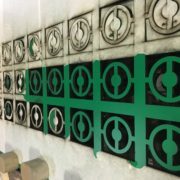 Our Tube Cutting Lasers provide the technology necessary for the processing of round, square, rectangular, and flat-sided oval tubing. 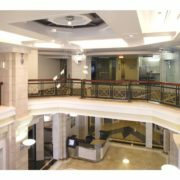 Its functionality allows us the ability to produce products customized to your specifications; limited only by your imagination. 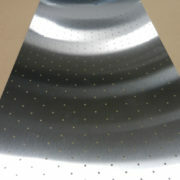 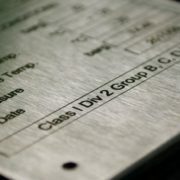 Our lasers quickly and accurately mark a wide range of products from key fobs to medical devices to bar coded labels. 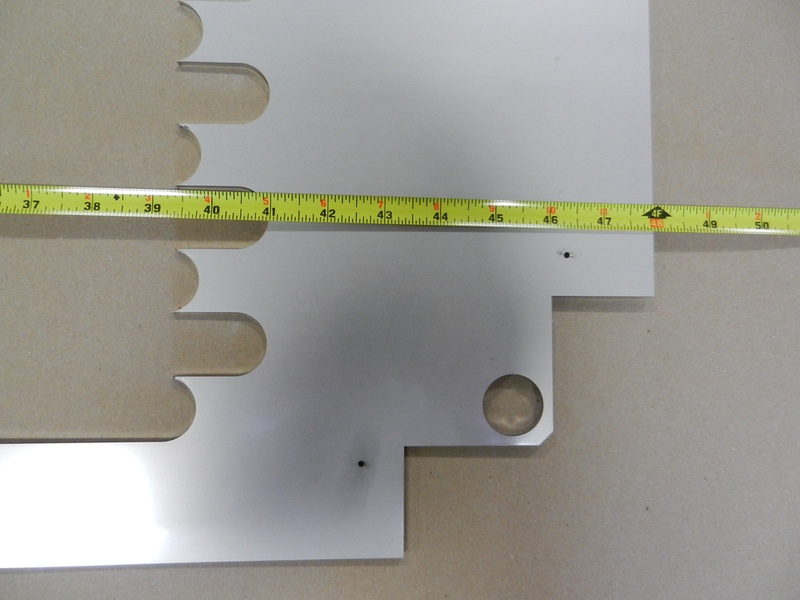 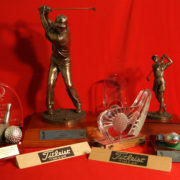 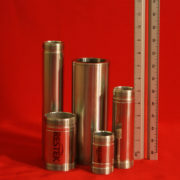 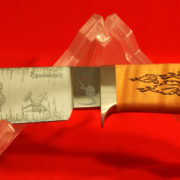 We have in-house graphic capabilities and an experienced staff to handle your laser marking orders. 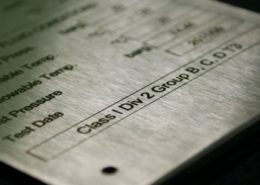 In addition to our marking capabilities, our laser engraving systems are driven by computer graphics and capable of artwork scanning. 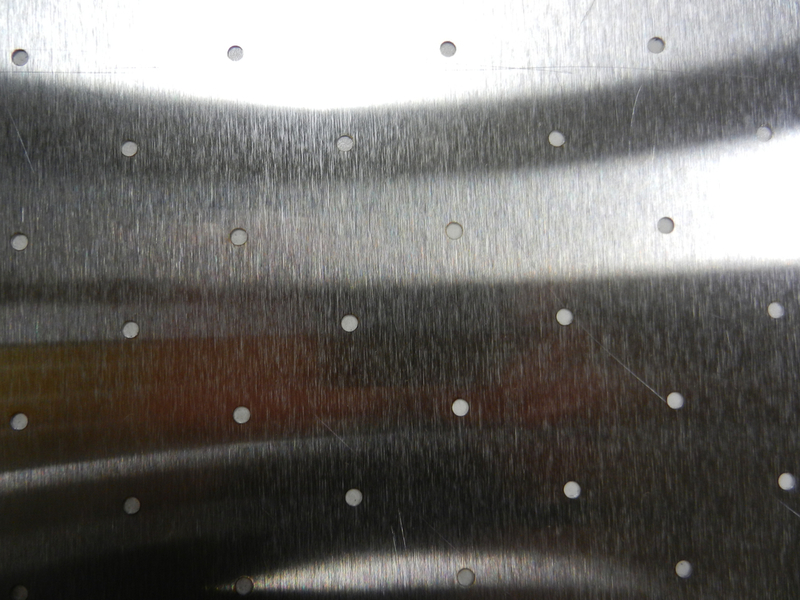 The depth of engraving can reach up to 3/16″! 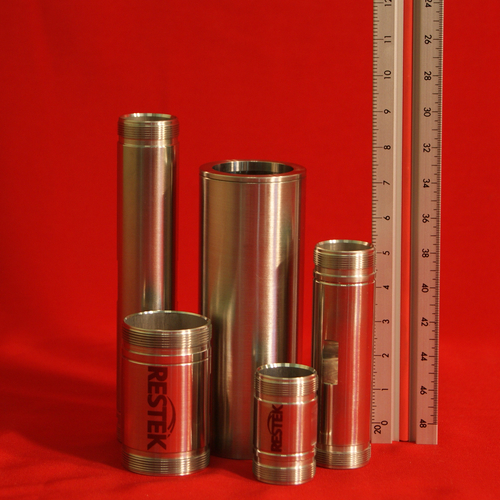 With the capabilities of in-house tooling and graphics throughput is reduced. 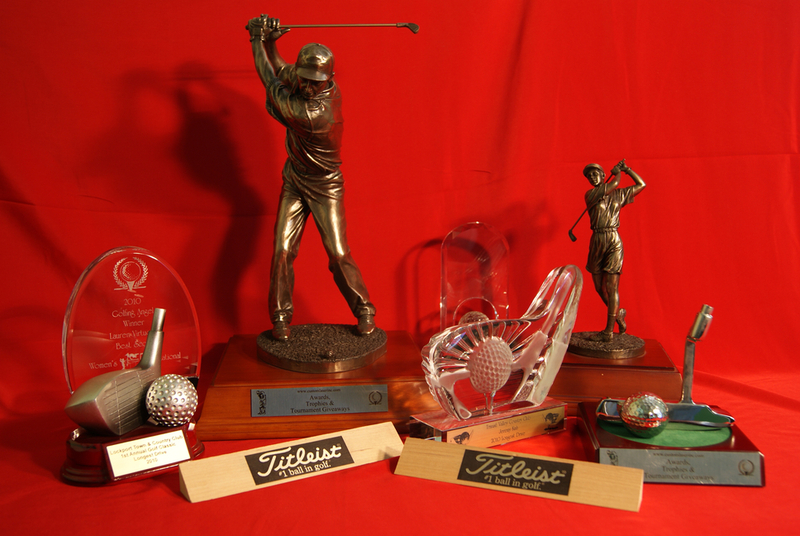 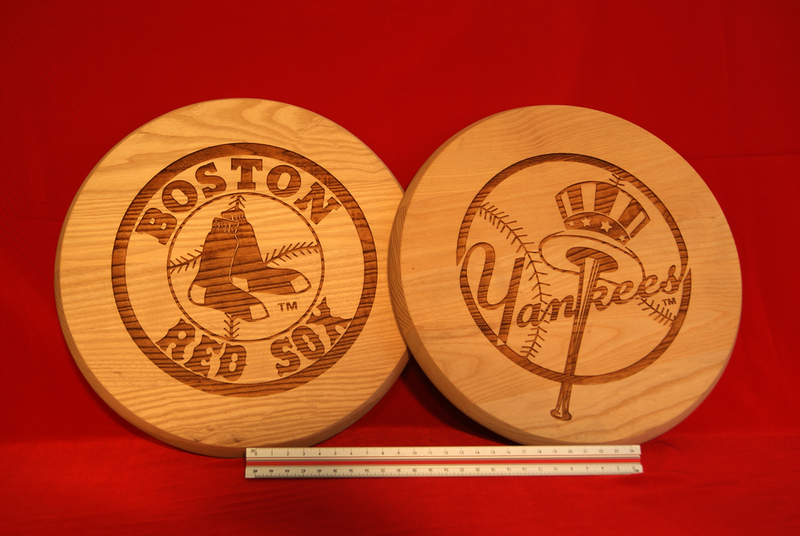 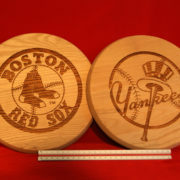 Our laser engravers provide reliability as well as volume capacity and a quick turnaround.